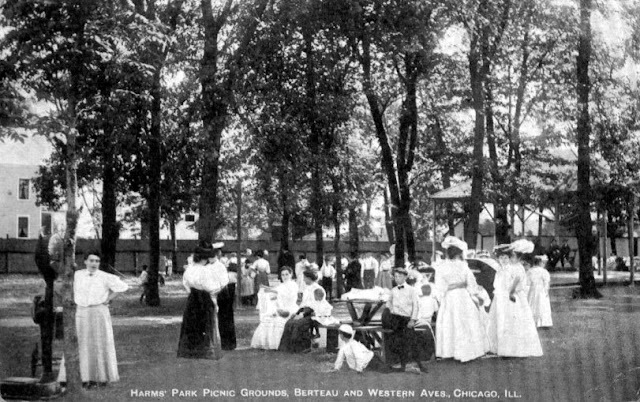 One of the largest groups of migrations to the City of Chicago in the mid to late 19th century were the Germans of Europe. 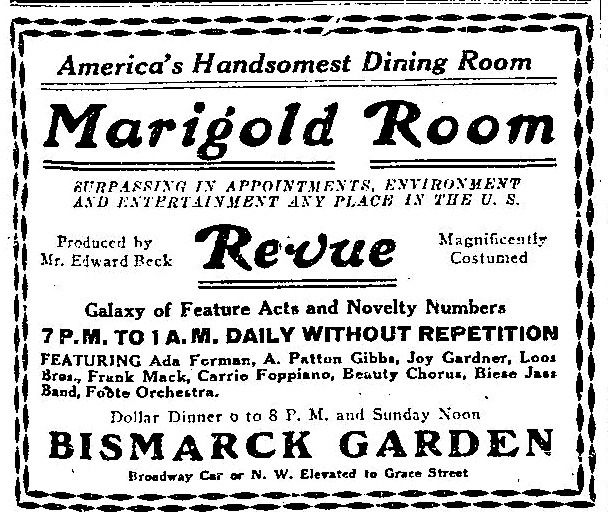 By 1890 one third of all the saloon-keepers were of German ancestry. 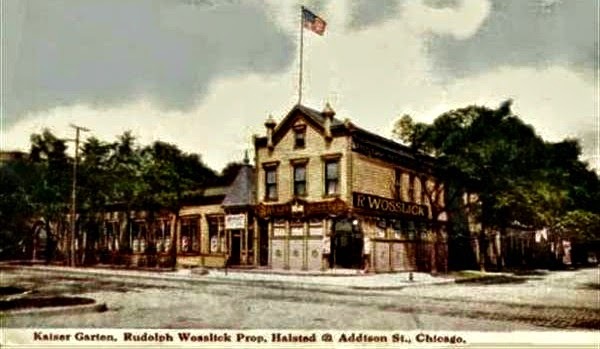 According the publication Hidden History of Ravenswood & Lake View by Patrick Butler, "where in 1914 one-third of Chicago's 600,000 Germans - most of them living in Lake View area - signed a resolution pledging Austrian Emperor Franz Joesph and Germany's Kaiser Wilhelm 'our unchangeable love of the home and Fatherland'." 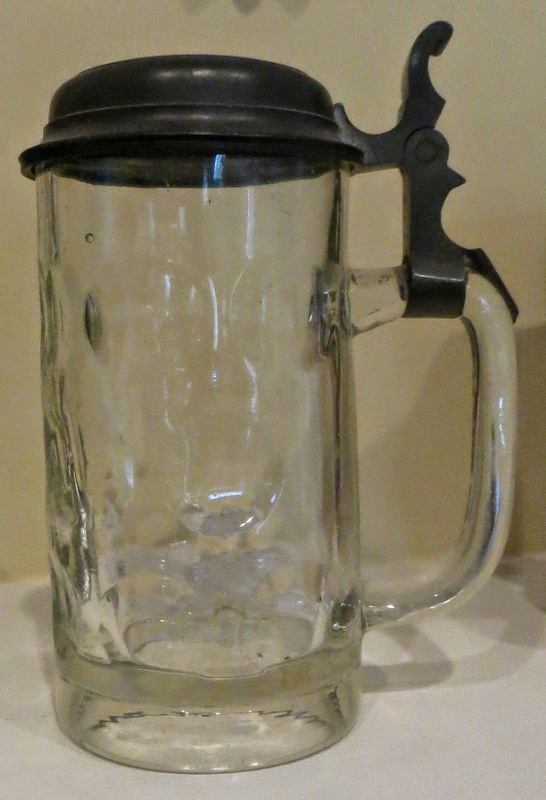 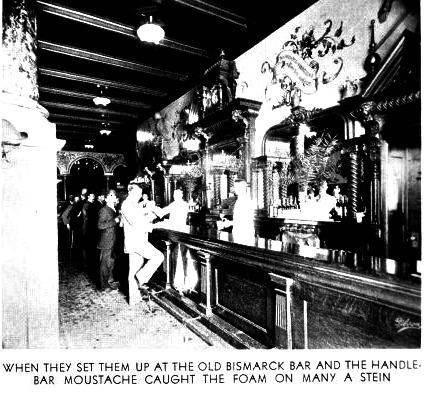 Before World War I naturalist patriotism and beer was complimentary for the Germans who among others, liked to be social and loved to 'get their drink on'! 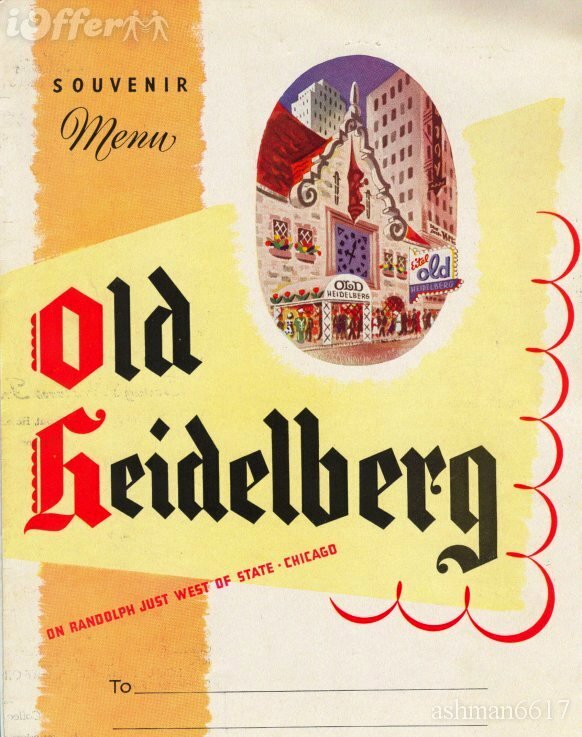 From the city's beginnings beer and Chicago are nearly synonymous. In fact, two taverns were among the first businesses in the city. 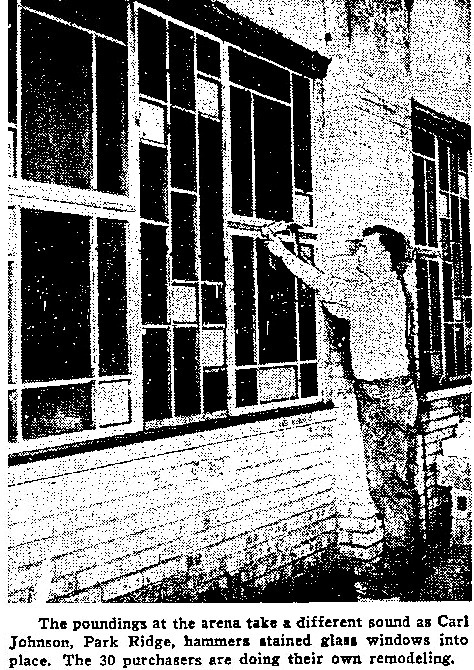 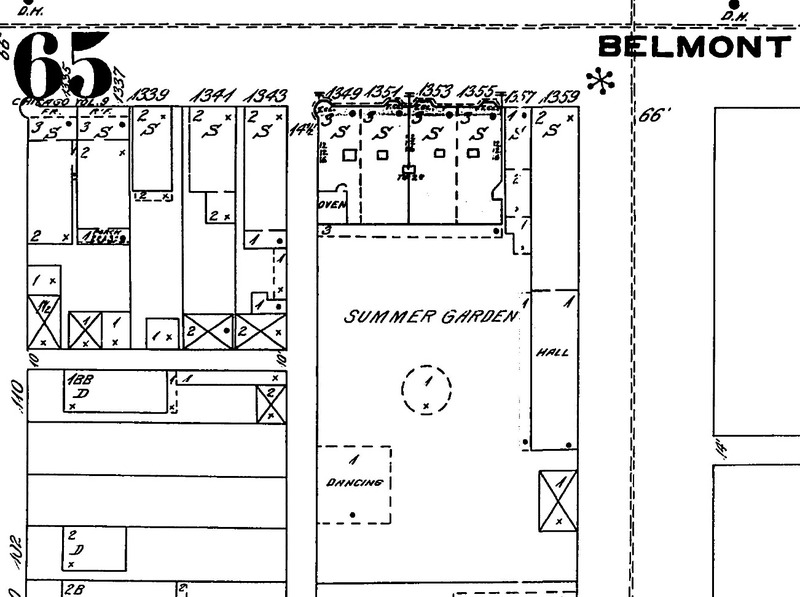 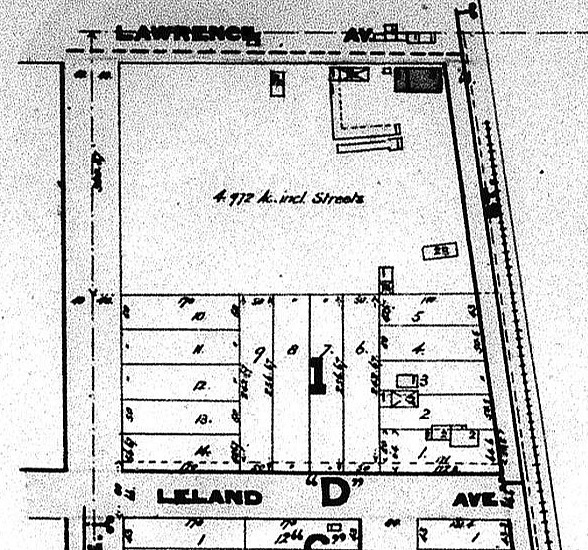 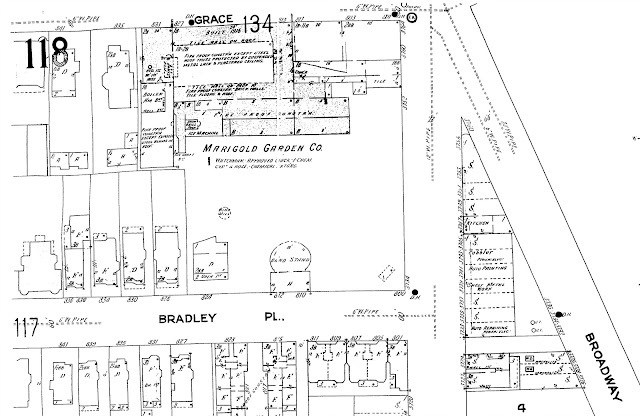 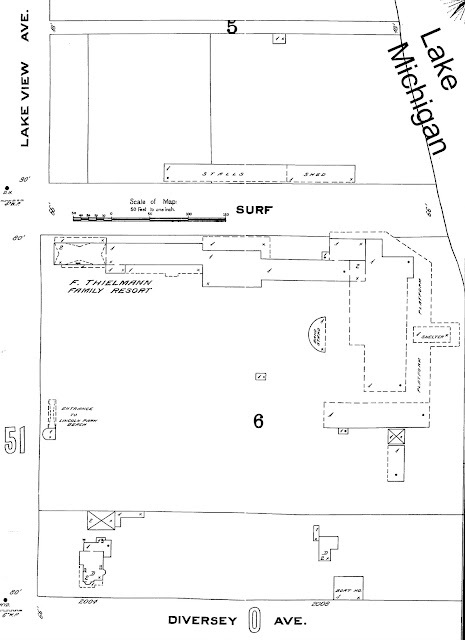 In time most of the breweries built in the city were located on the north side near the border with Lake View township because brewers discovered that area topography was most favorable to building cool, underground 'aging rooms' conditions most suitable within a commercial buildings' basement. 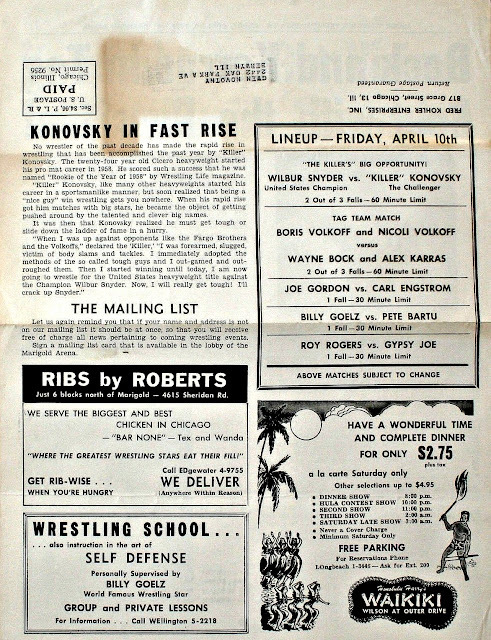 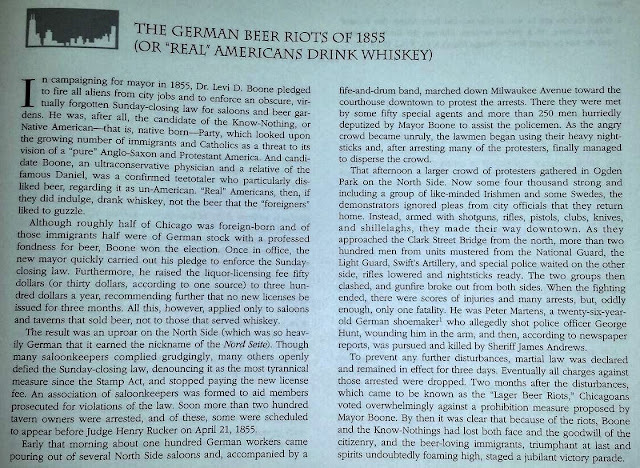 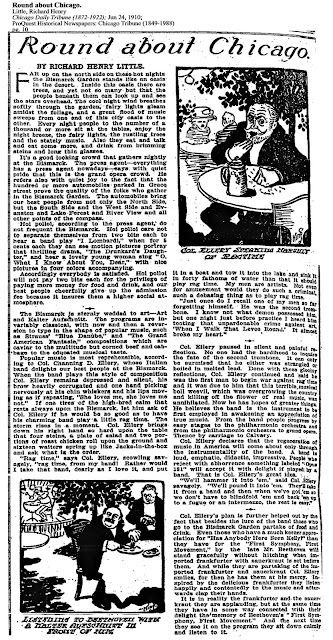 The event in this article from the publication called Lake View Saga 1847-1985 posted below, while located in the City of Chicago, does tell a tale of the popularity of beer to an important social group in the city having ripple affect in neighboring townships and communities around Chicago. 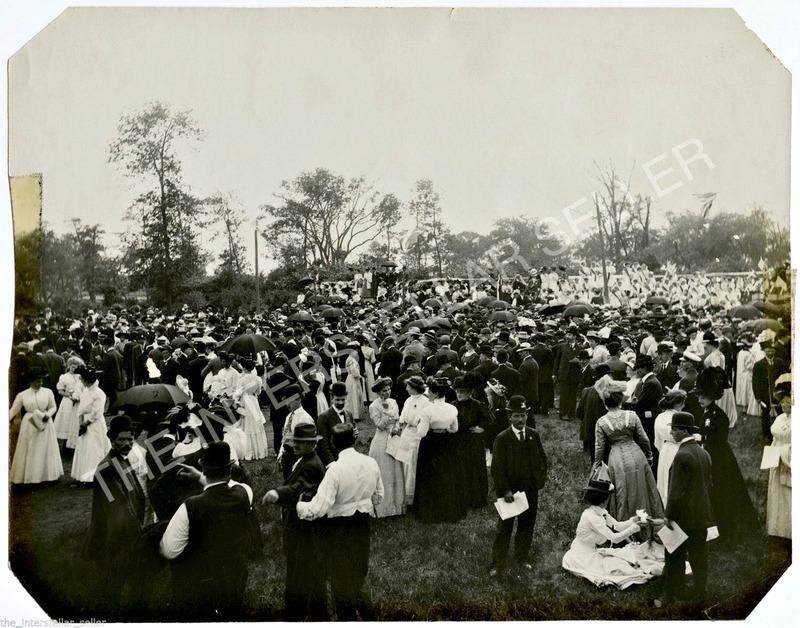 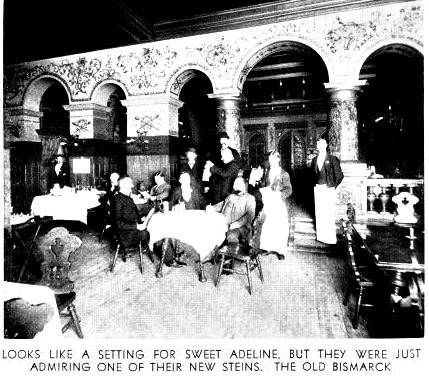 The ethnic Germans of the old Lake View (1857-1889) and the visiting residents of Chicago liked to be social and loved to get their drink on! 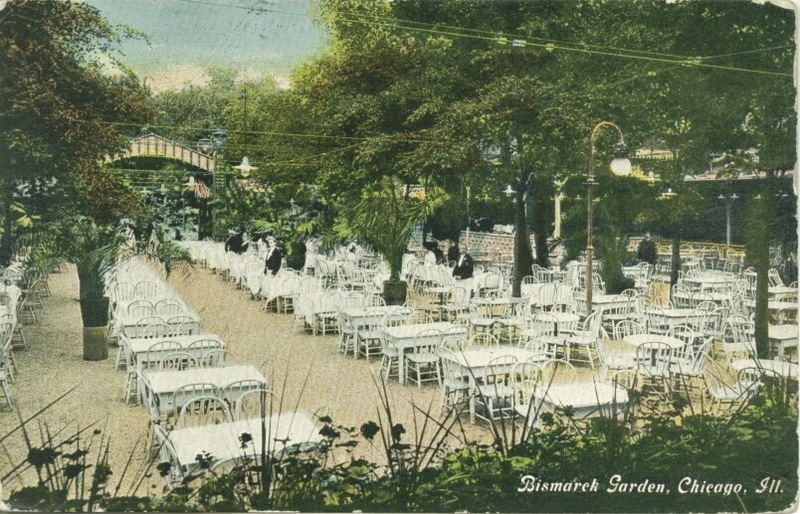 One in particular popular place to do just that was the Bismarck Gardens. 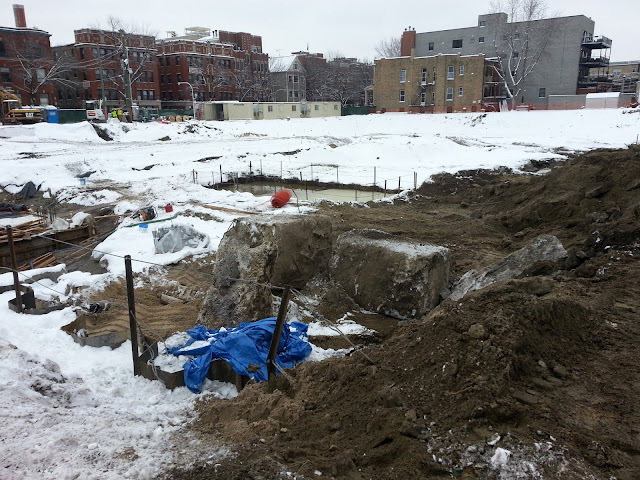 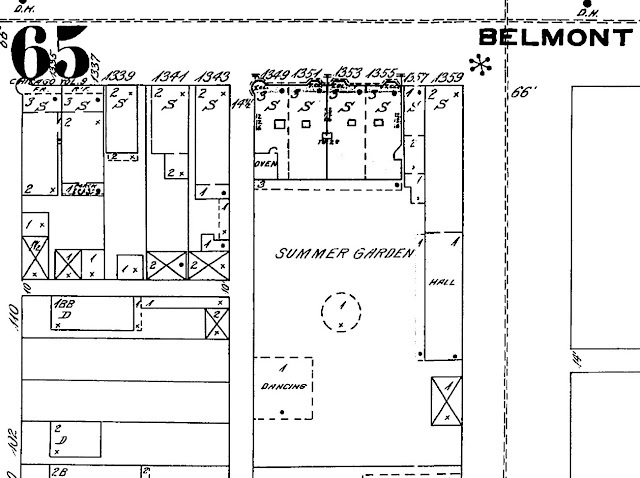 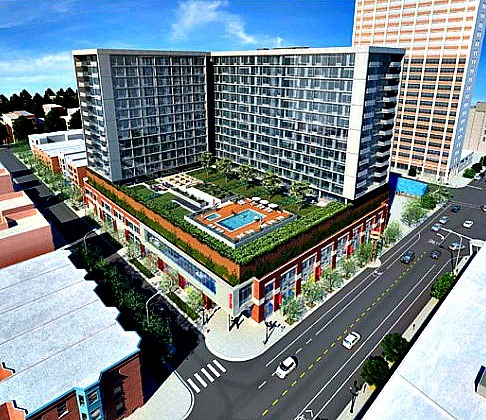 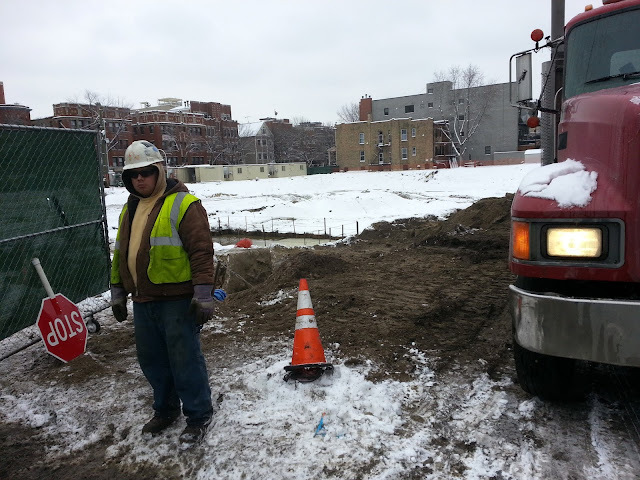 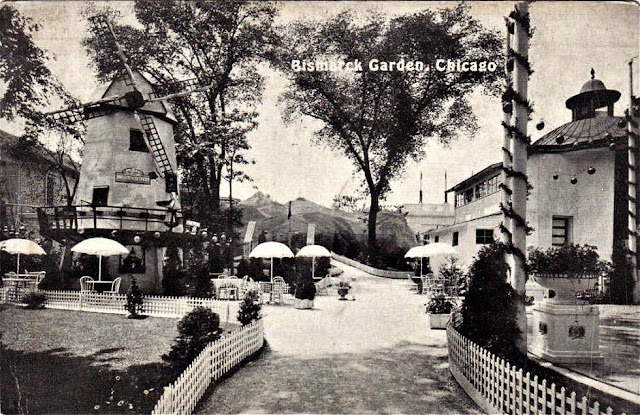 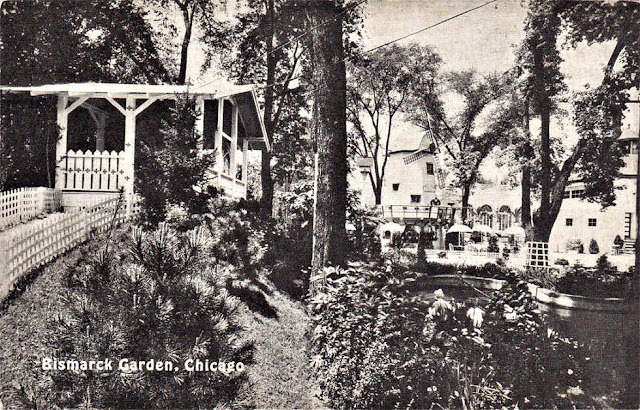 Bismarck Gardens was located at the southwest corner of Grace and Halsted Streets in old District of Lake View. 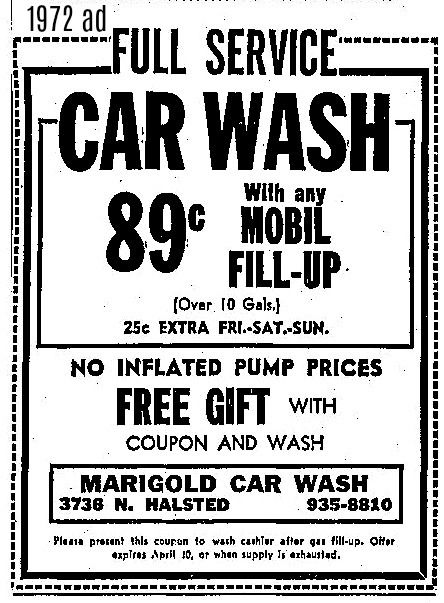 It opened in 1894 by brothers Emil and Karl Eitel to serve the sizable number of German-Americans living on Chicago's North Side (Emil was a resident of the East Ravenswood community of Lake View). 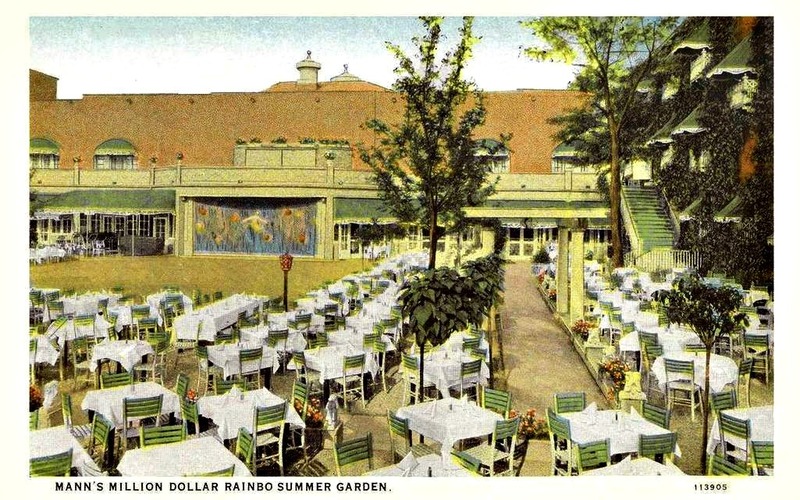 The park-sized space quickly became one of the city's most popular summertime beer gardens. 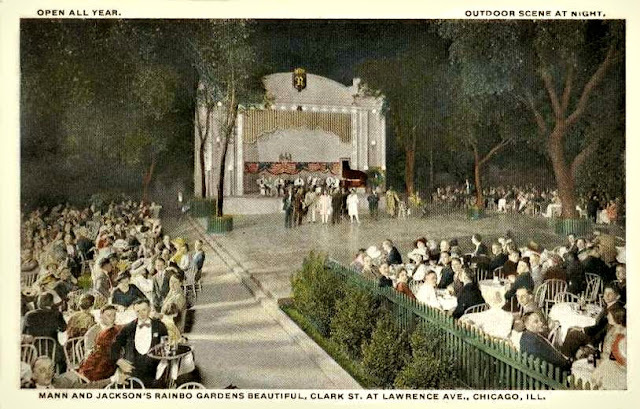 It featured ample shade trees, electric lamps, an outdoor stage and dance floor, and plenty of German beer and music. 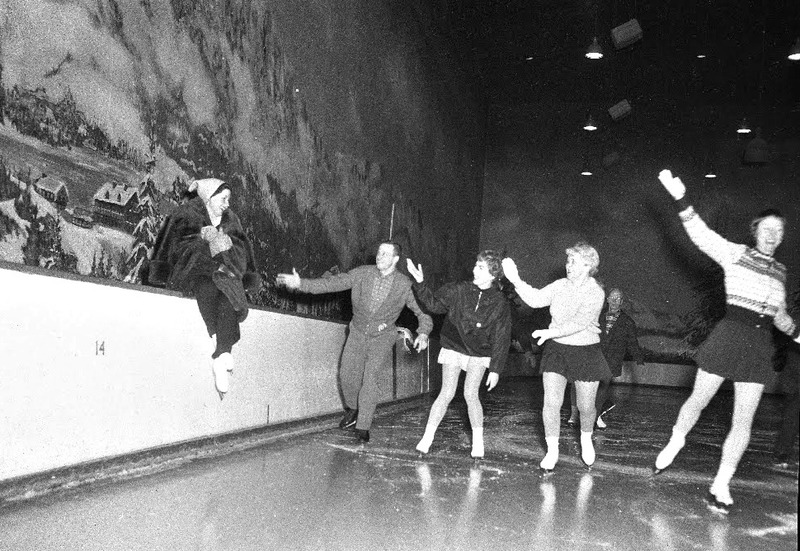 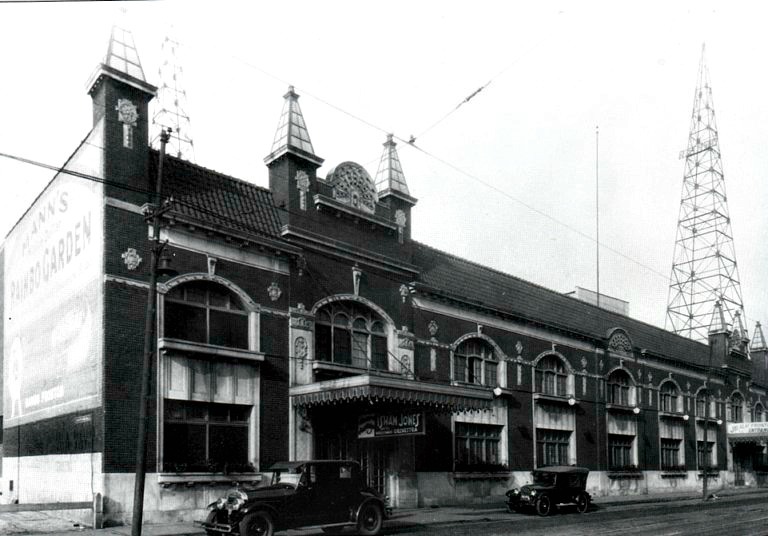 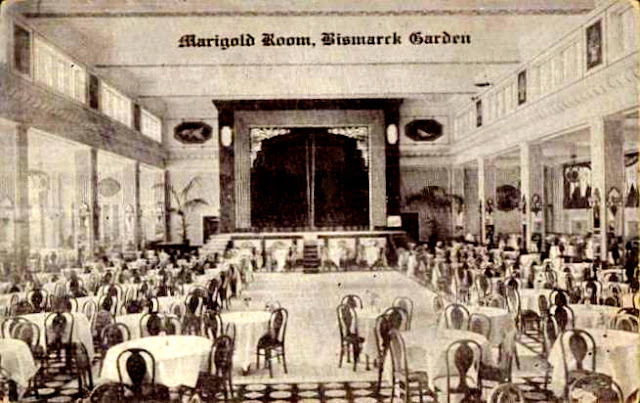 An attractive entertainment hall was also built so to permit year-round operations. 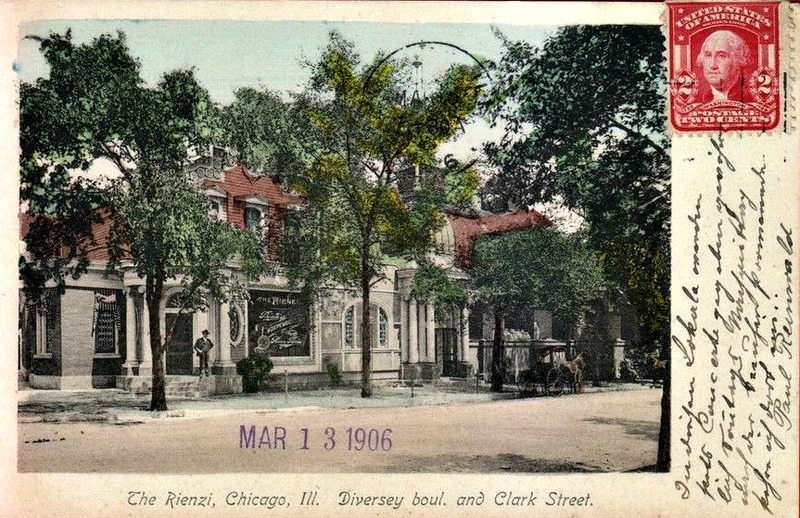 Bismarck Gardens did have issues with its neighbors much like the neighbors surrounding Wrigley Field today – parking and noise! 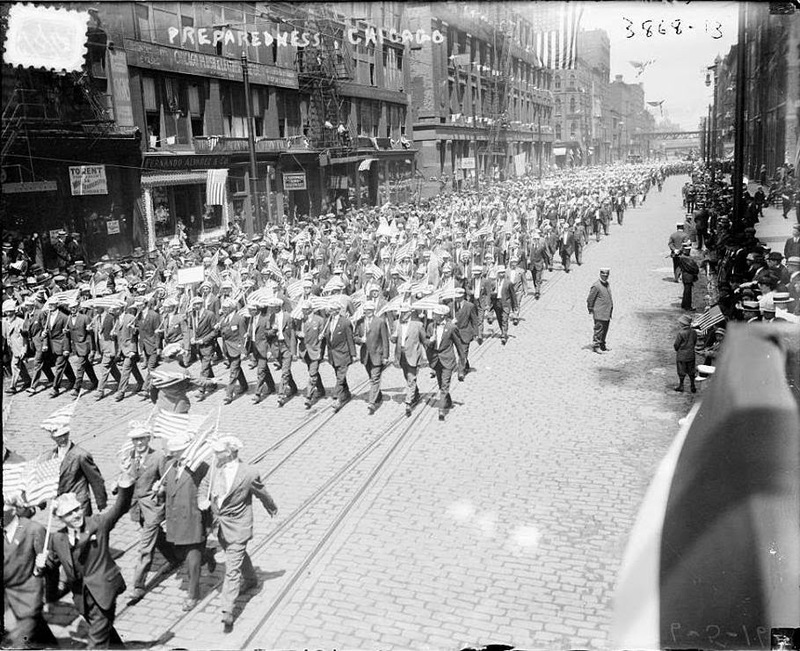 Other issues were WWI anti-German sentiment, labor strikes, and Prohibition Act of 1919. 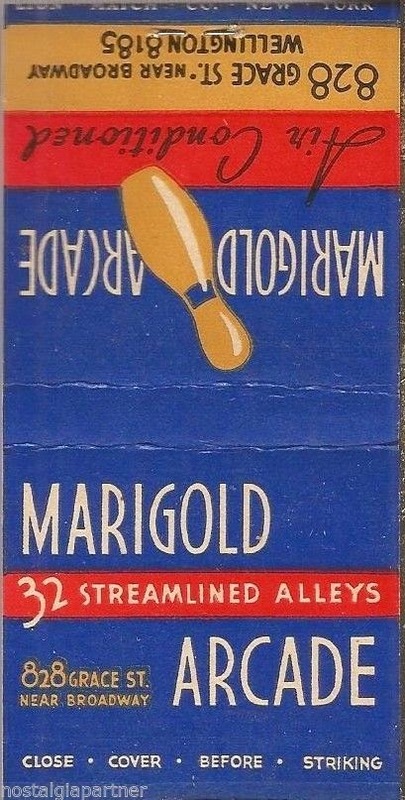 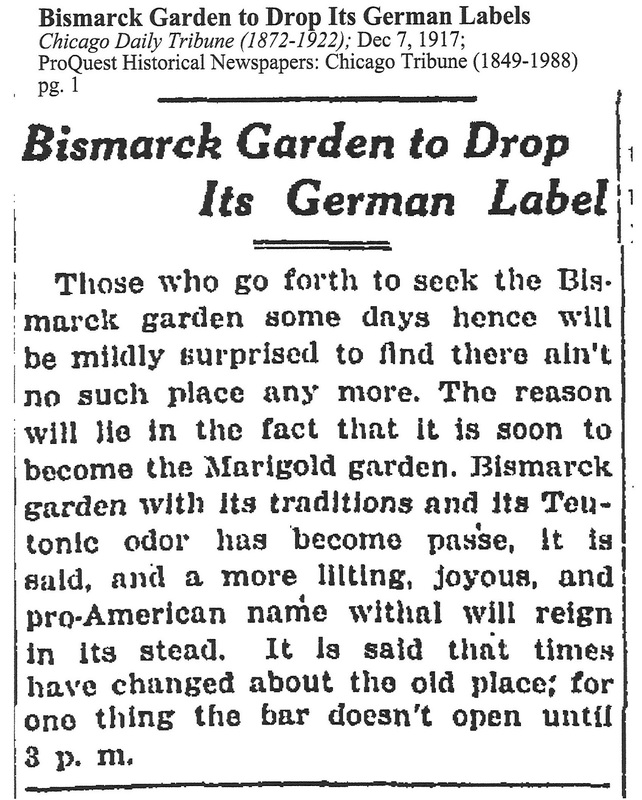 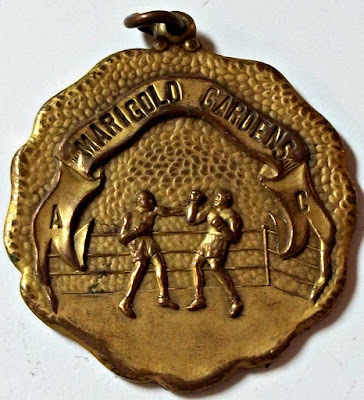 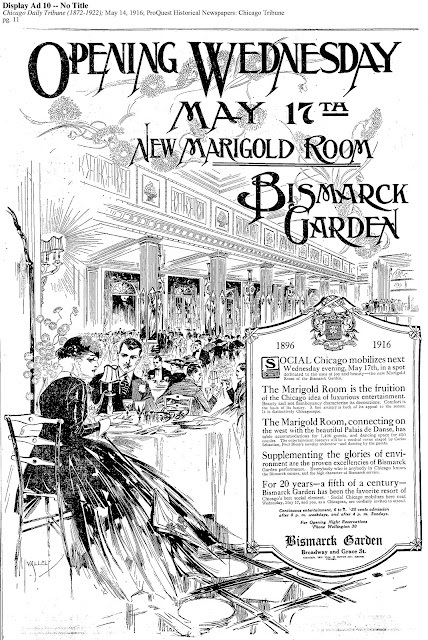 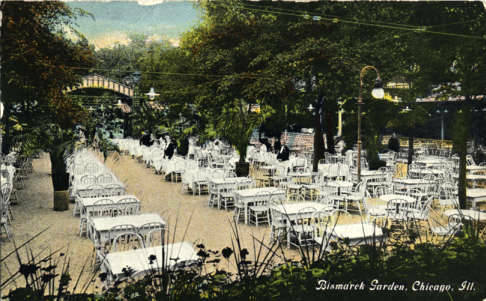 Bismarck Gardens had to rename it establishment to Marigold Gardens by 1916, in response to rising anti-German sentiment in the city before and during the First World War. 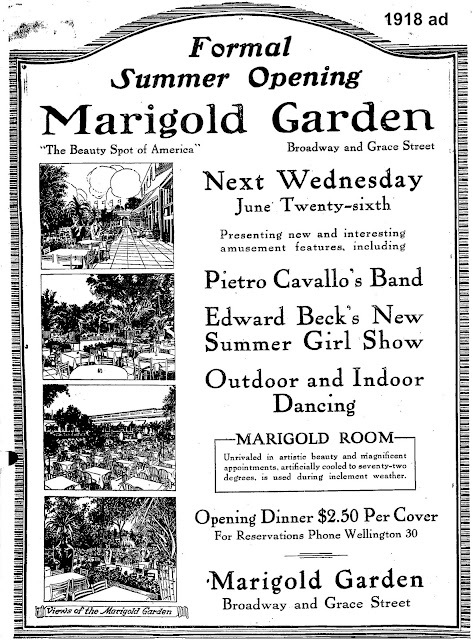 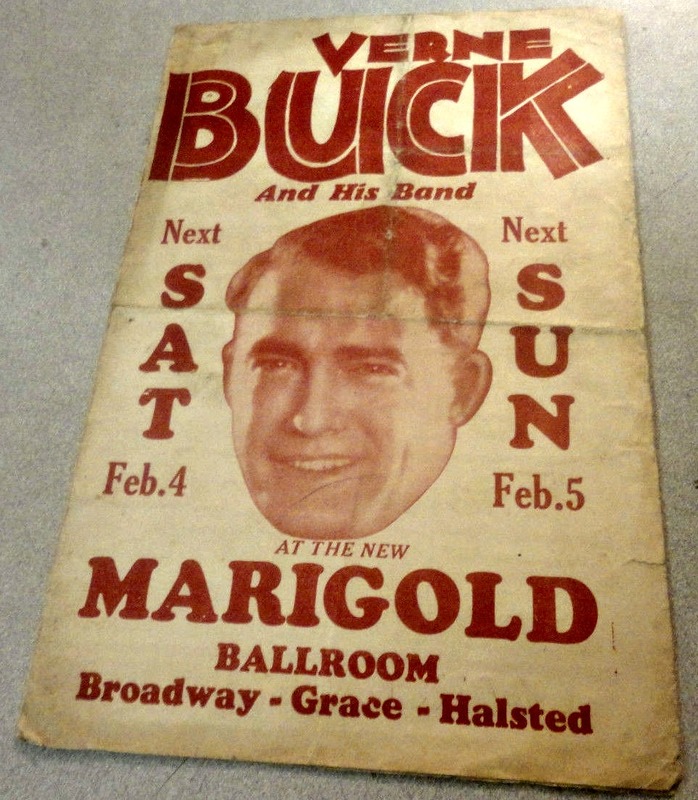 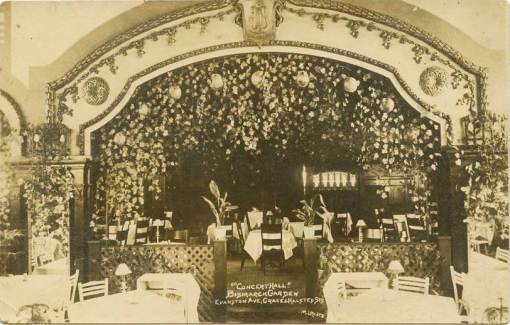 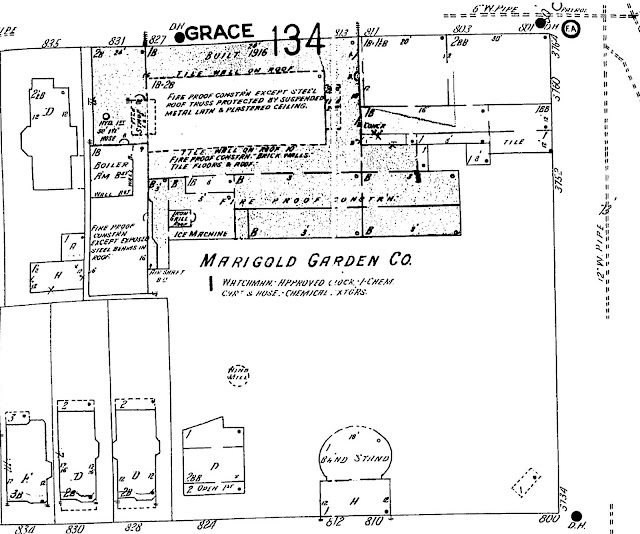 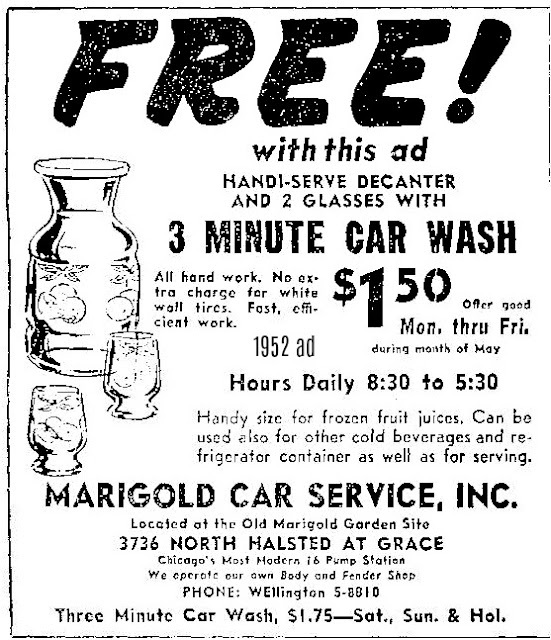 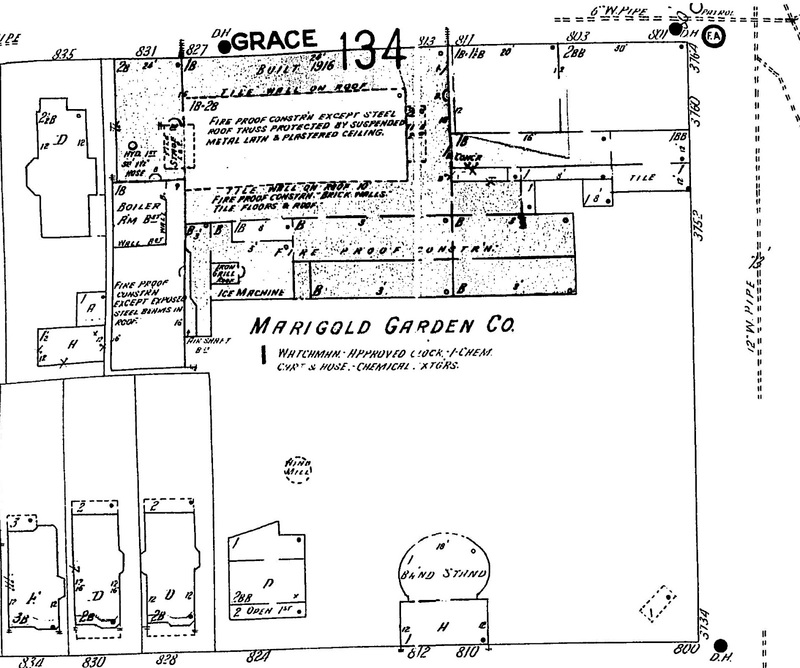 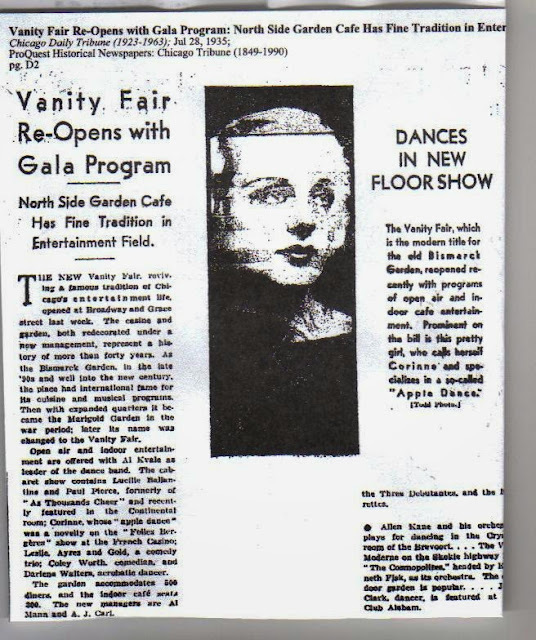 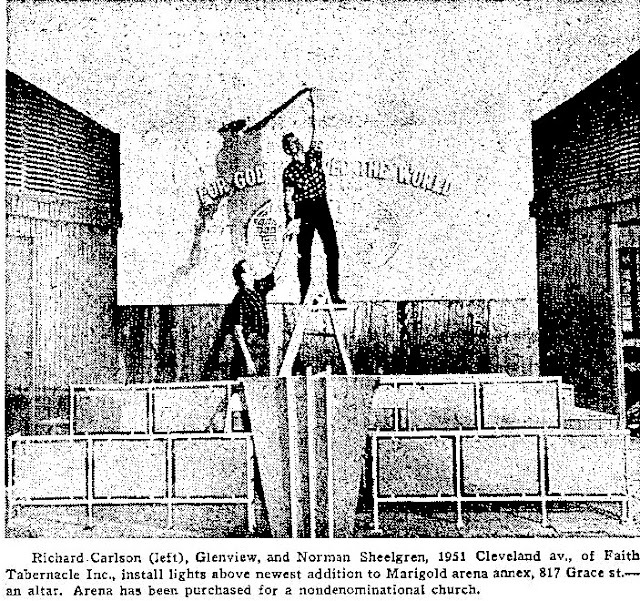 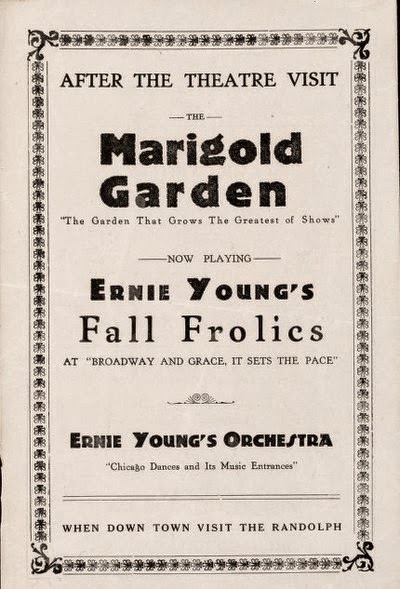 In 1923, Marigold Gardens venue changed with new owners, new management, and new entertainment. 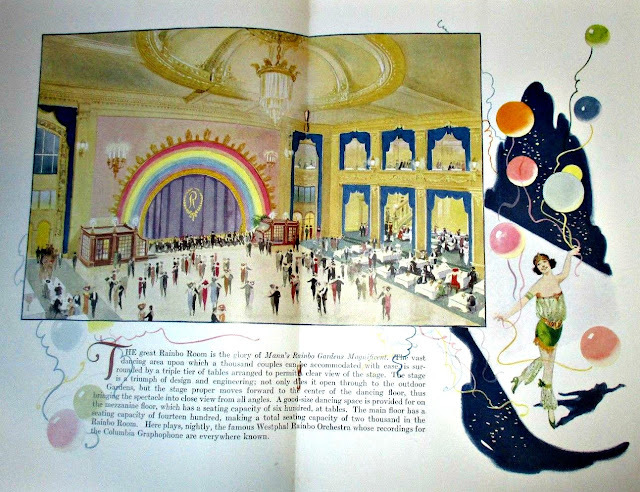 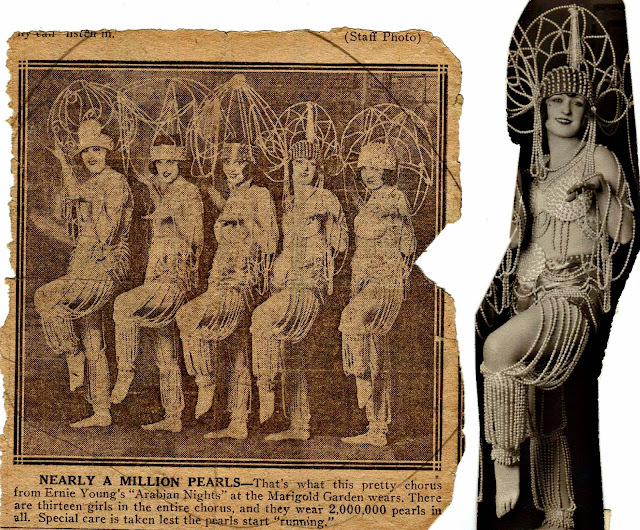 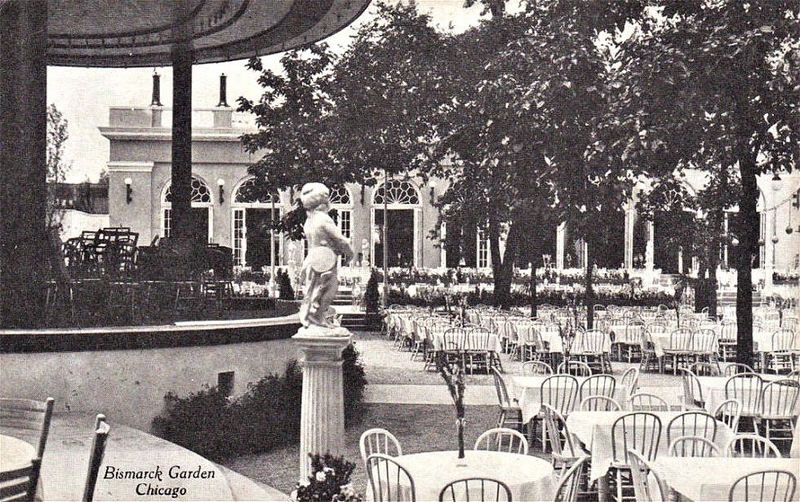 For a brief time during the late 1920's, the gardens became known as Vanity Fair known for its cabaret shows. 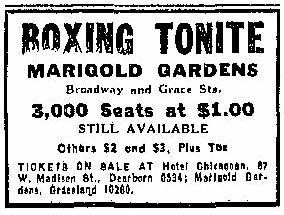 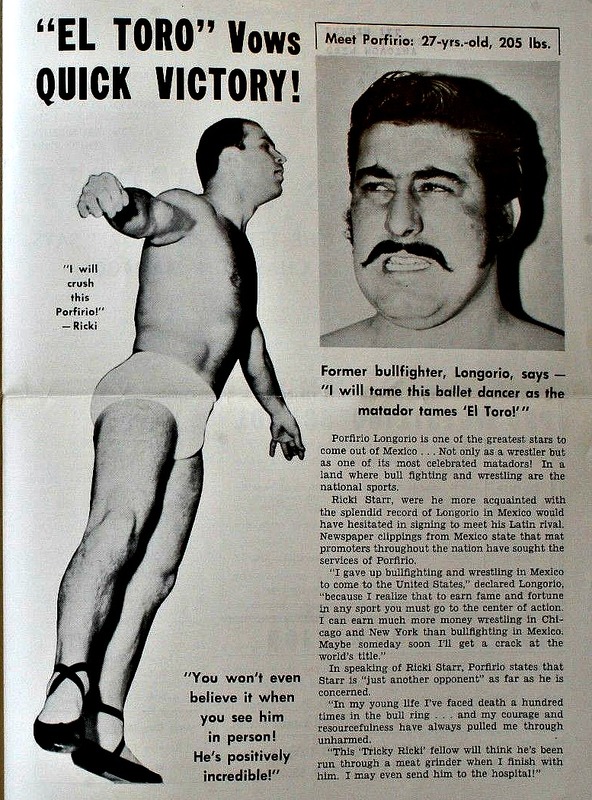 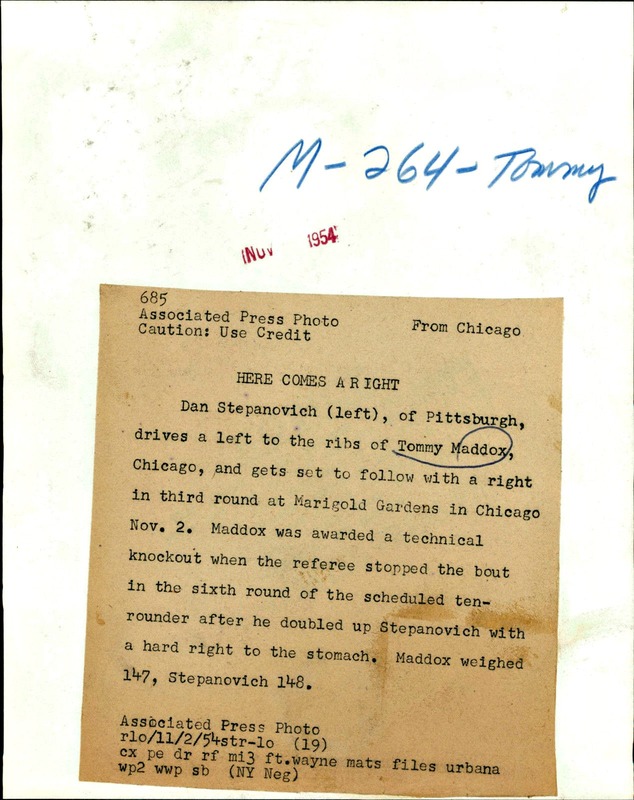 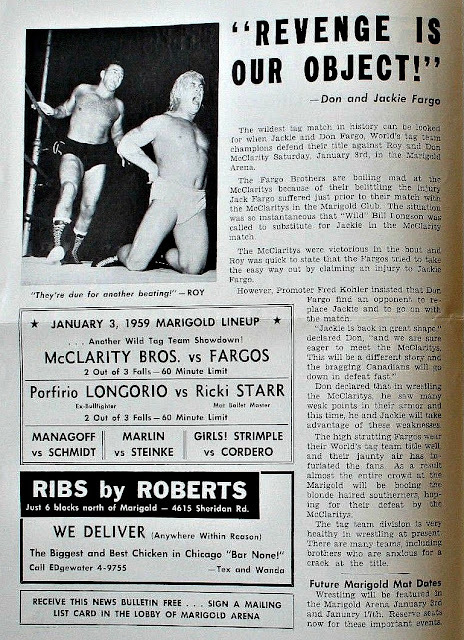 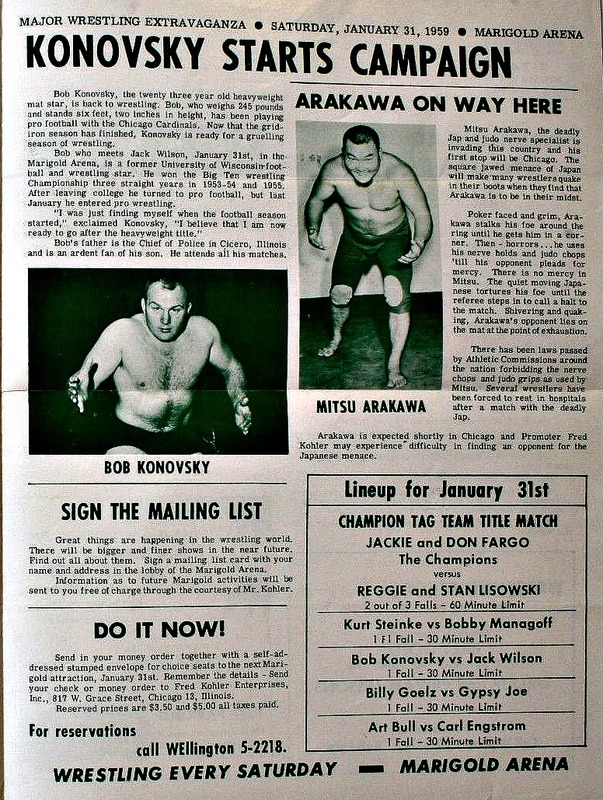 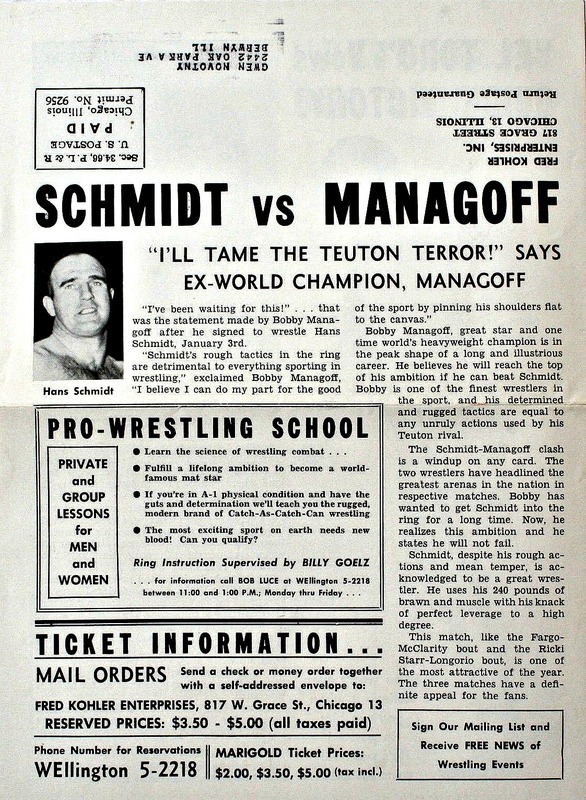 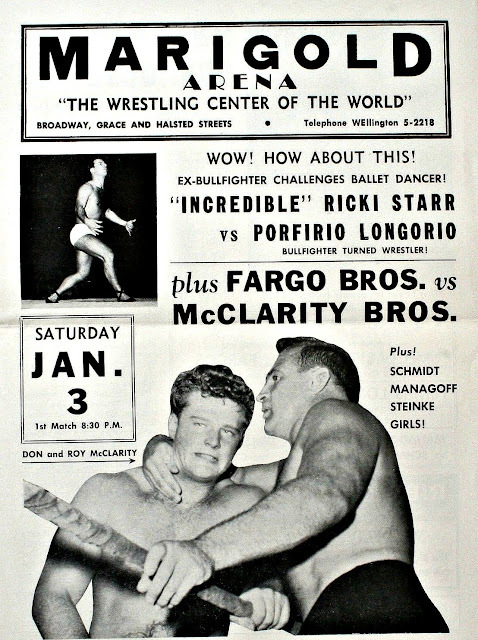 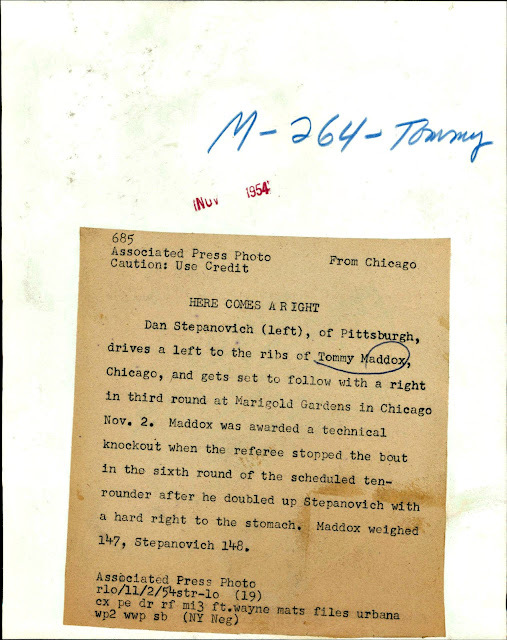 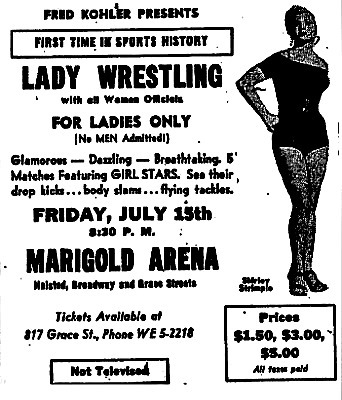 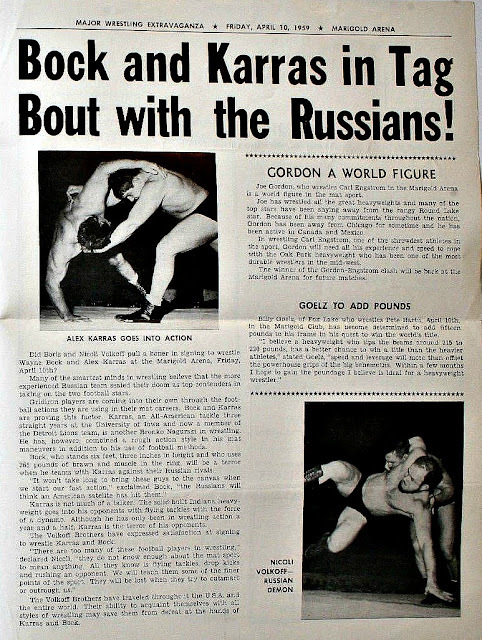 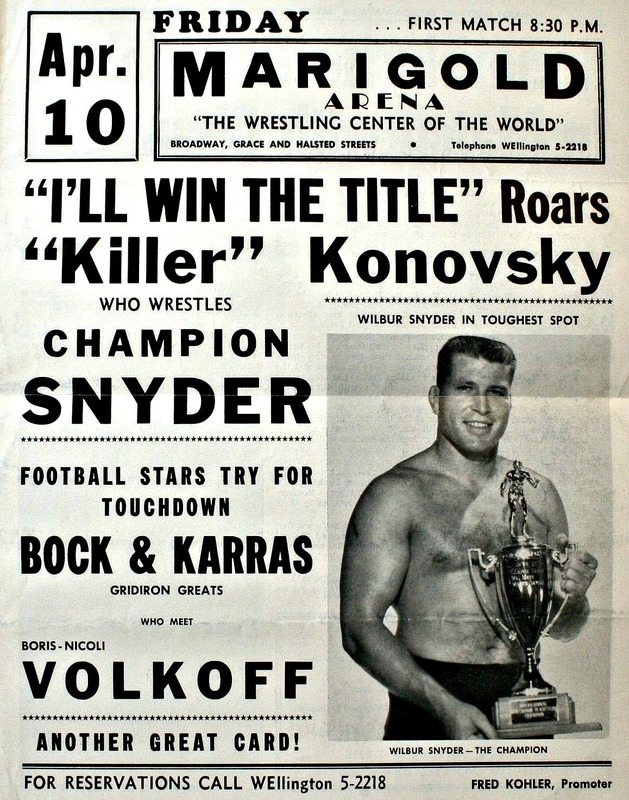 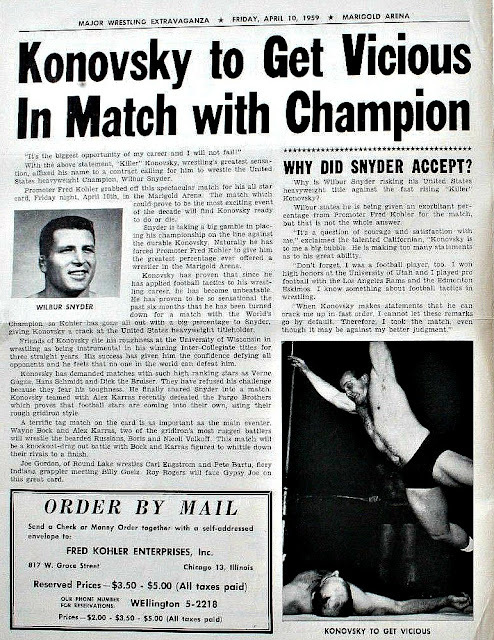 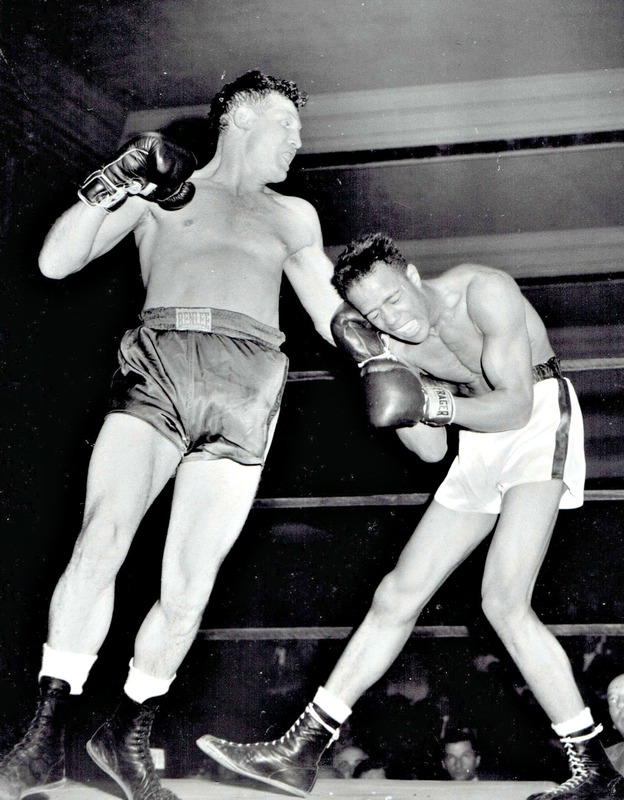 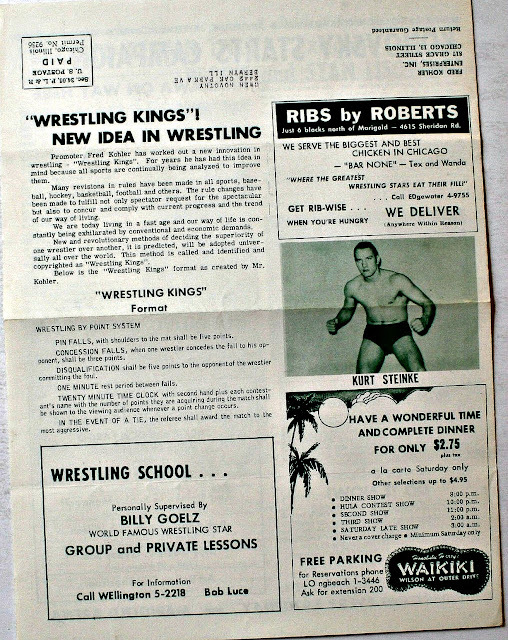 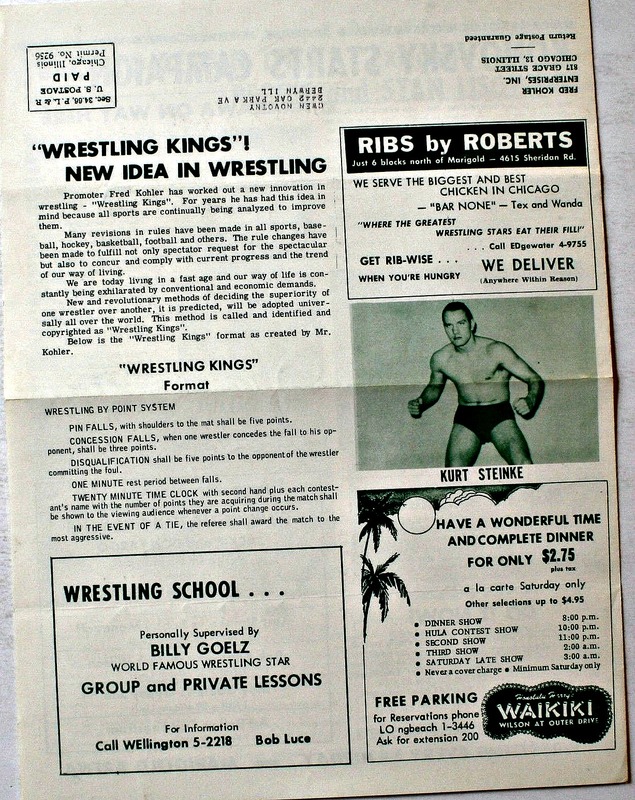 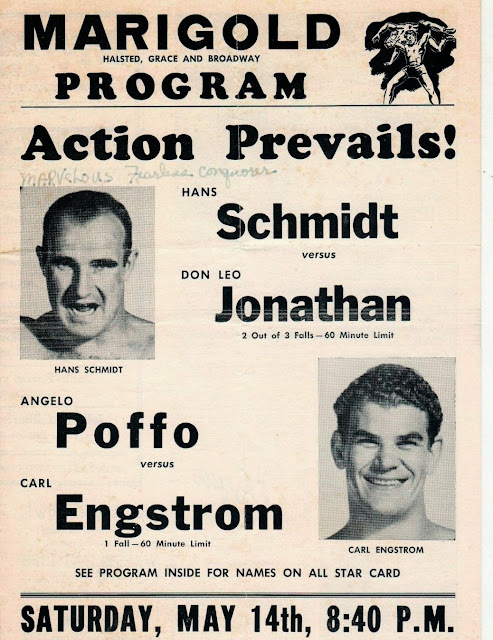 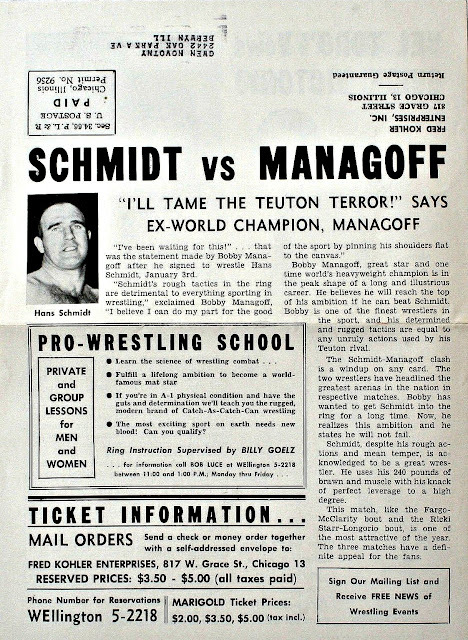 It was later well known by the mid-20th century for professional boxing matches. 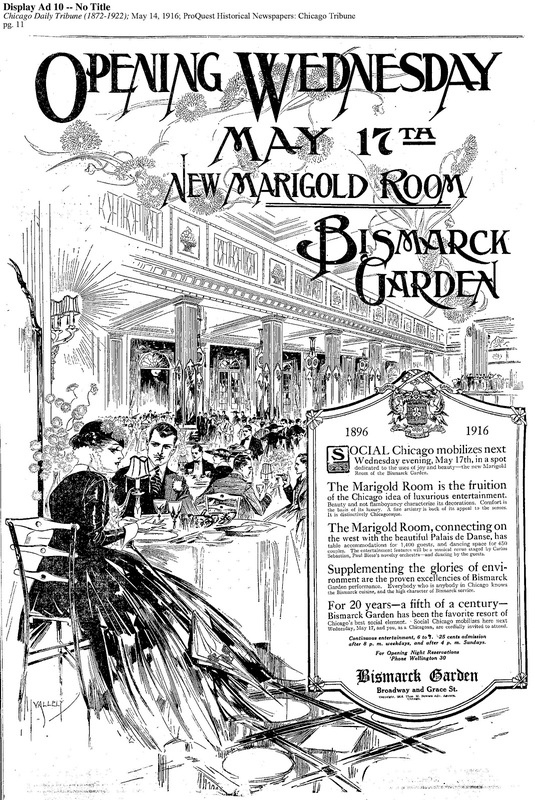 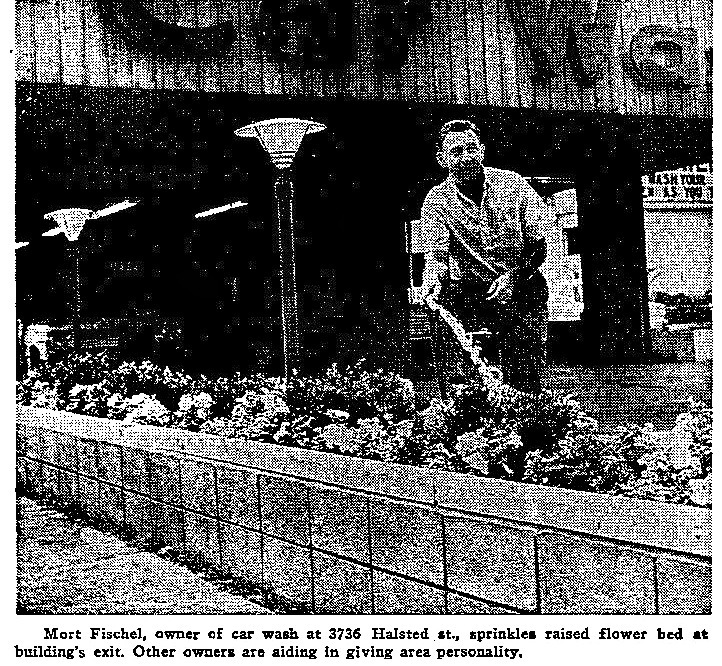 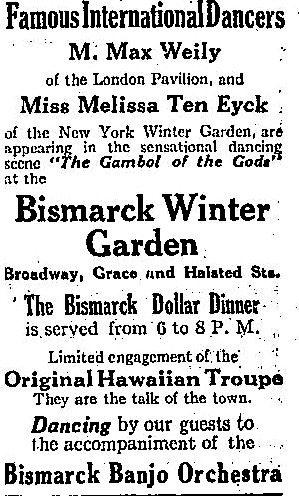 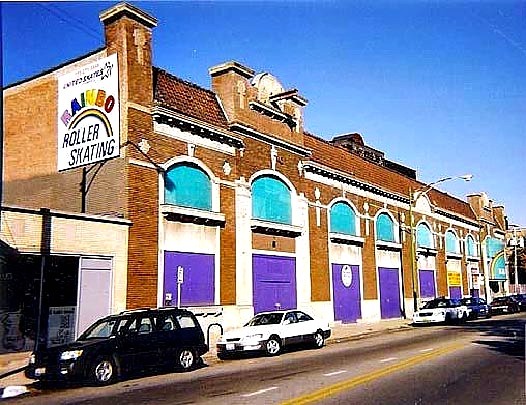 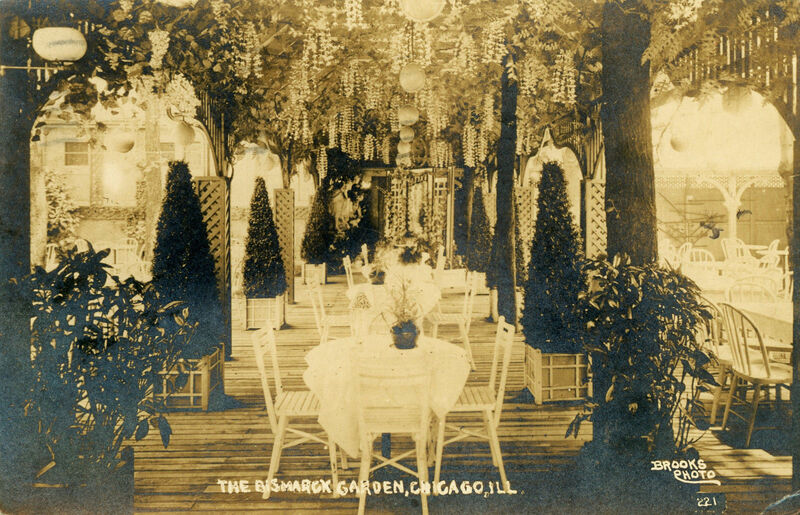 The Bismarck's elegant and shady gardens have long since been paved over first with a parking lot in the 1960's and in 2014 as Halsted Flats (old garden area) but parts of the former Marigold Gardens dance hall complex still stand, now converted to other another use. 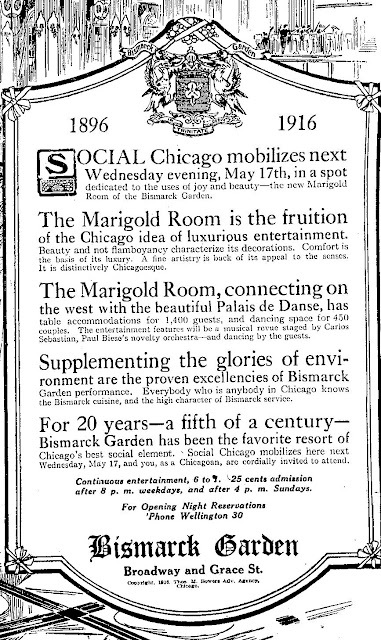 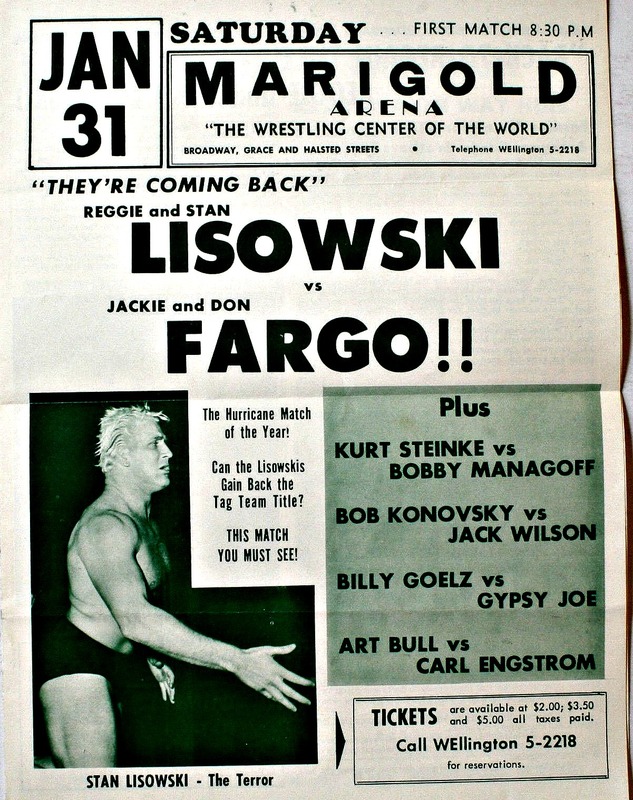 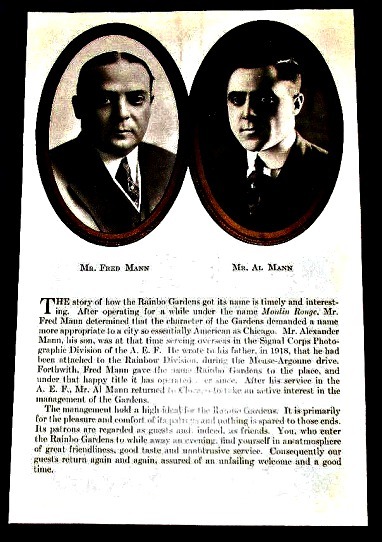 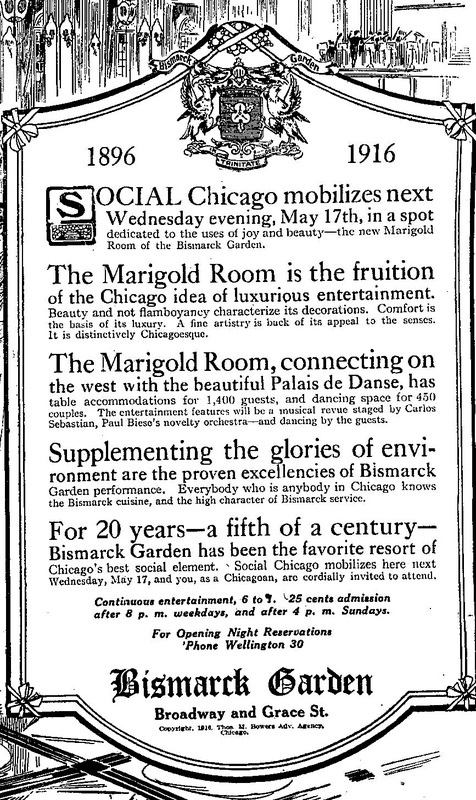 By the way, the Eitel brothers owned another piece of real estate but in the Loop area of Chicago called Bismarck Hotel - now called Hotel Allegro. 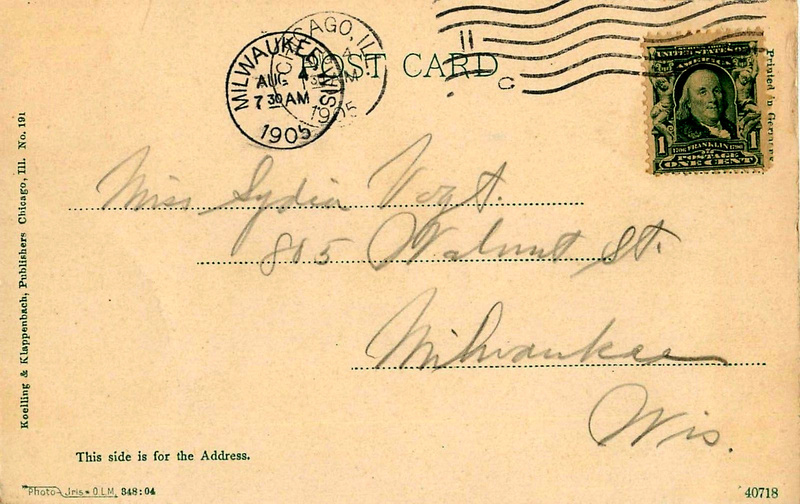 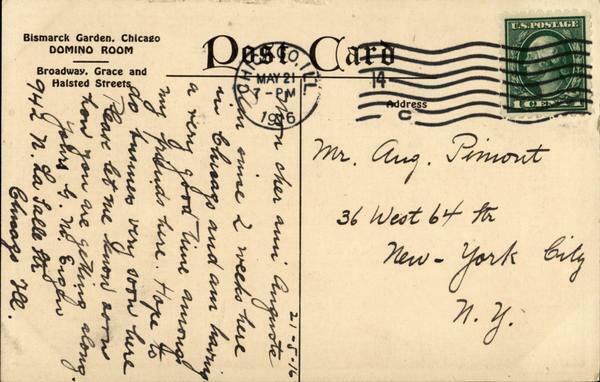 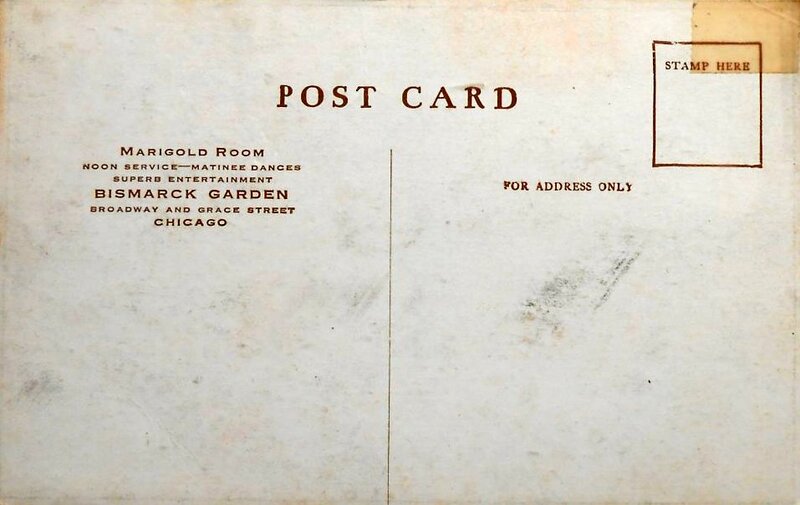 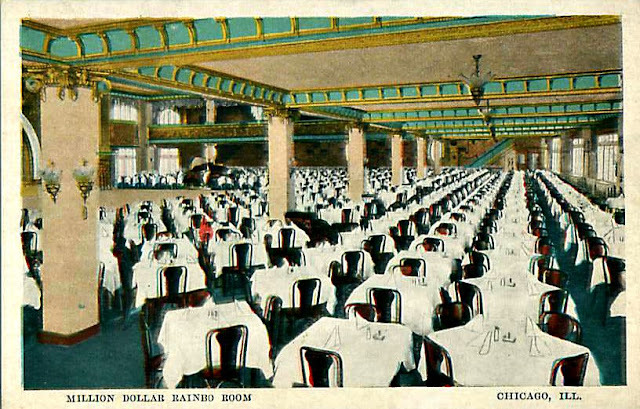 Most of these postcard images are from the Chuckman Collection, Chicago History in Postcards, and the Chicago Public Library Newspapers Archives & Linda Woods, a LVH contributor. 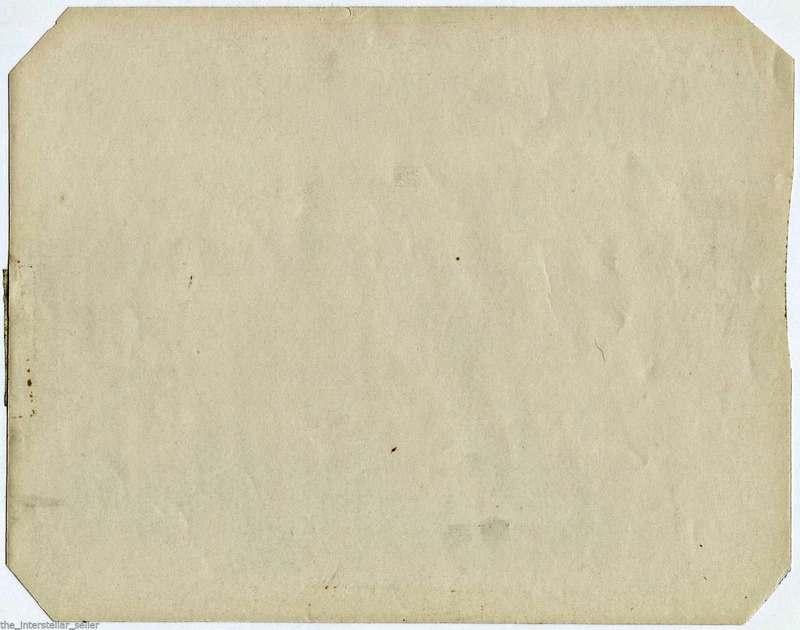 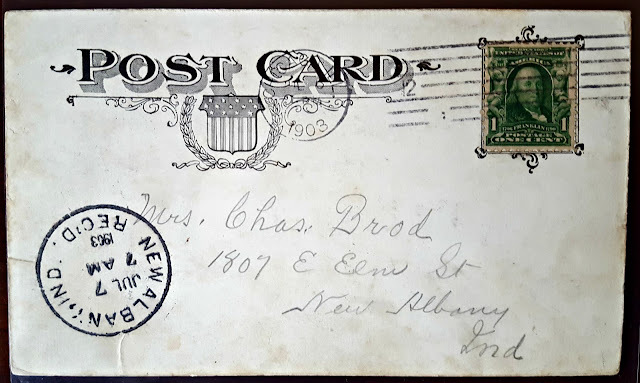 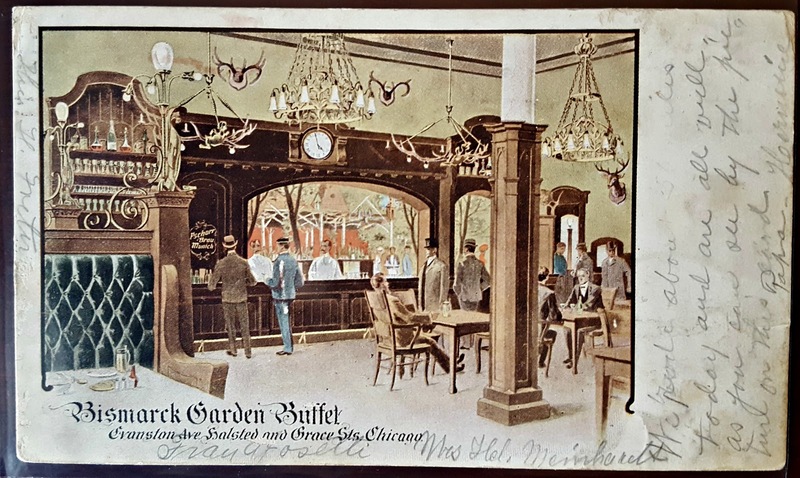 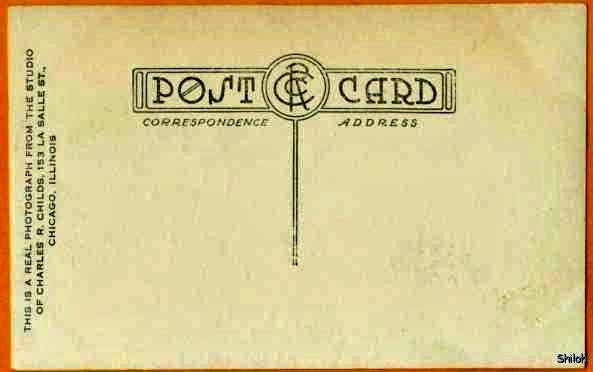 In fact, most if not all of the postcards shown in the album were produced by the largest manufacturer of postcards in the late 19th to mid-20th century called Curt Teich & Company yet another establishment in old hood. 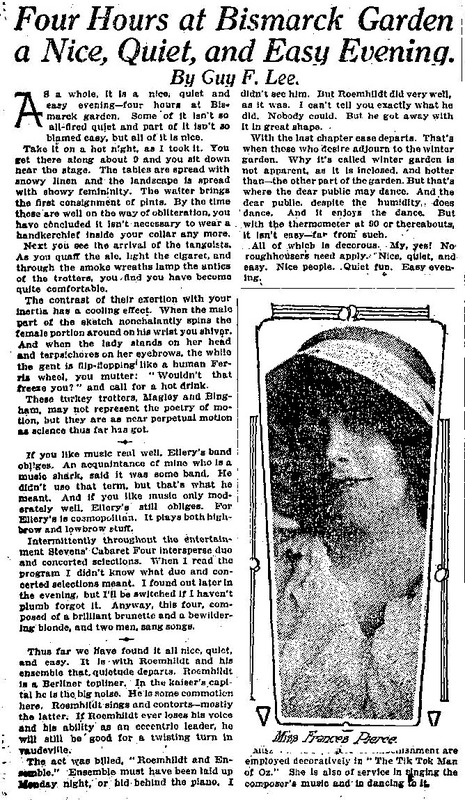 Ruth Etting. 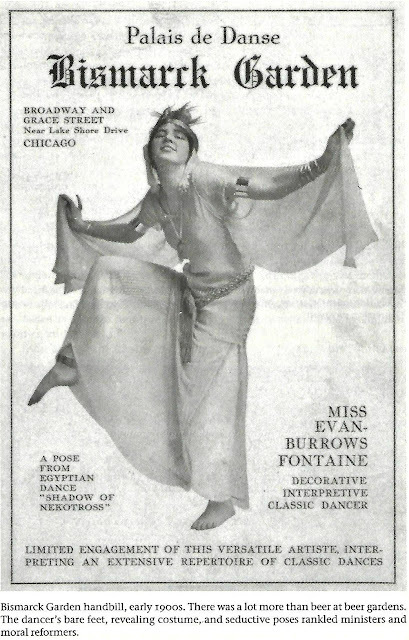 She was born in 1896 and died in 1978, first was a ‘pin-up’ girl later to be known as a singer/actor. Doris Day and James Cagney. 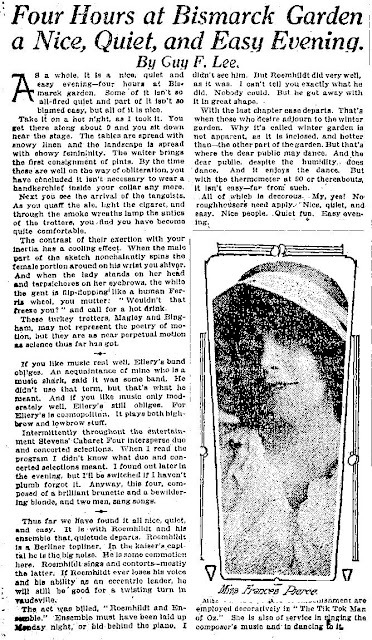 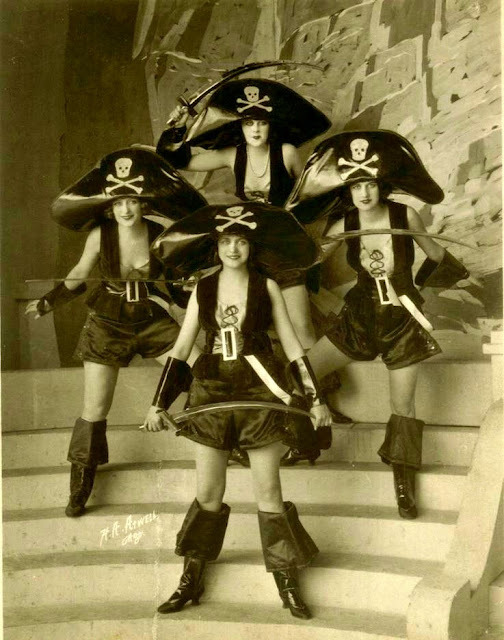 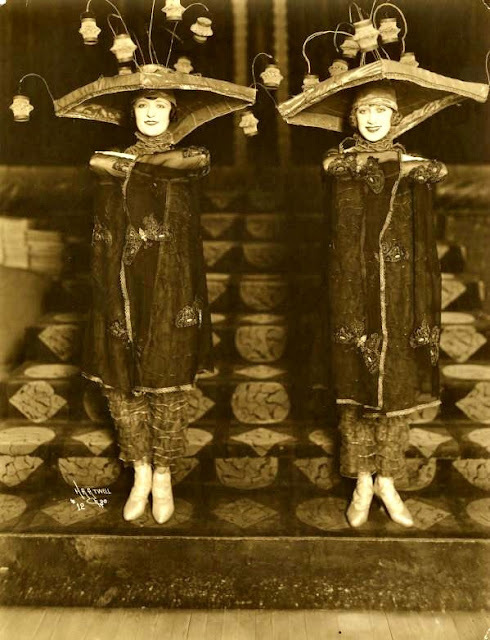 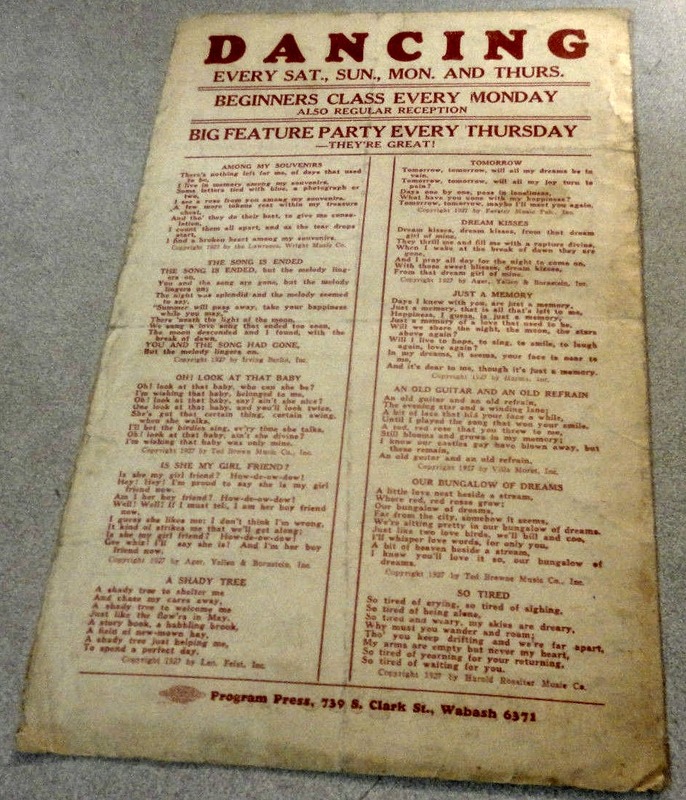 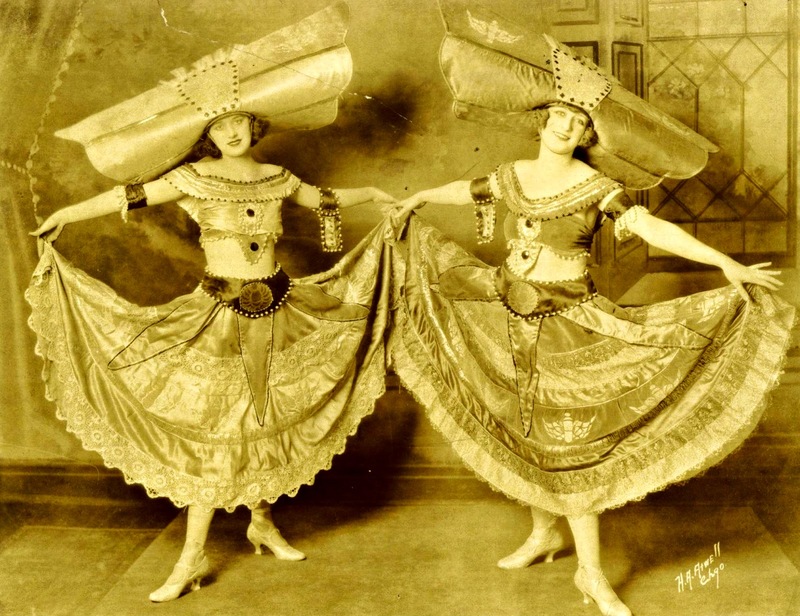 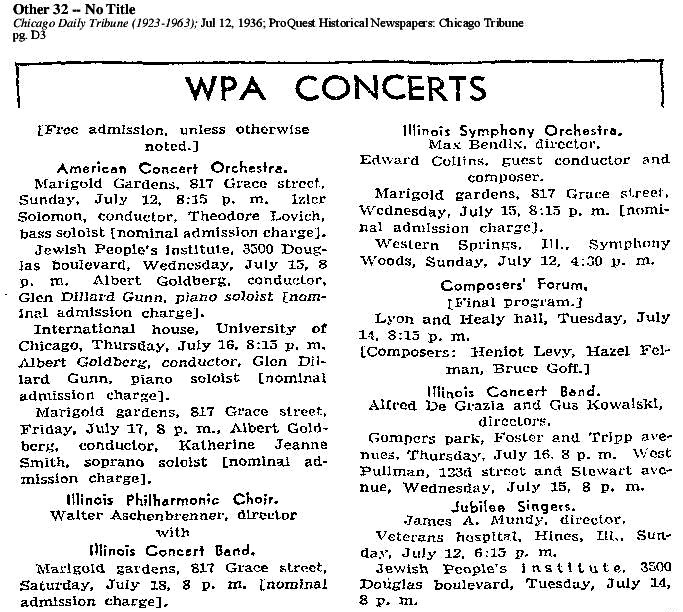 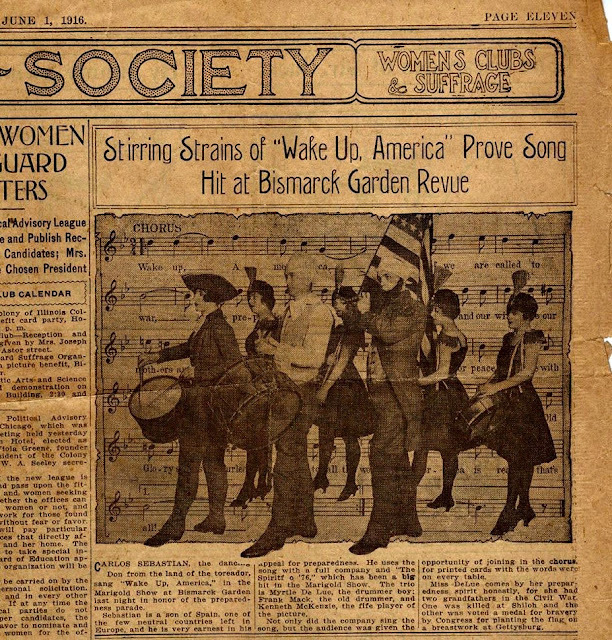 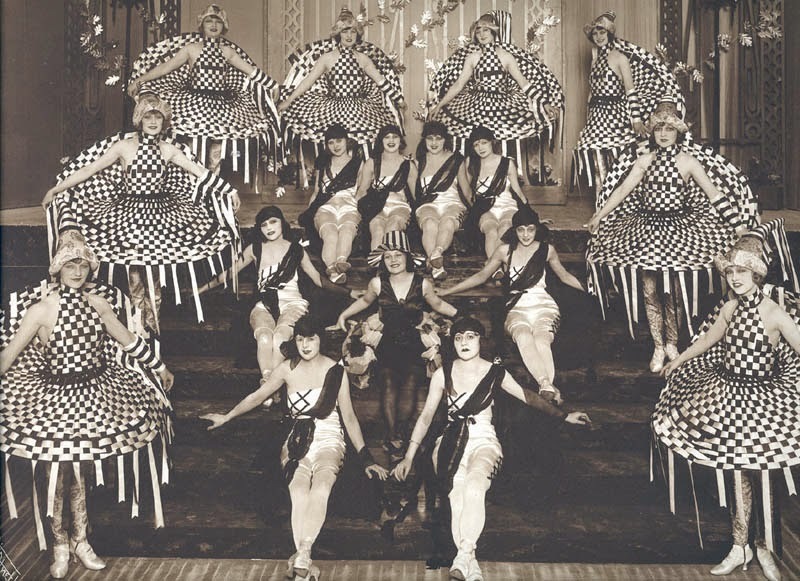 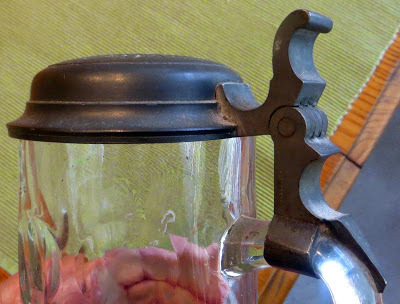 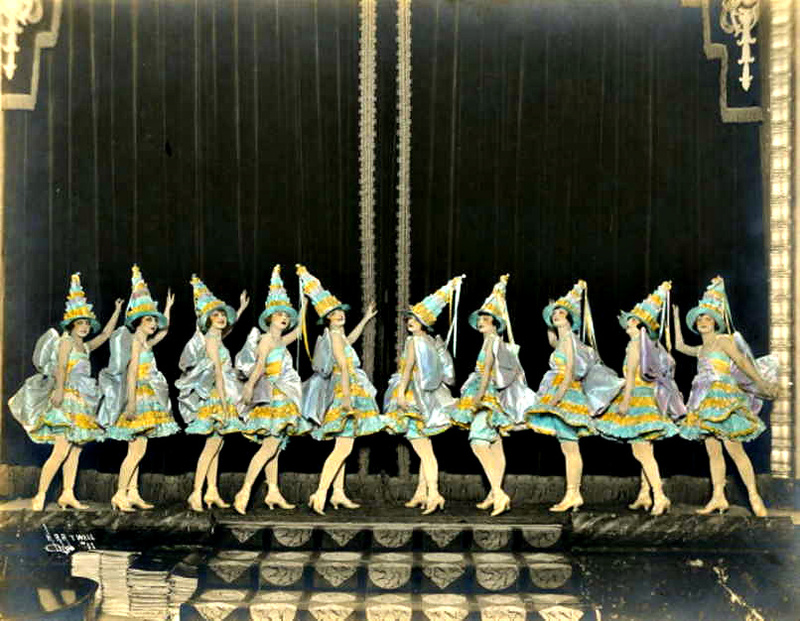 Linda Wood mentioned: "My great grandmother was a dancer in the chorus and was friends with Ruth Etting--first newspaper clipping I have is 1915, and my great grandfather played the trombone with Fred Hamm in the mid-20s at the club. 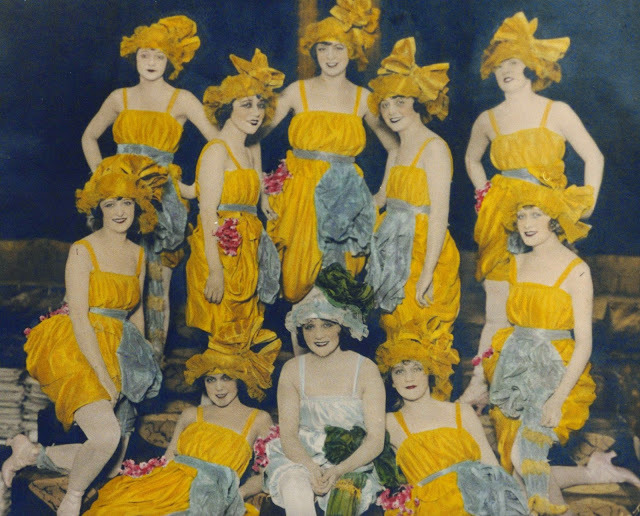 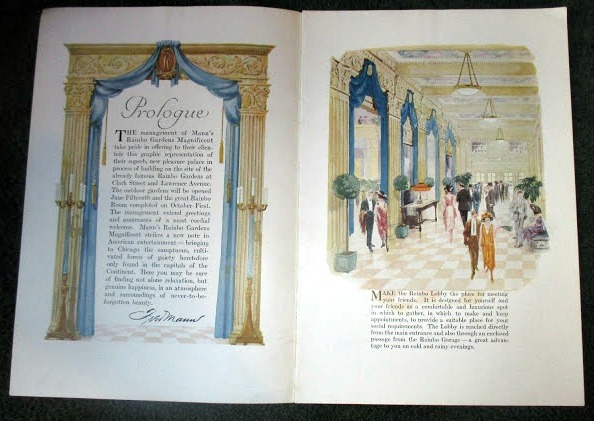 My great-grandmother was the wardrobe mistress for the Marigold and the other local dance palaces. 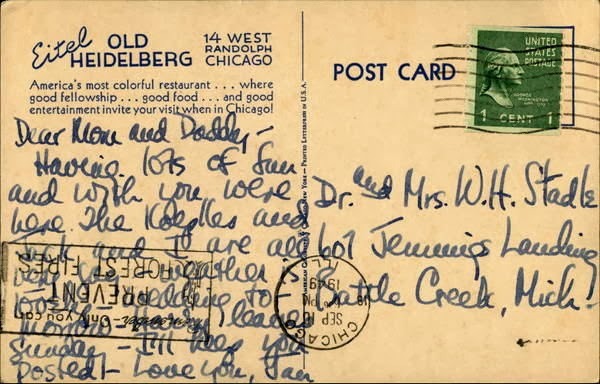 I loved hearing the stories my mom retold of those old days. 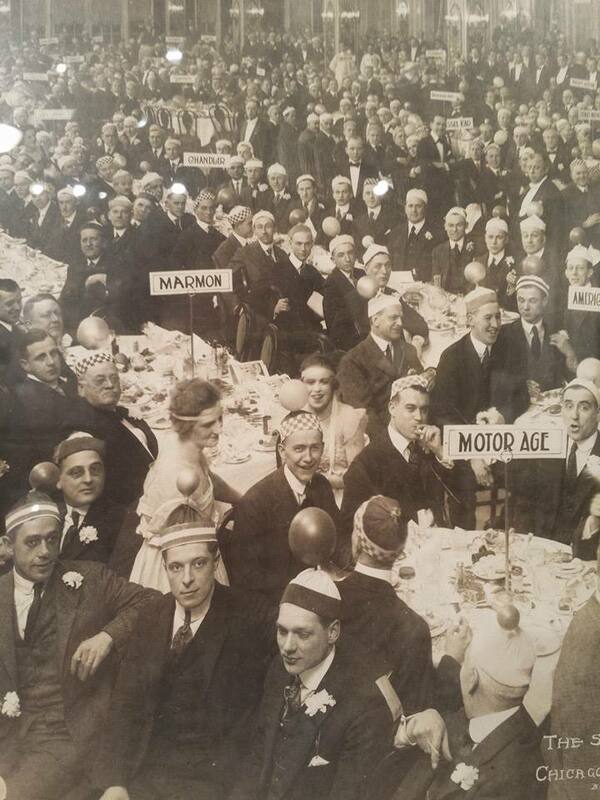 She is in the top row, third from the left." 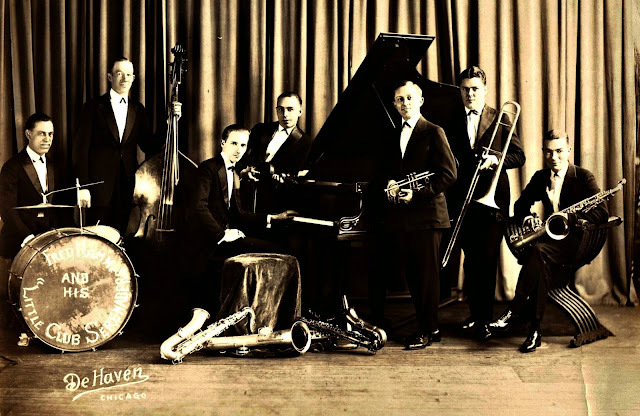 Fred Hamm and his Orchestra were a Big Band from Chicago that was managed by Edgar Benson of Benson Orchestra fame. 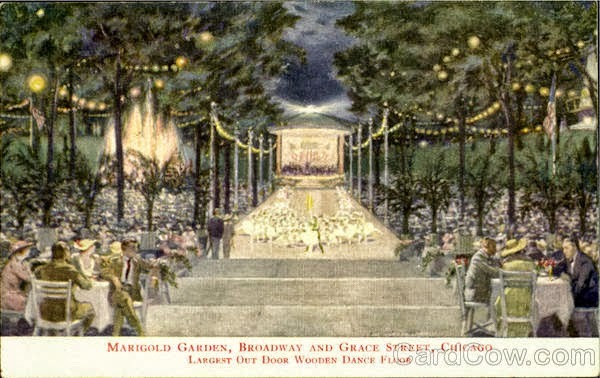 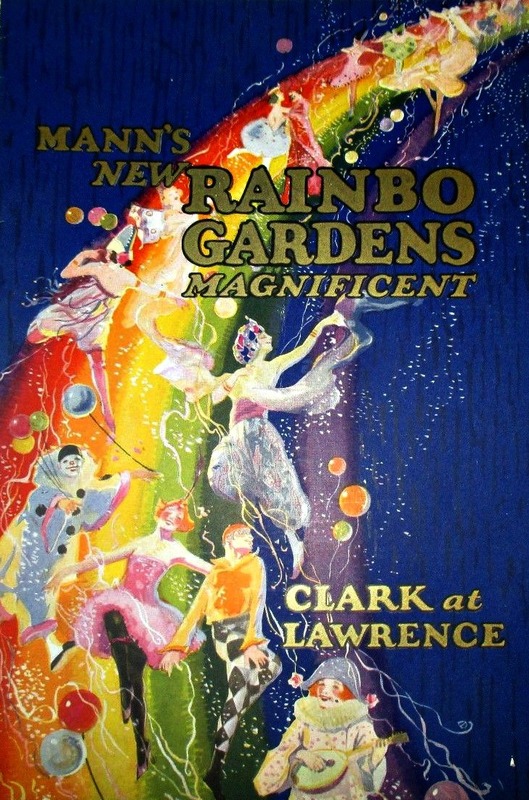 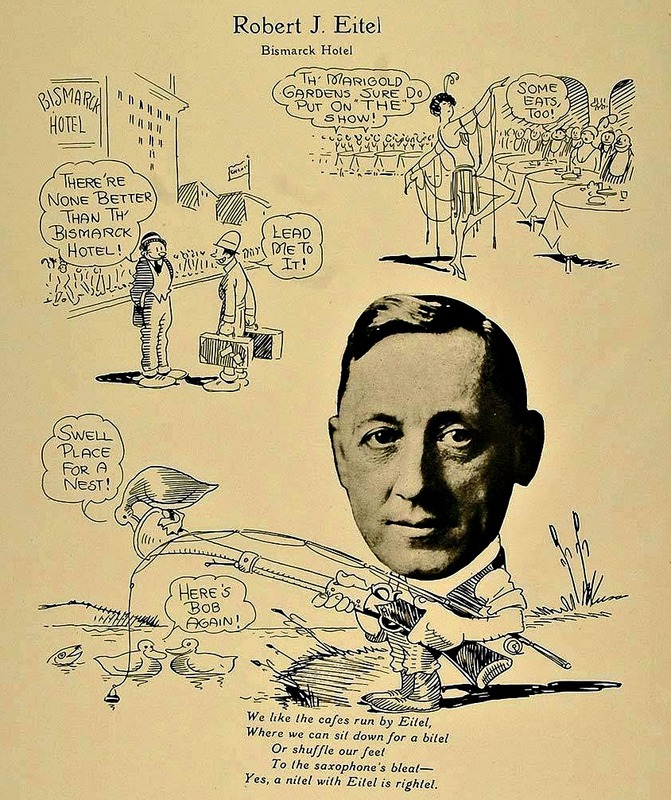 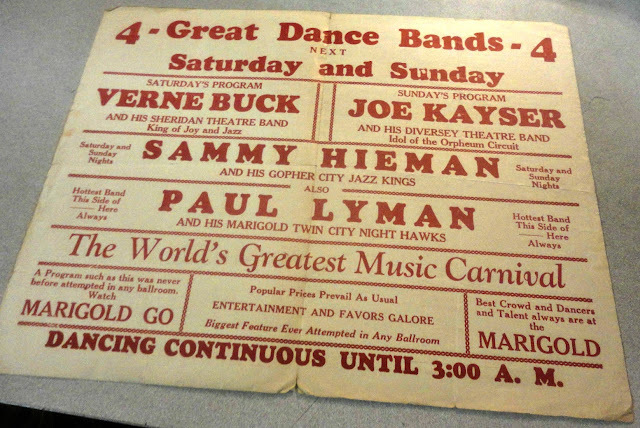 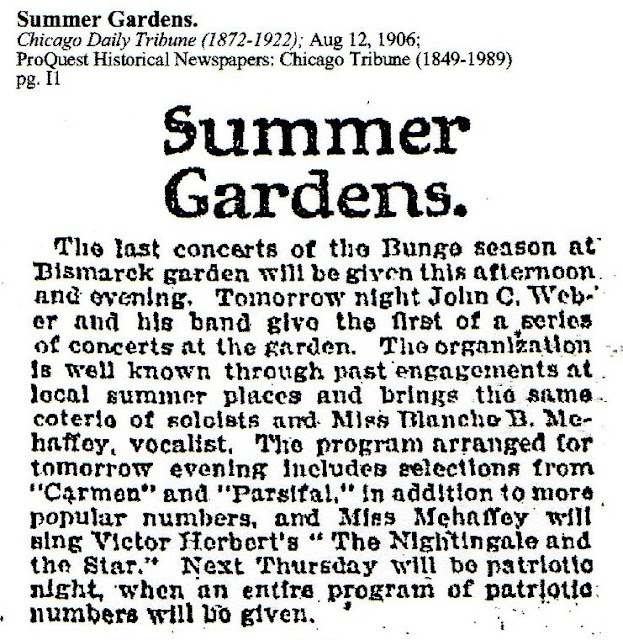 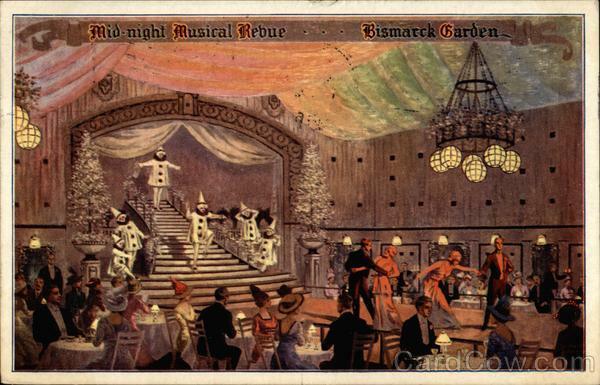 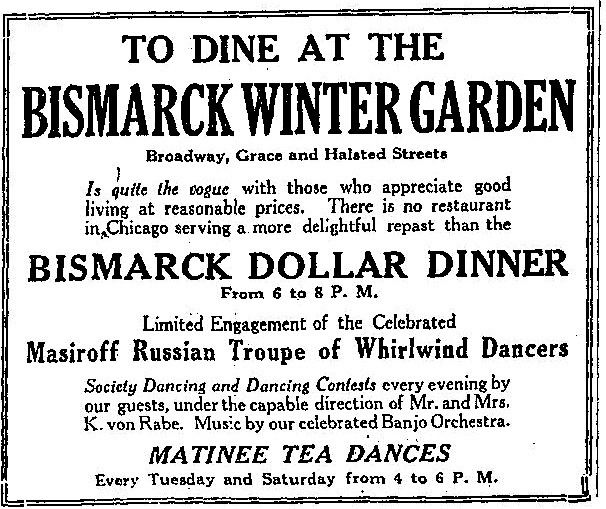 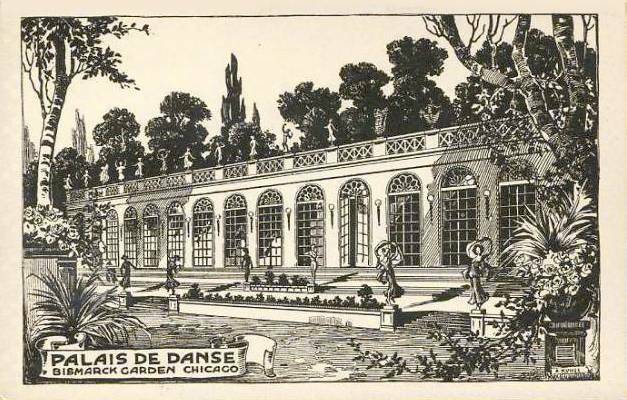 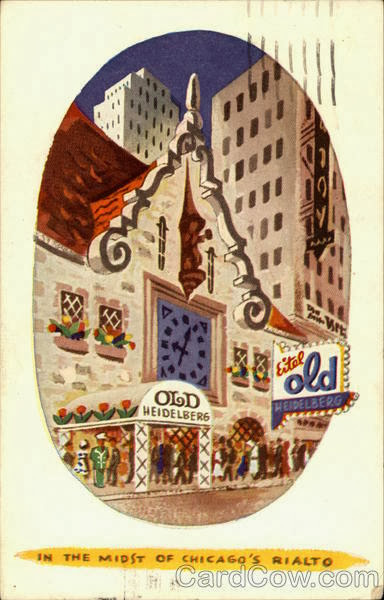 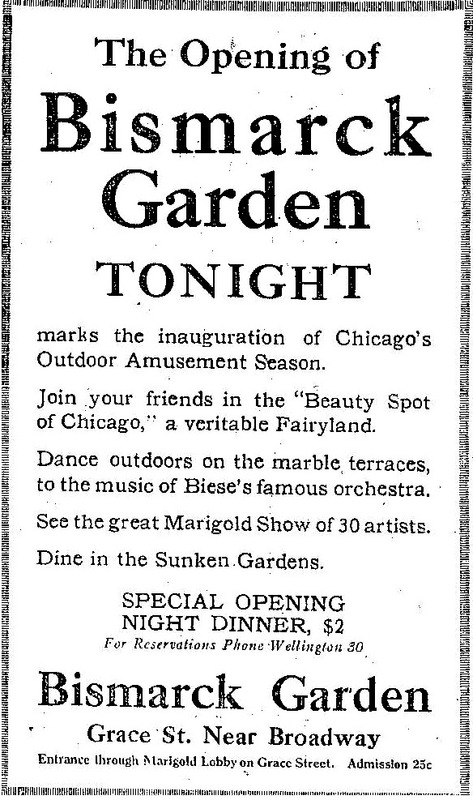 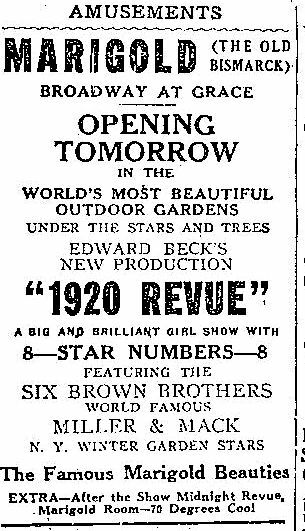 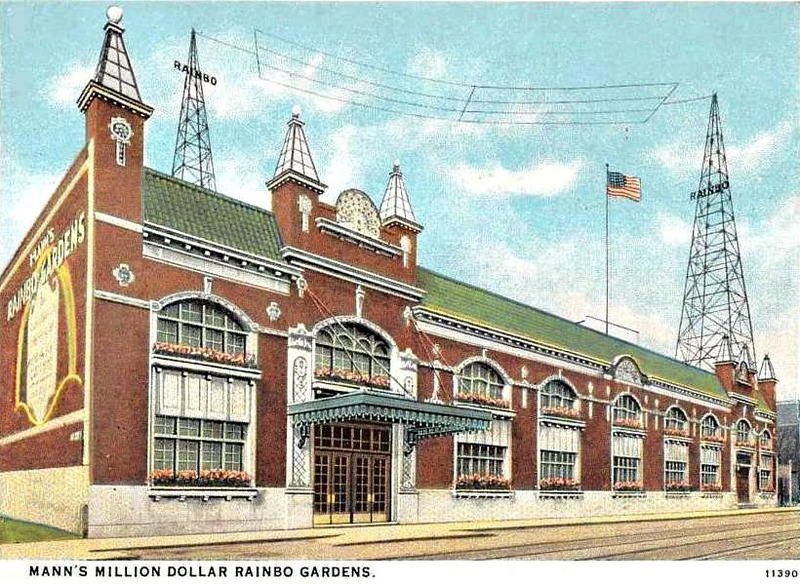 Hamm's Orchestra performed at the Marigold Garden in Chicago from 1923 to 1925. 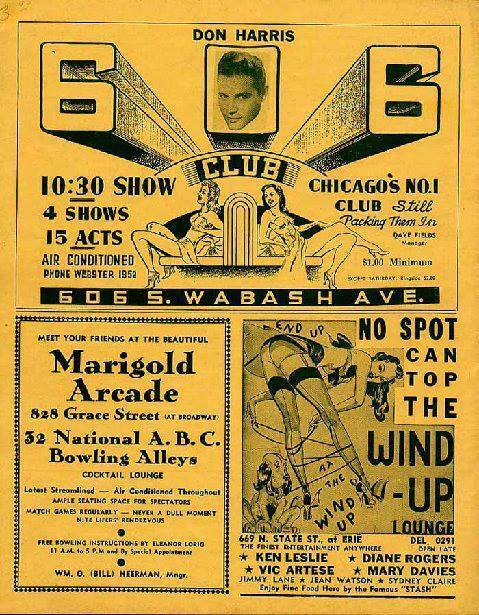 Listen to the sounds of that band and its era with this link and this link. 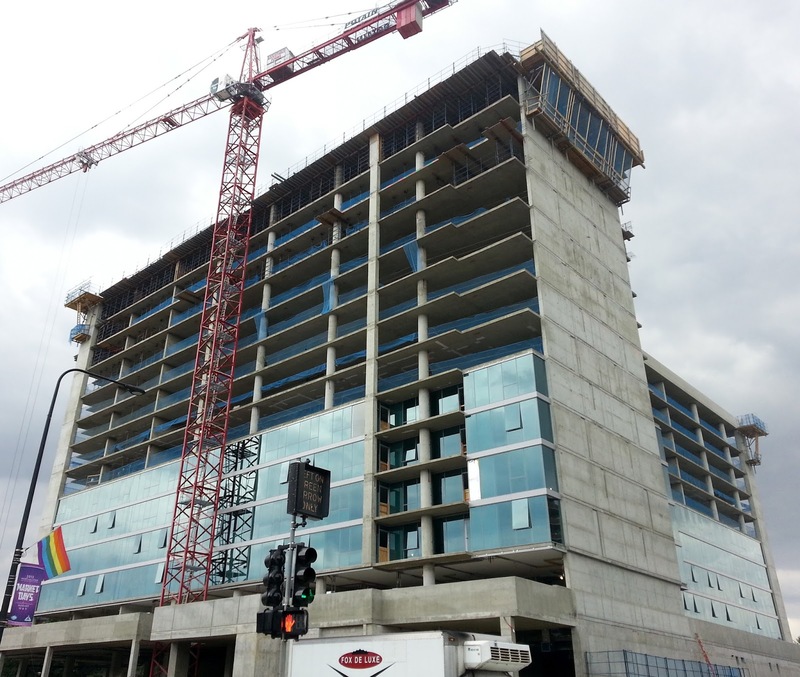 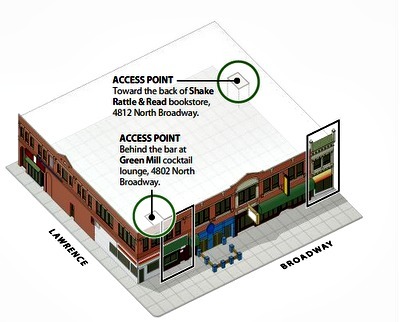 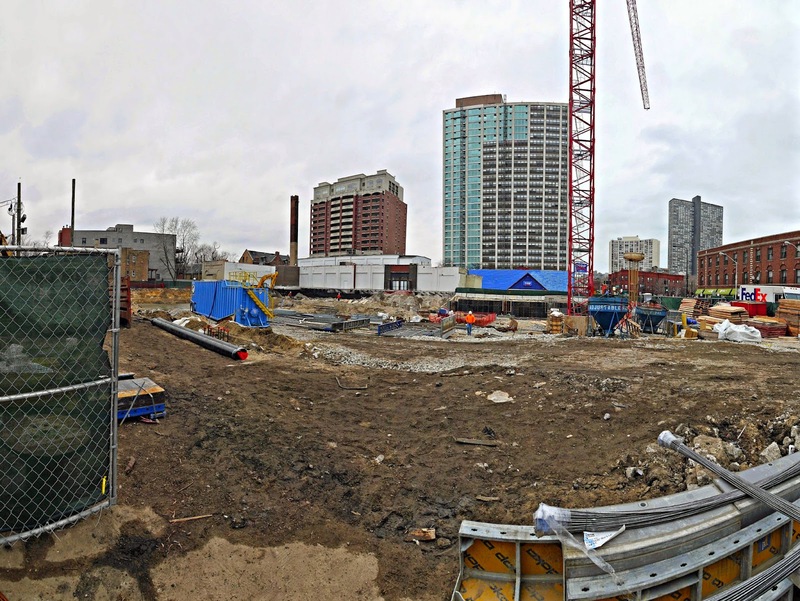 View the photo interactive transition of the building from past to present. 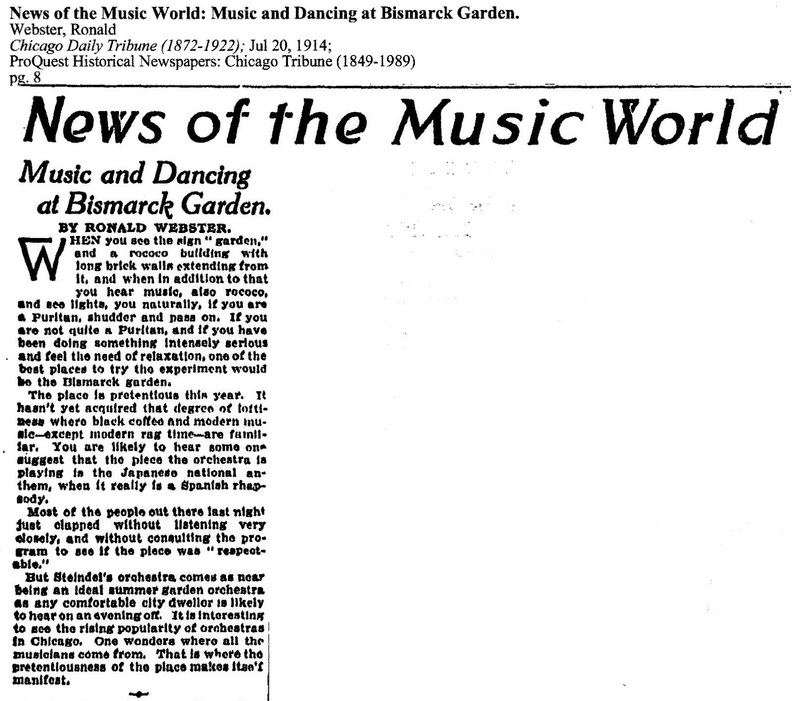 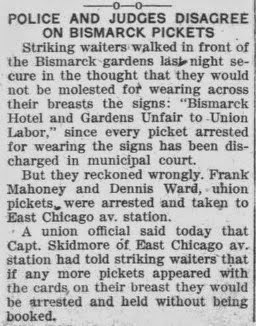 The Chicago Tribune articles below tell a tale of fame and evolution for one of the famous beer gardens in Chicago. 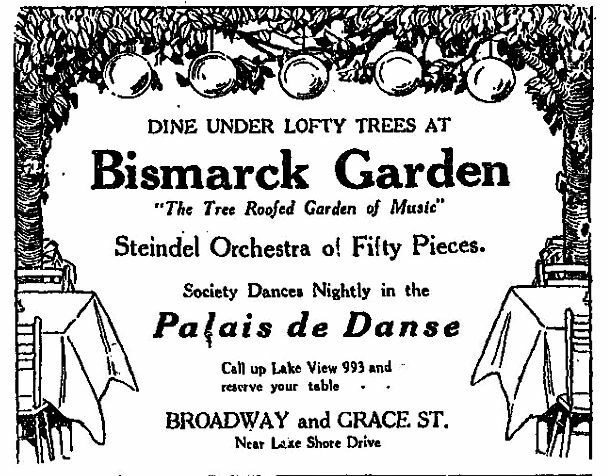 This particular article below mentions to the reader that Bismarck Gardens was the urban oasis and Ravina was the rural oasis of its day. 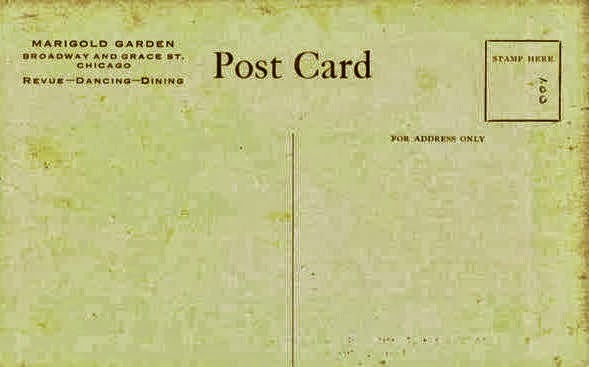 'DRY' Sundays - no booze. 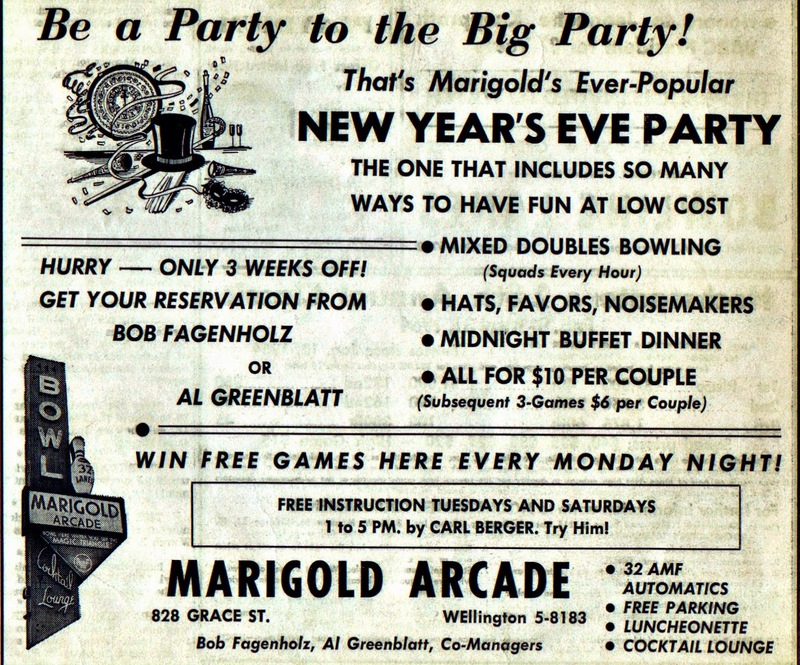 Interesting he chose an establishment that offered liquor on Sundays. 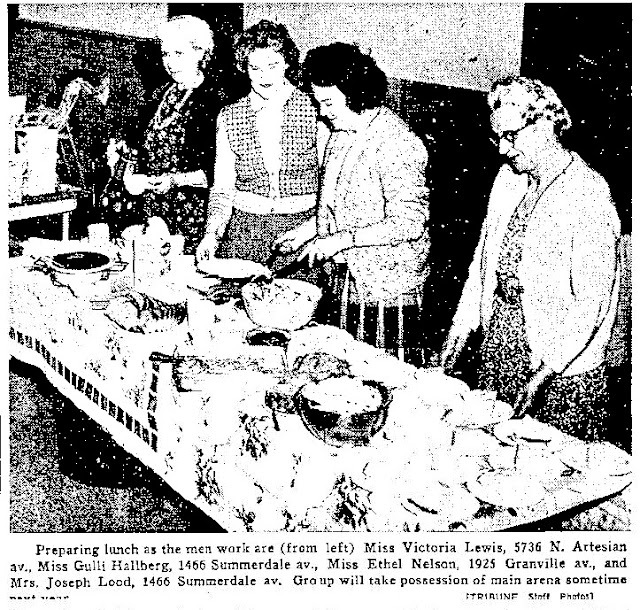 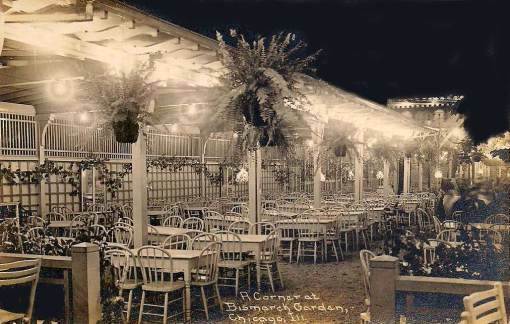 Sundays was the workingman's only day off; popular with the religious and women voters but not for the liquor establishments like the Gardens. The 19th federal amendment to the US constitution would follow some direr times for the Gardens. 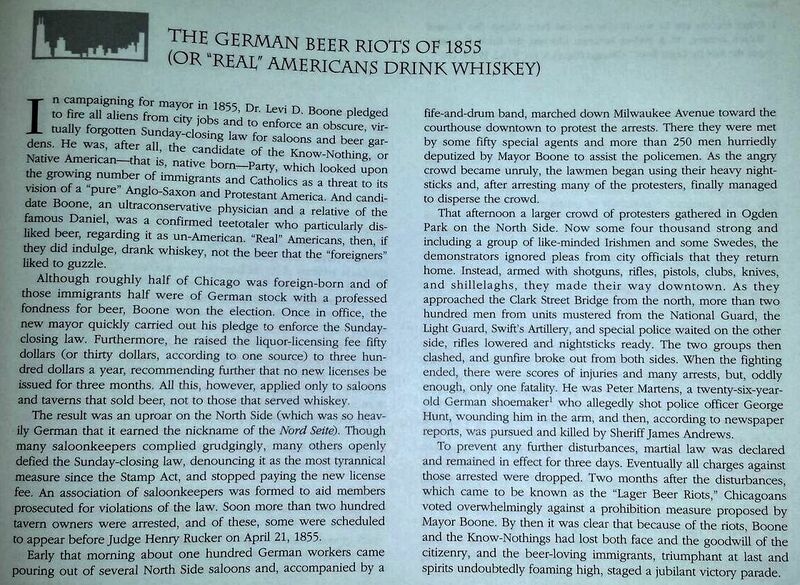 Months before the national rule was active the Mayor of Chicago agreed to no liquor on Sundays to conform with a State of Illinois that was recently passed. 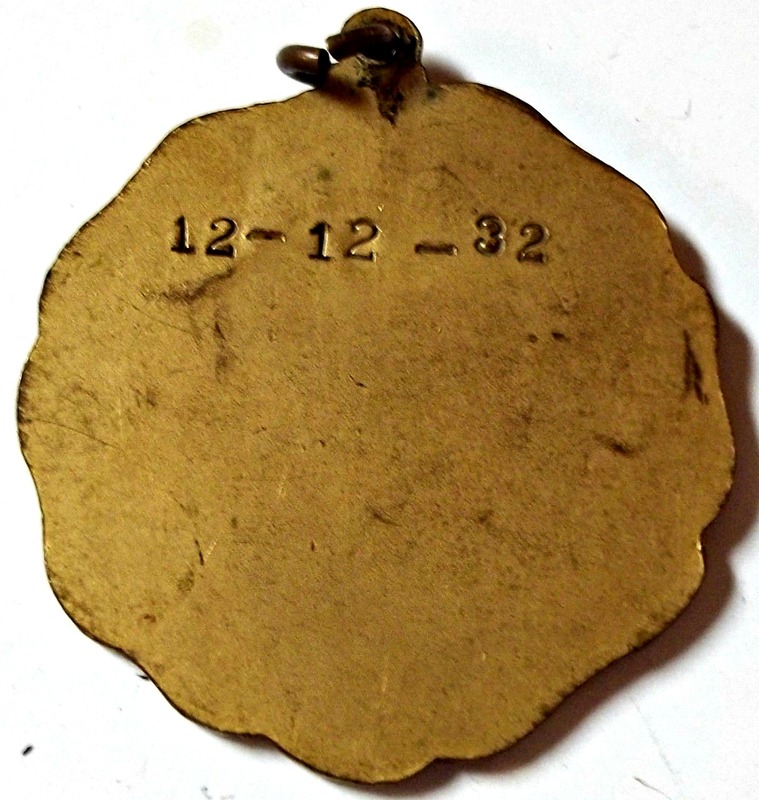 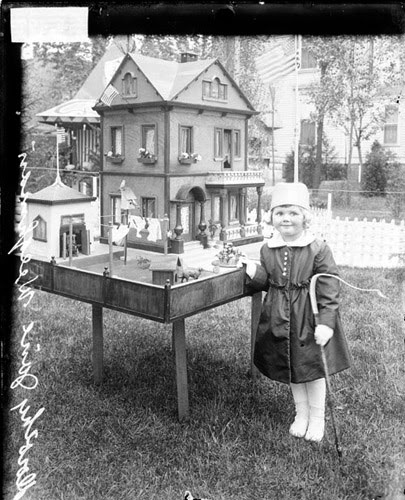 World War I years (1914-18) were years of difficult transitions for the Garden. 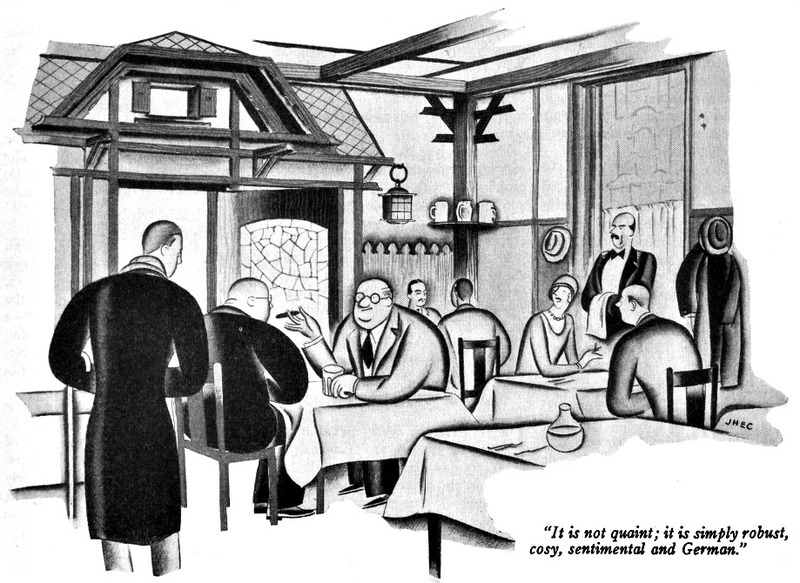 The establishment almost closed mostly due to animate anti-German attitudes of anything German world-wide. 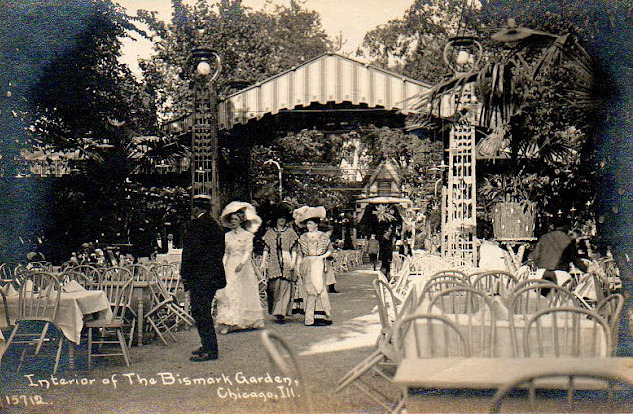 Bismarck Gardens was named after the first German Chancellor Otto Van Bismarck of the united Germany. In Great Britain the royal family, due to public pressure, the royal family changed their last name from Saxe-Coburg-Gotha (Sachsen-Coburg und Gotha in German) to an English surname - Windsor. 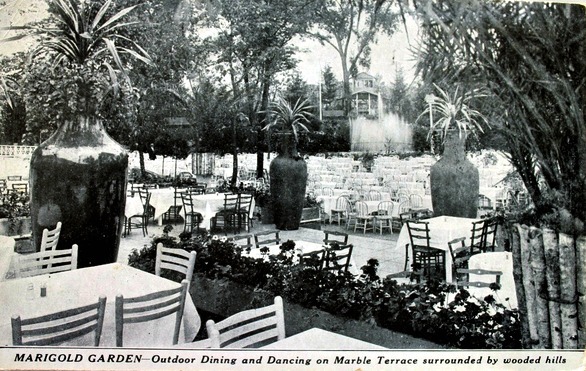 Apparently, the 'gardens' popularity during the war years was the beginning of decline. 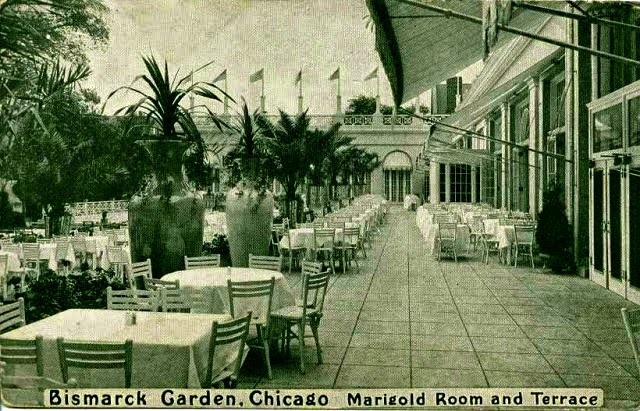 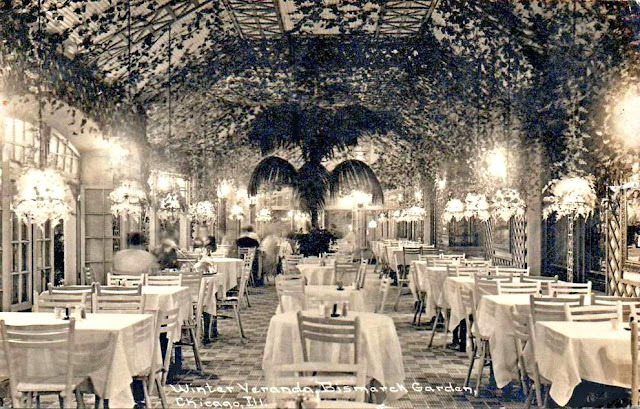 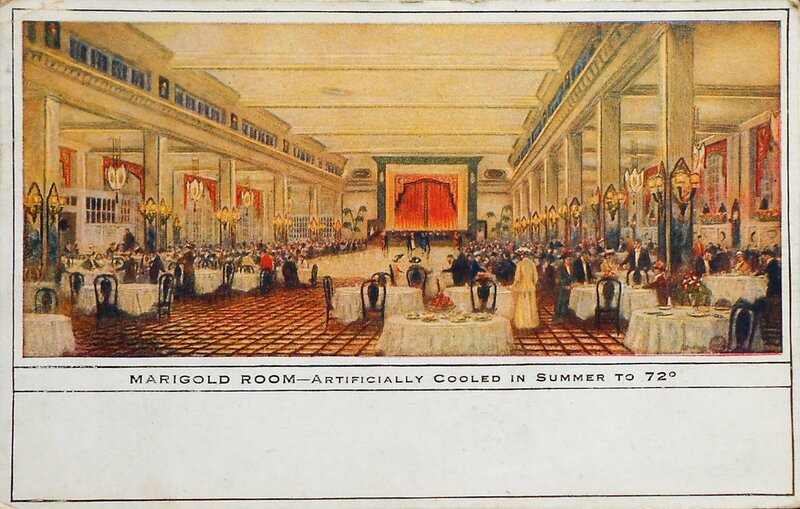 During the war years the Gardens owners changed the name to an English sounding name - Marigold Gardens - named after one of their enclosed dining areas their renovated in 1916. 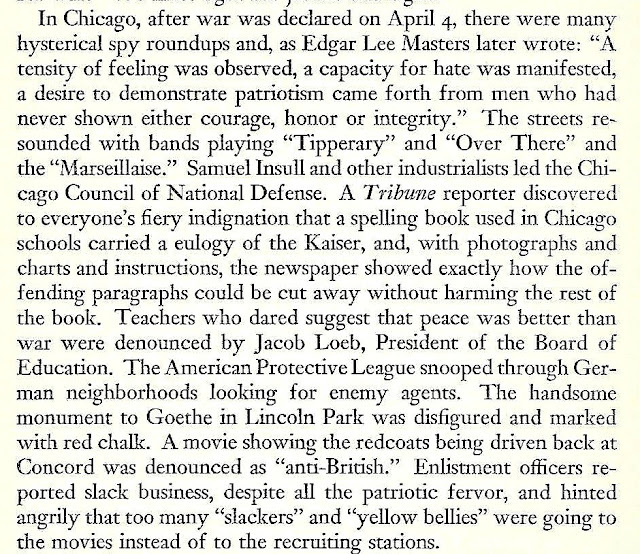 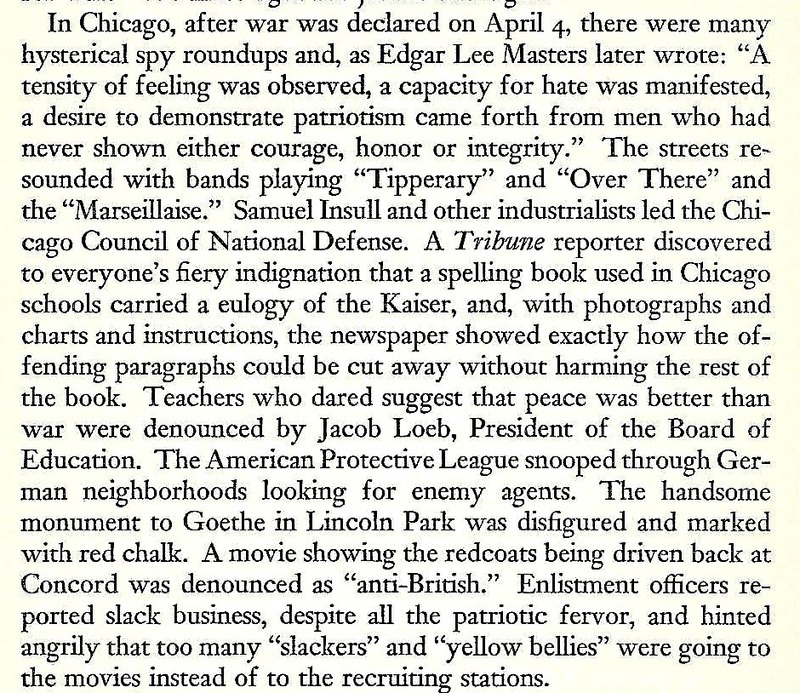 The Preparedness Movement 1915-1916 evolved from German Empire eagerness to have Republic of Mexico join the European War against the United States entry to the European war - this did not help German-American establishments in America. 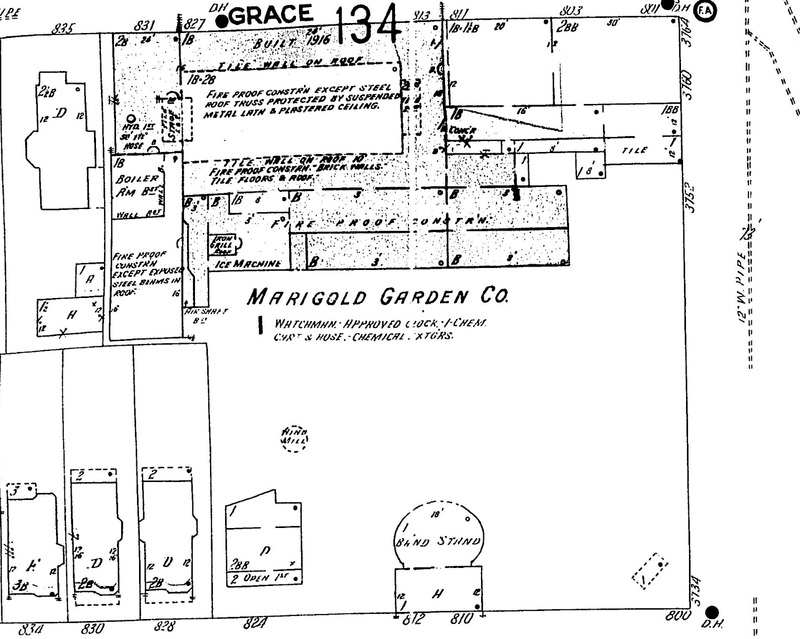 1923 Marigold Gardens is CLOSED! 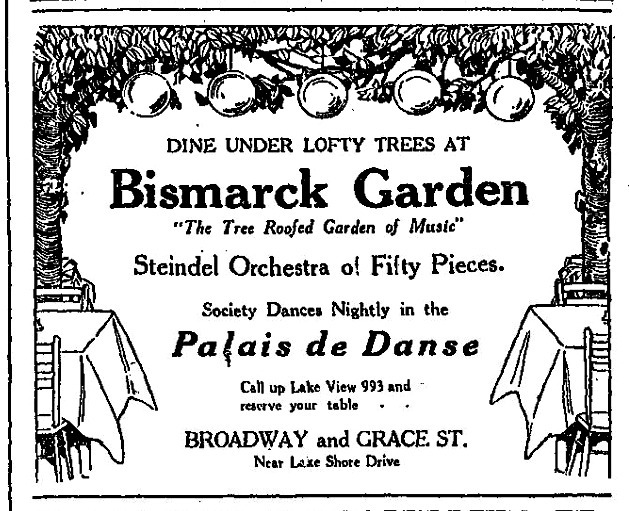 Apparently during the late 1920's this music venue went through a lot of management & name changes. 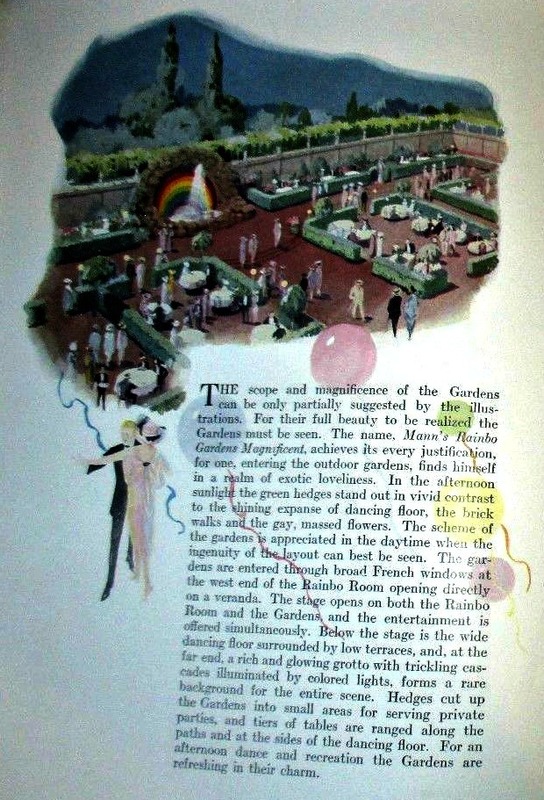 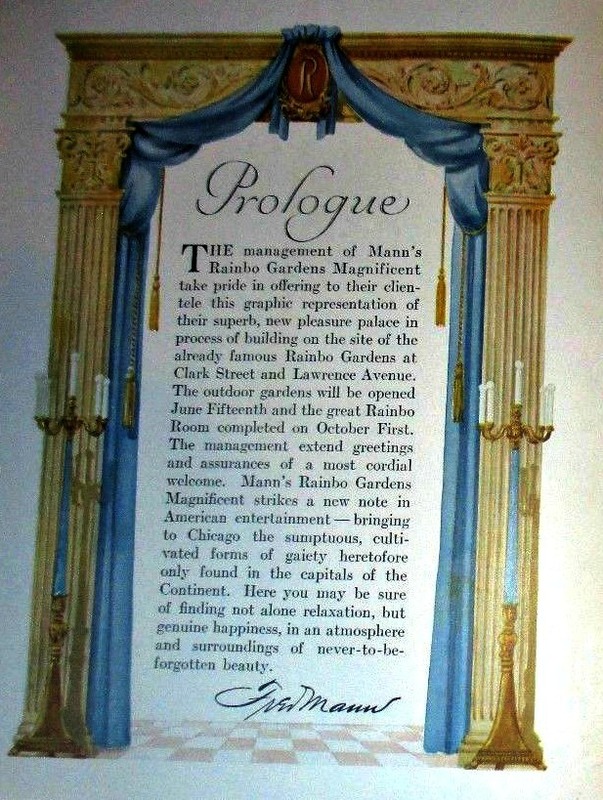 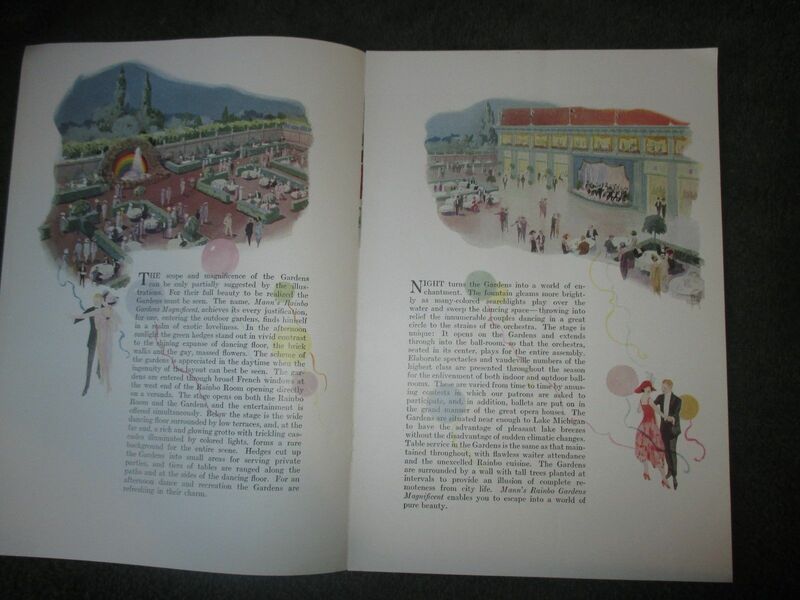 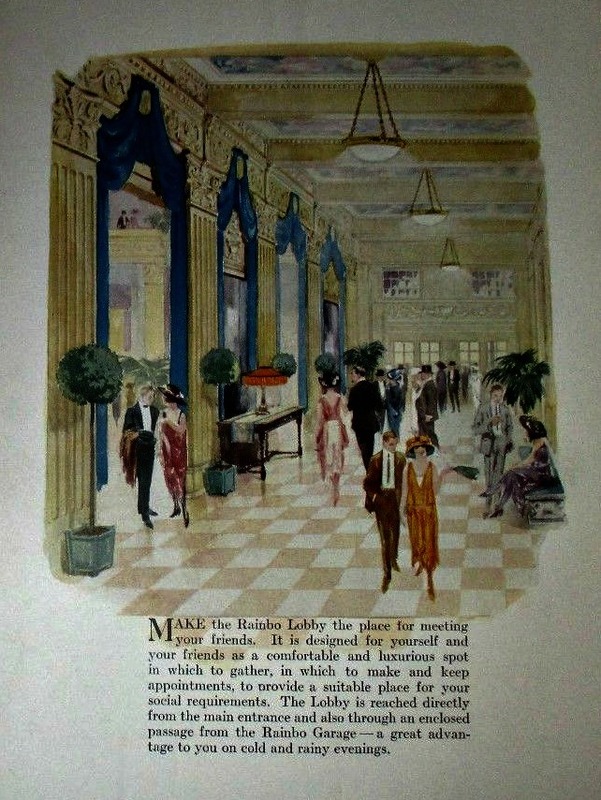 For a brief time period the old gardens became known as Vanity Fair ... apparently twice closed and then reopened. 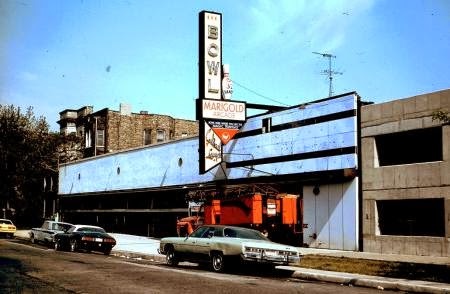 and the Foremost Liquors by 1966. 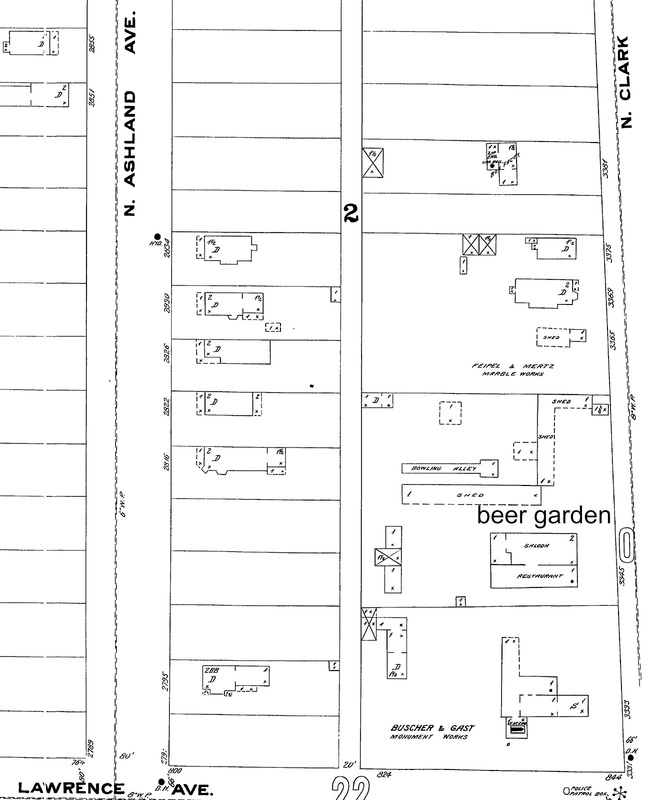 According to this interactive aerial photography (1962-1973) the most buildings and garden structures of the beer garden space had disappeared or had been replaced with a parking lot and a Ihop. 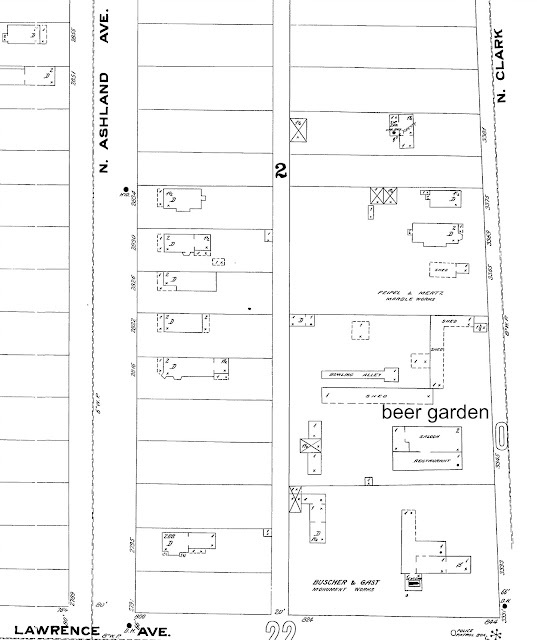 This is the original proposed 'planned development' for what was picnic grove area of Bismarck/Marigold Gardens. 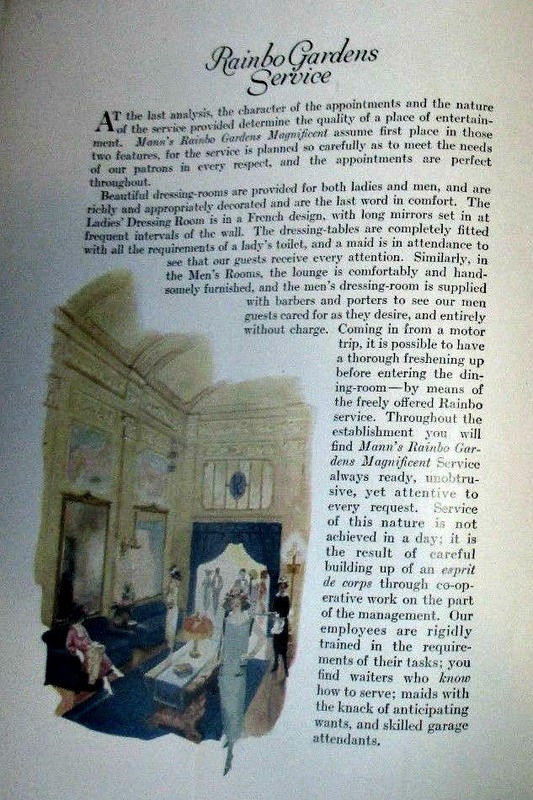 The grayish dwelling drawing at the top right was the Marigold Room. 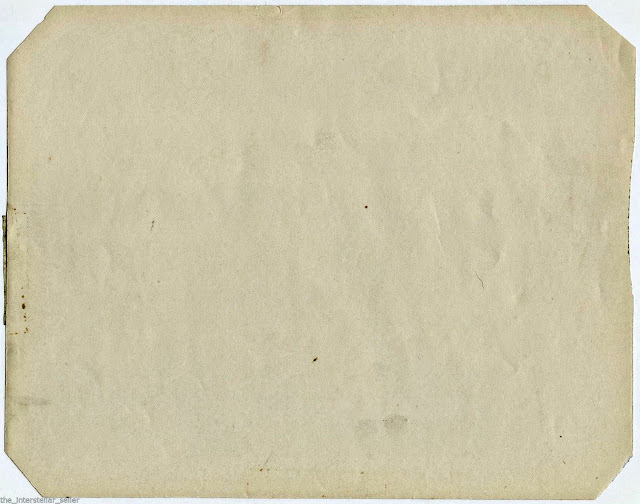 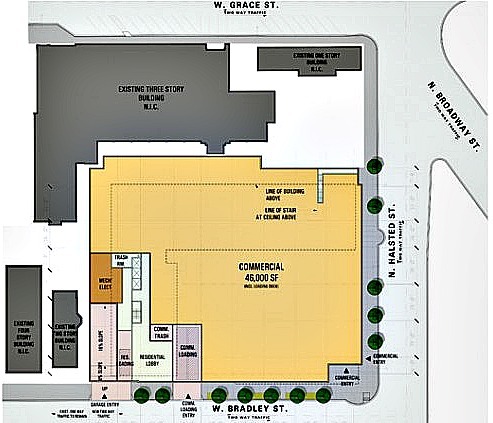 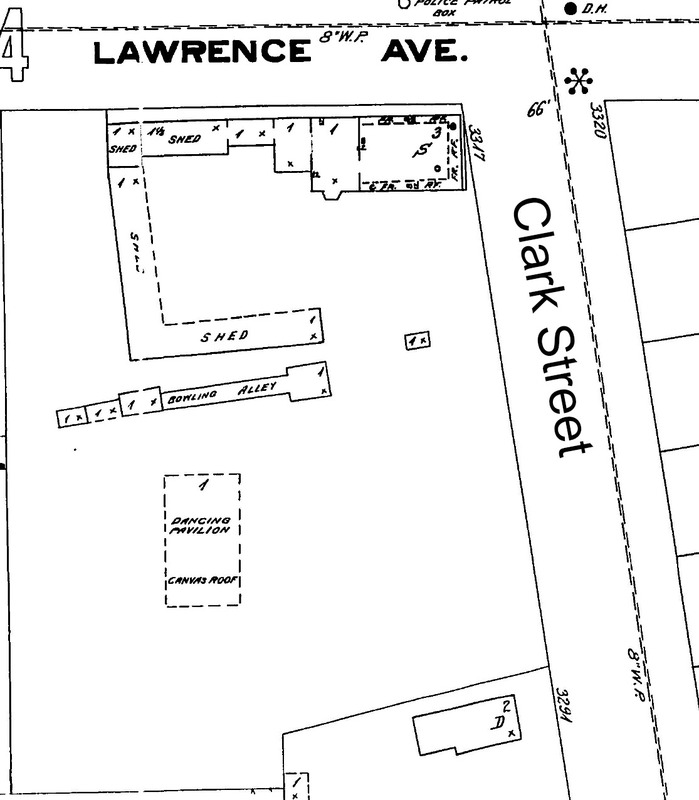 The small grayish drawing next to it is the pancake house where the initial beer garden building stood. 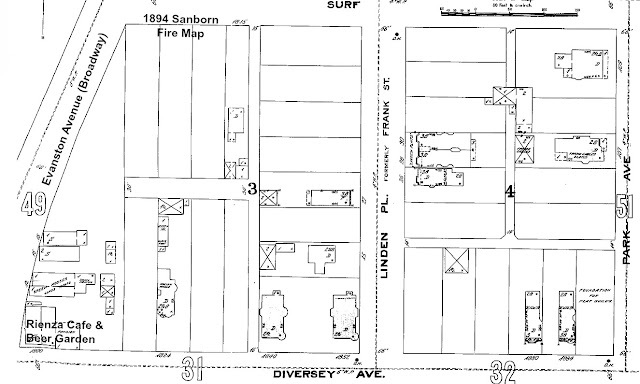 The grayish dwellings are not part of the proposed development. 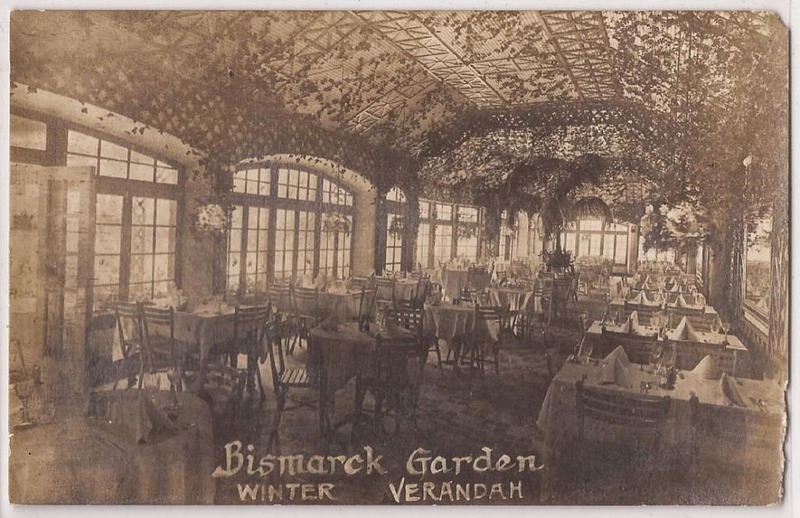 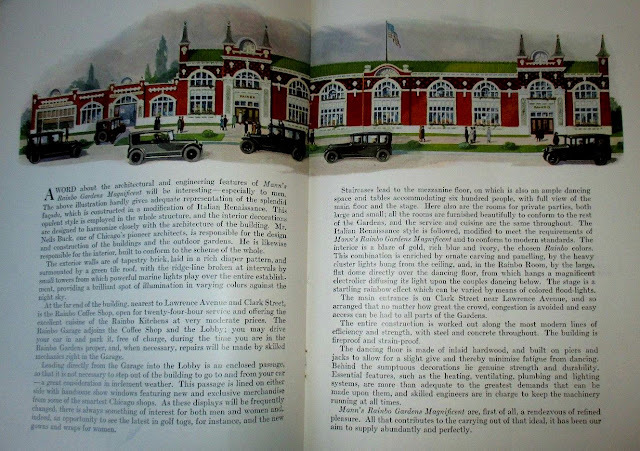 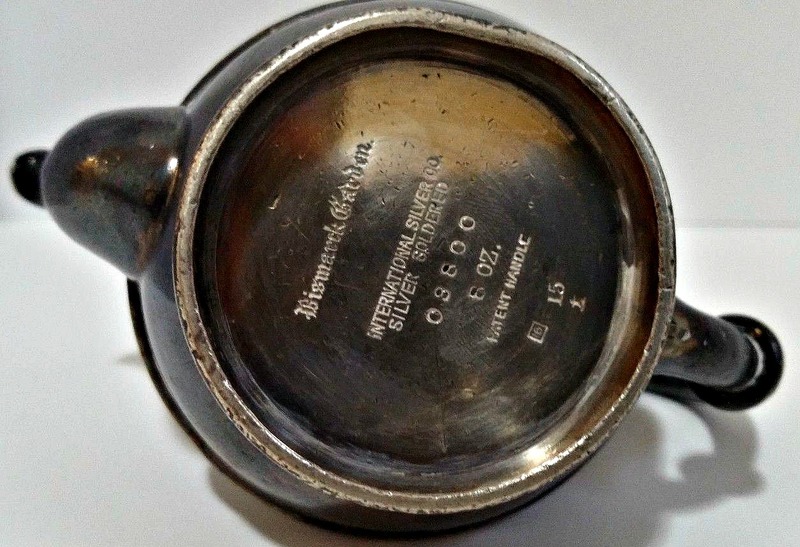 As mentioned in the beginning of this post the Eitel brothers owned other properties such as the Bismarck Hotel. 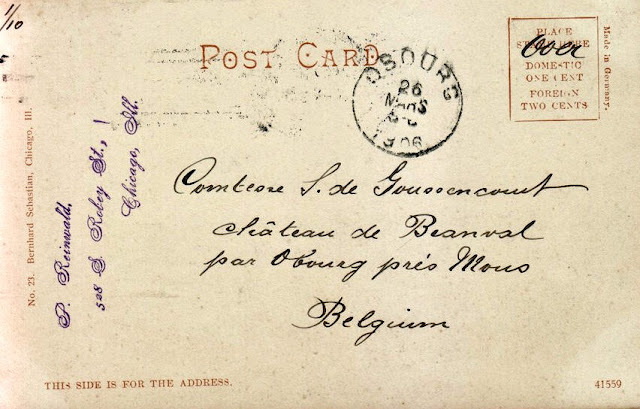 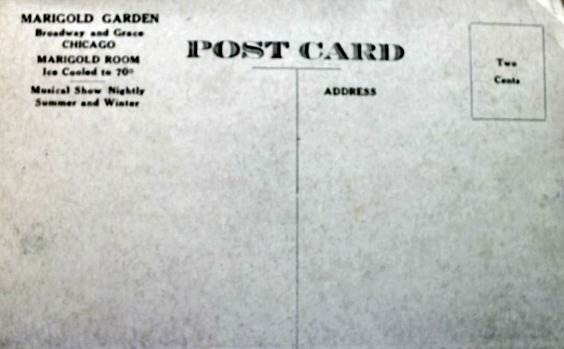 This is a postcard image of the original hotel from 1894 until 1924 with same timeline as the Bismarck Gardens. 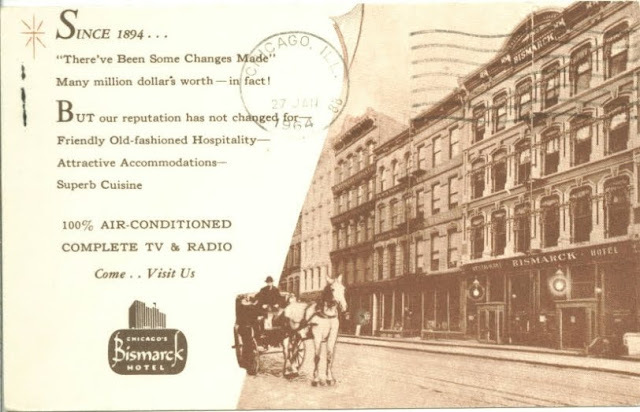 The hotel was located @ on Randolph Street, between LaSalle & Wells. 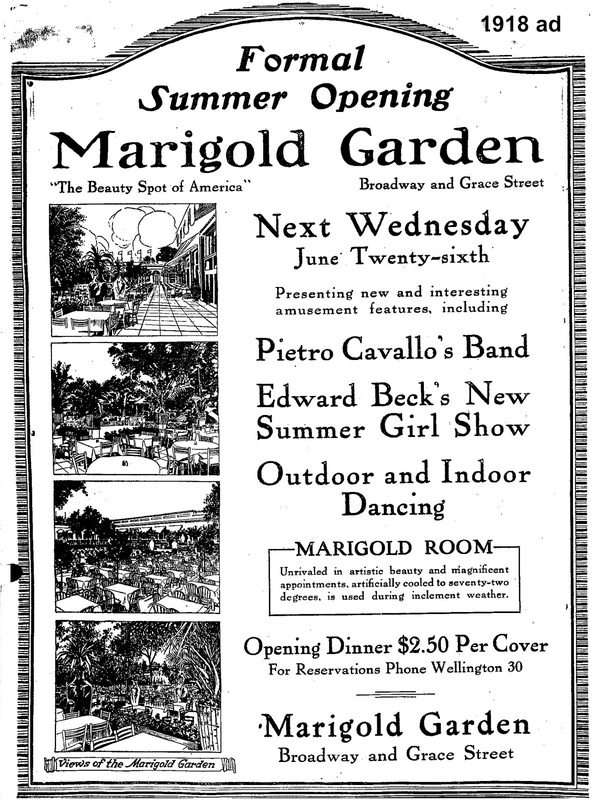 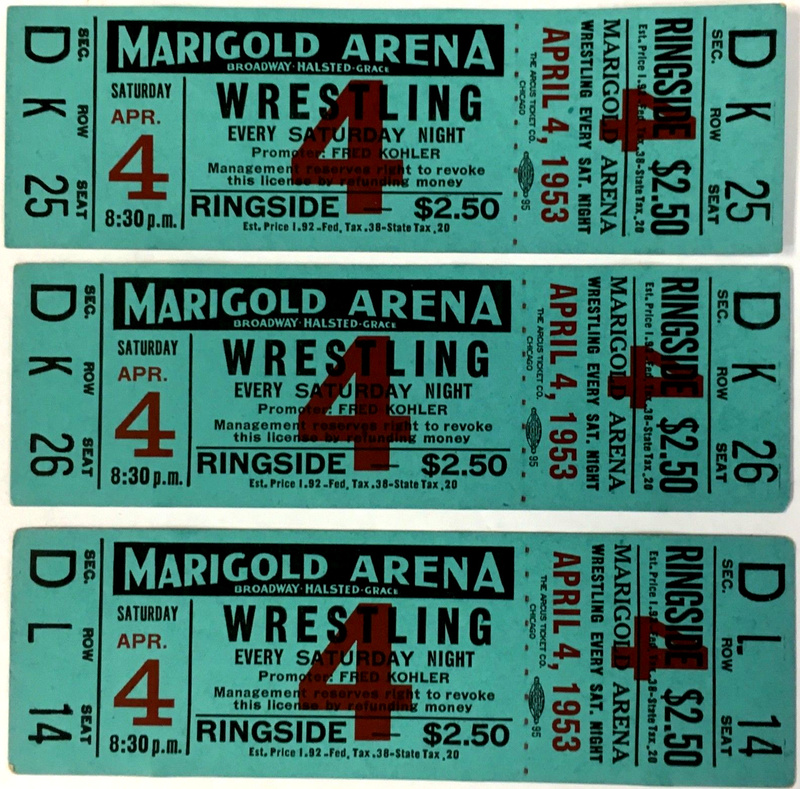 Across the street to the old gardens was Marigold Arcade and Bowling. 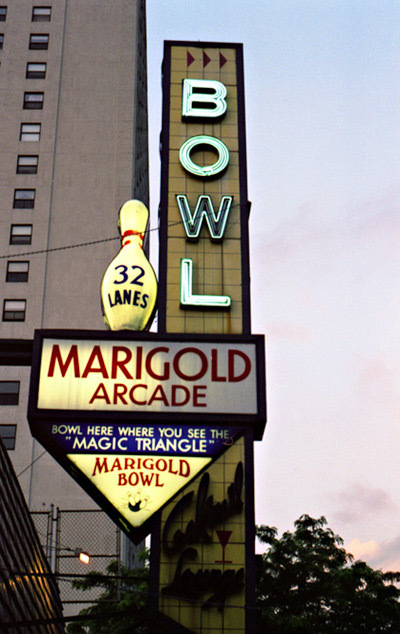 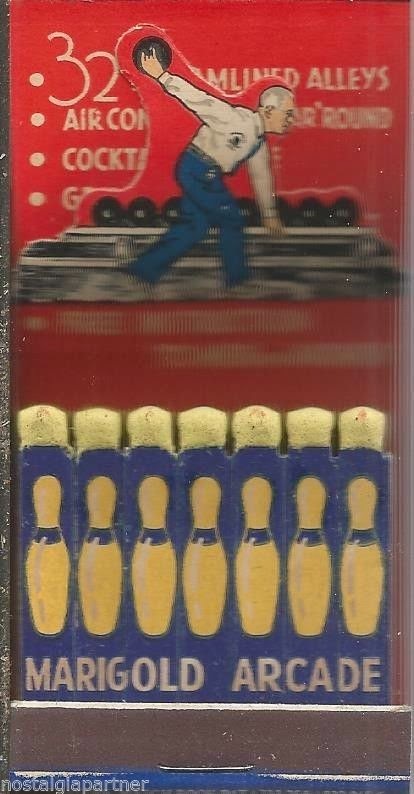 The name lived on throughout the 20th century from 1941-2004 before this bowling alley-arcade was replaced with condos. 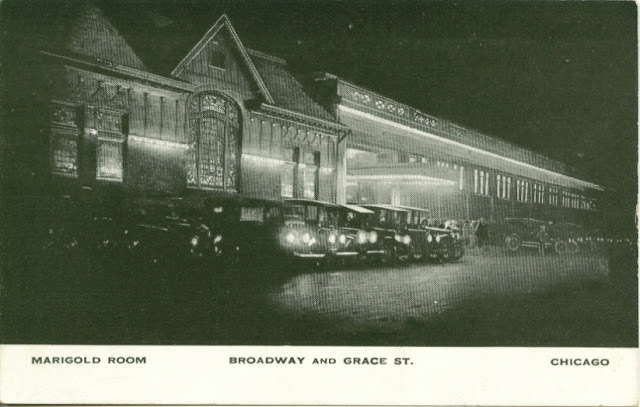 The arcade was located across the street from Bismarck Gardens on Grace Street. 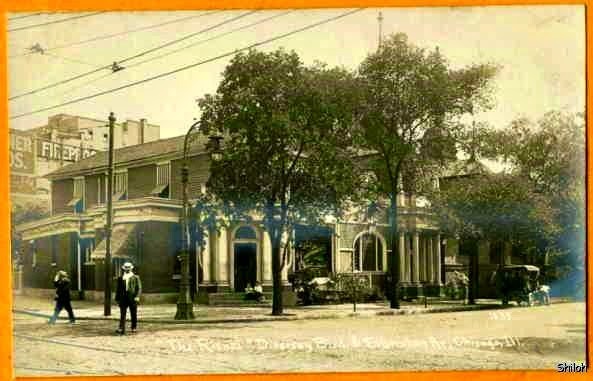 By 1923 the Old Town Hall has been replaced by a modest police station but referred to as the Old Town Hall. 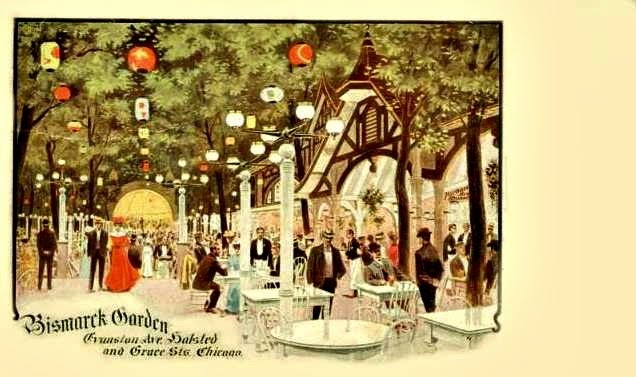 This preWorld War I establishment was named after Kaiser Wilhelm I, who along with Otto Van Bismarck united all of Germany by 1871 - a growing German population in U.S. 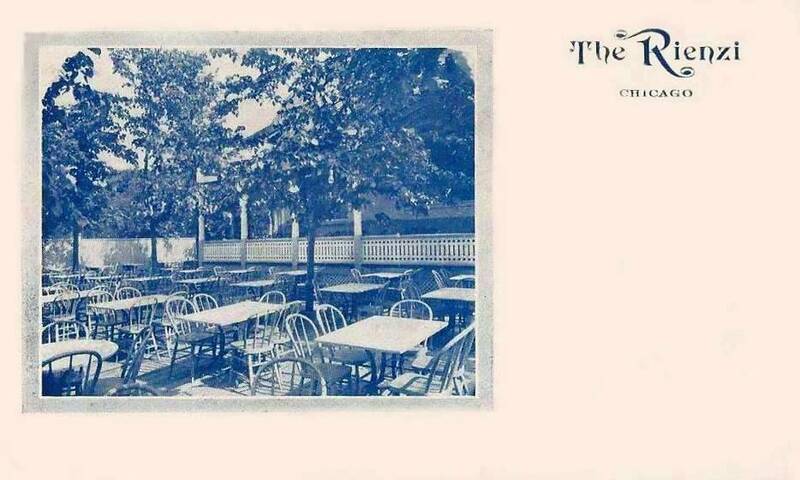 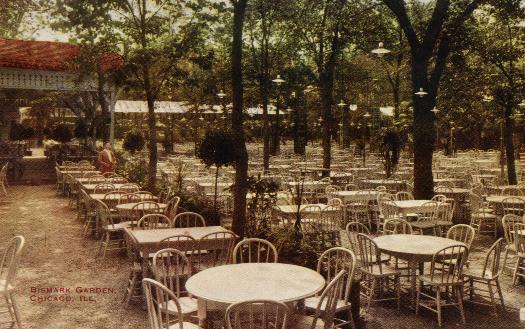 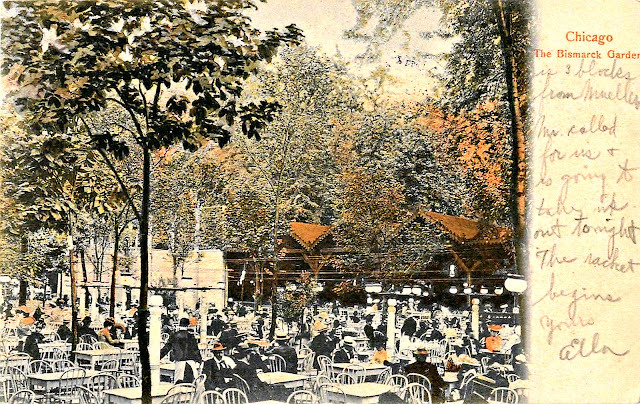 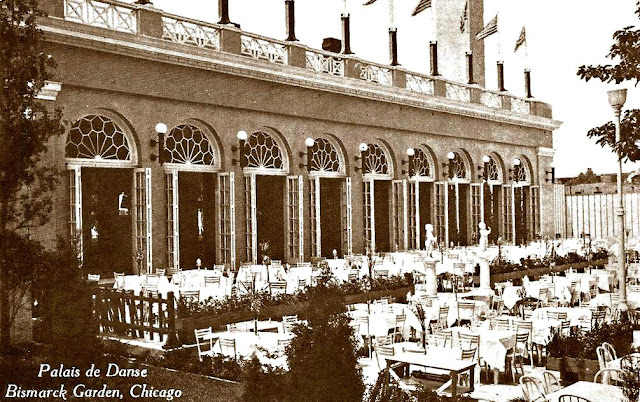 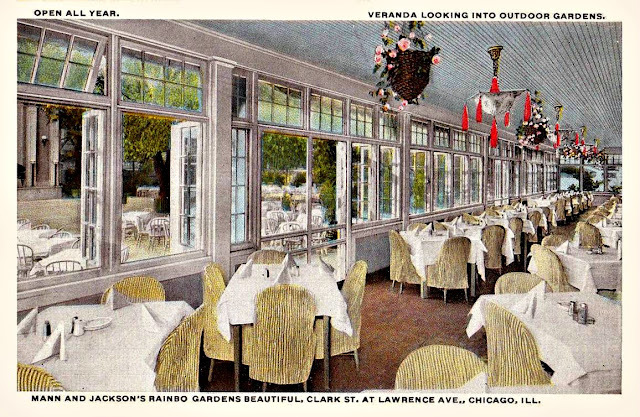 The Rienzi Cafe and Beer Garden was located at east of Evanston (Broadway) Avenue and Diversey (Boulevard) Parkway. 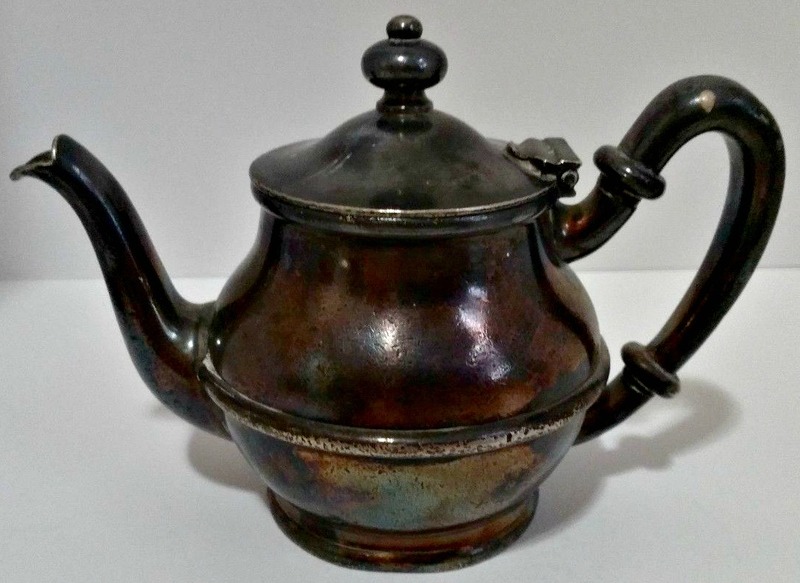 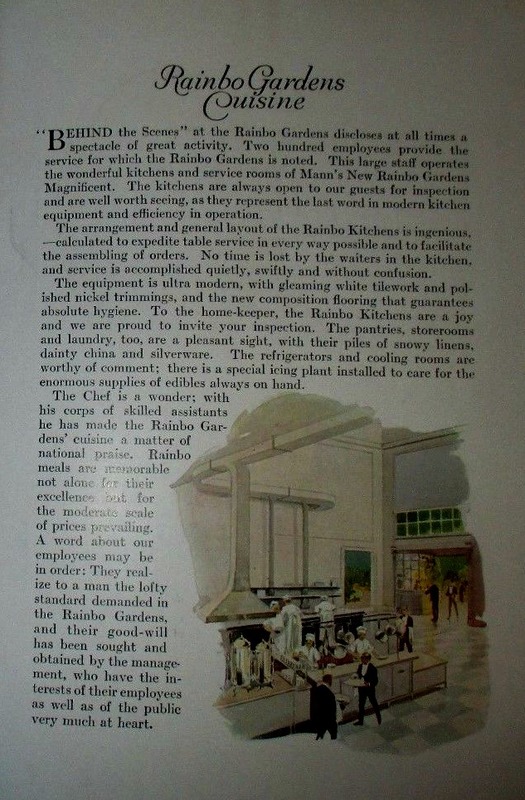 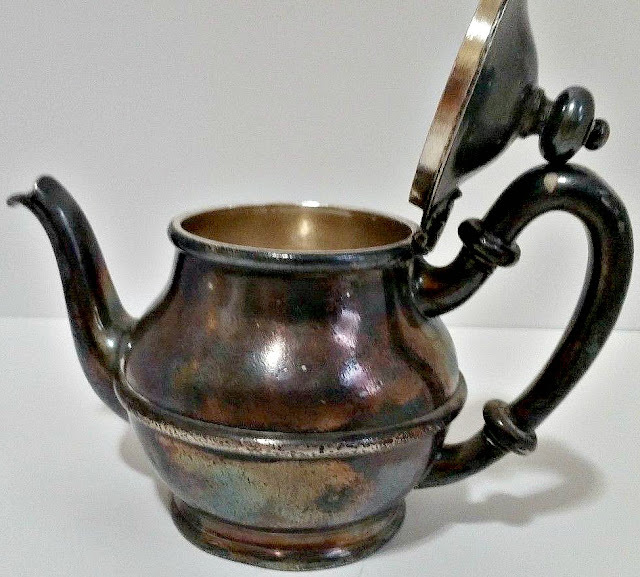 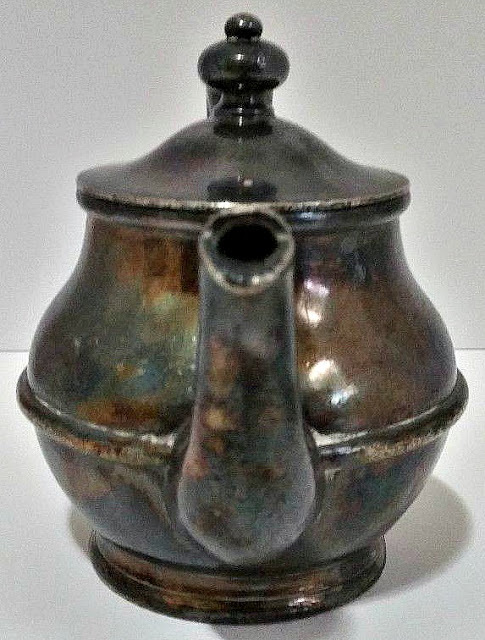 Emil Gasch was the owner and proprietor. 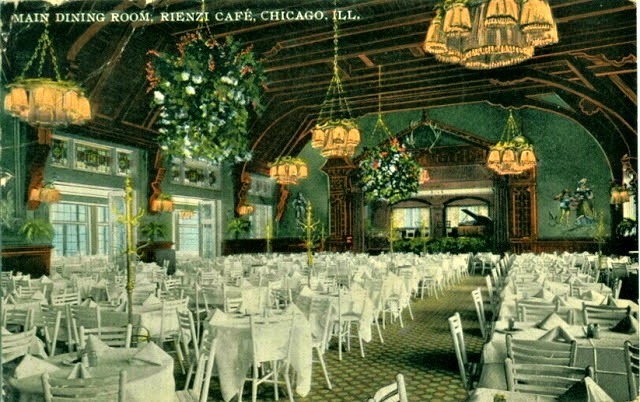 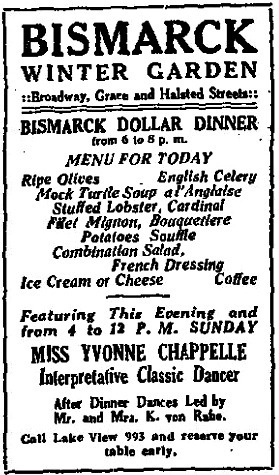 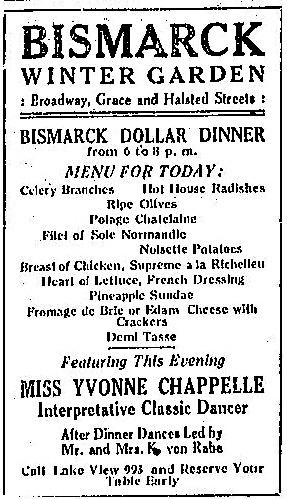 The cafe was open from 1901 to at least 1916, according to a news report about a death at the restaurant printed in the July 13, 1916, issue of the Logansport Pharos-Tribune. 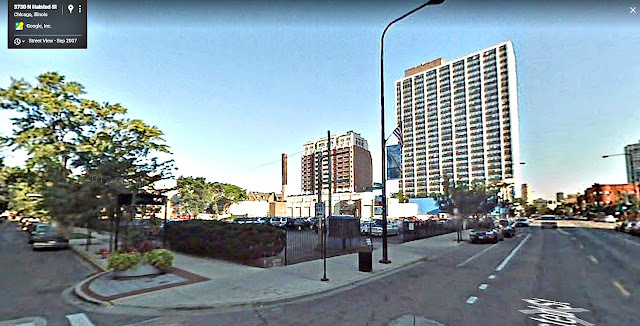 The Lincoln Park Plaza currently occupies this location. 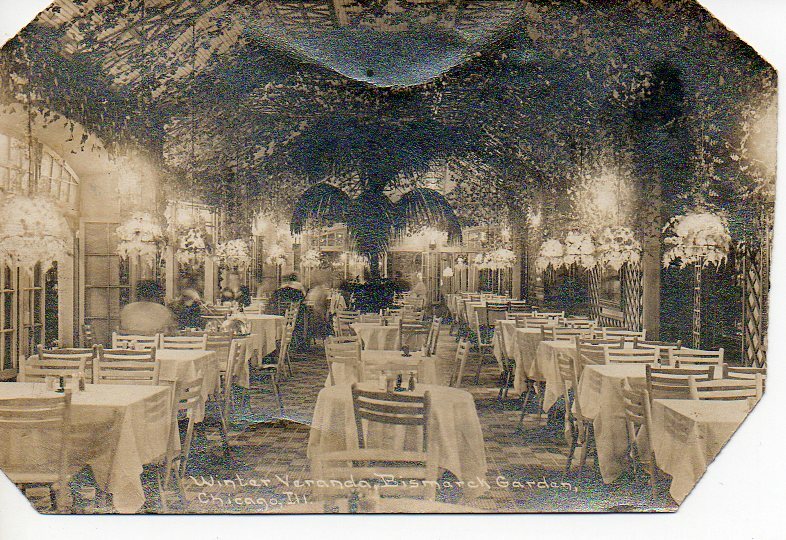 and maybe the original cafe west of it. 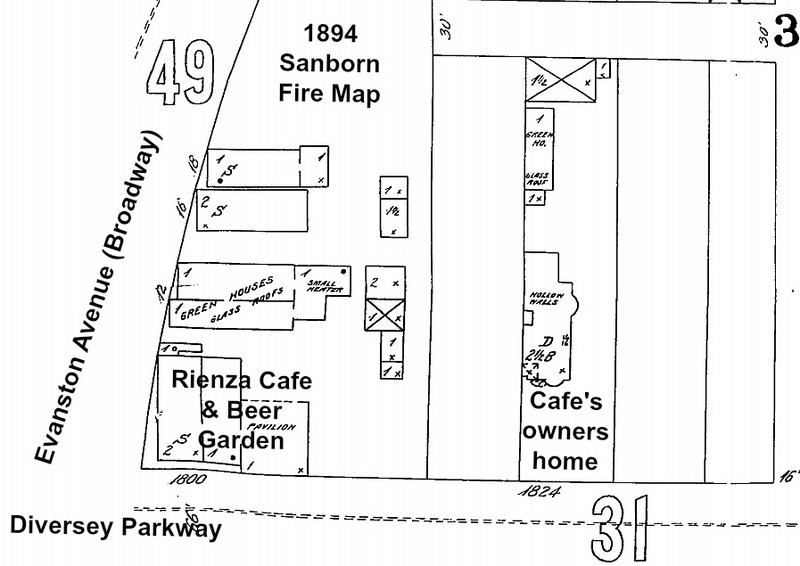 The cafe is not indicated on the 1894 map. 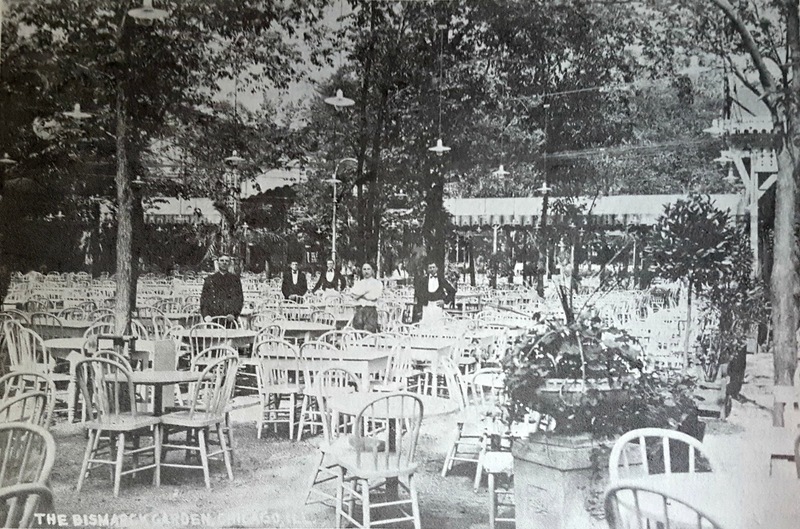 From this same spot in 1860 stood the mustering Civil War Camp called Camp Fry that was once referred to as the area of Wright Woods and later the subdivision of Wright Grove. 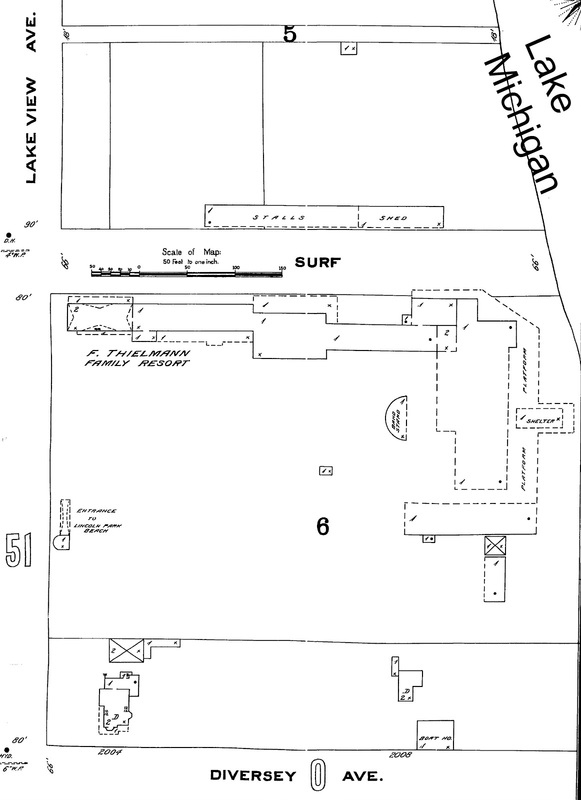 to several references discovered online. 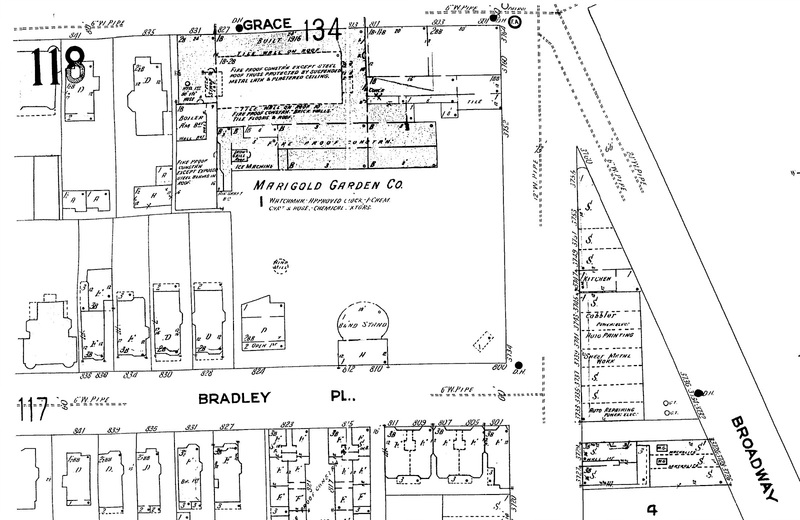 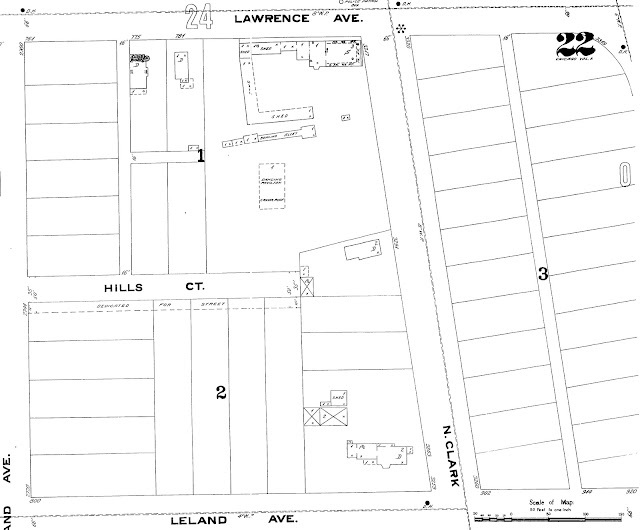 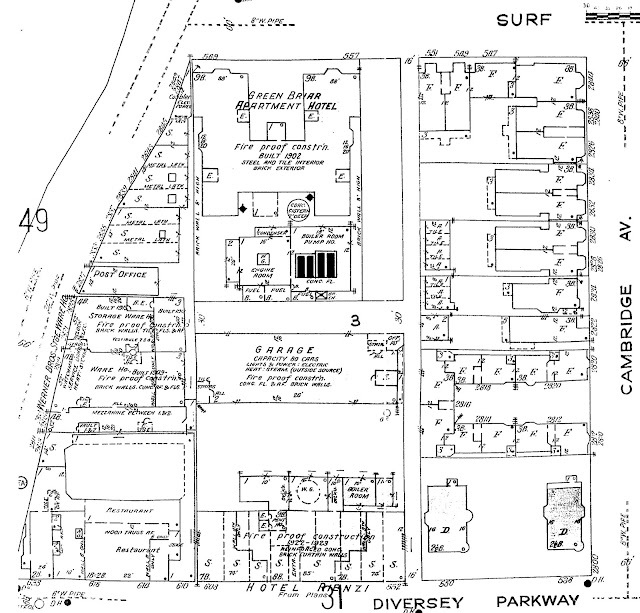 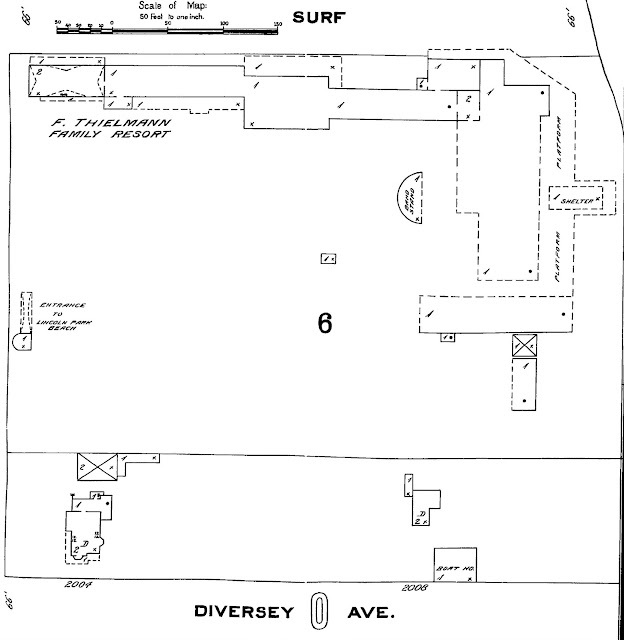 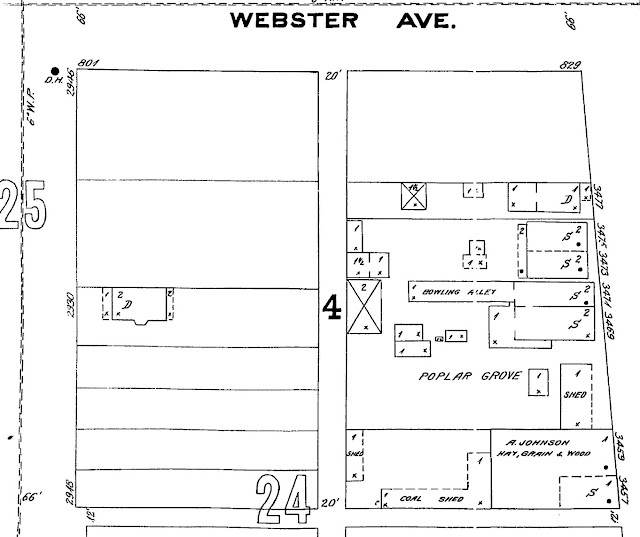 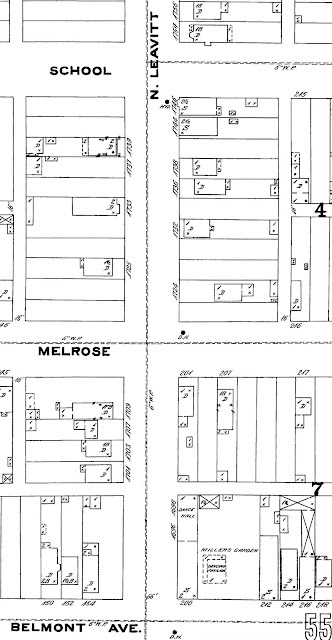 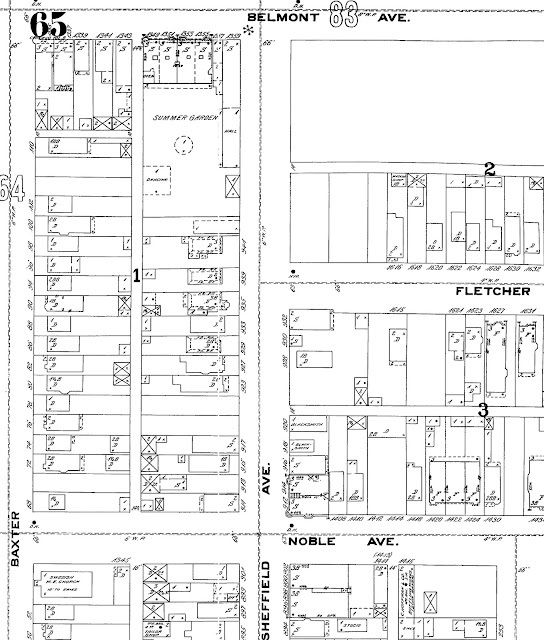 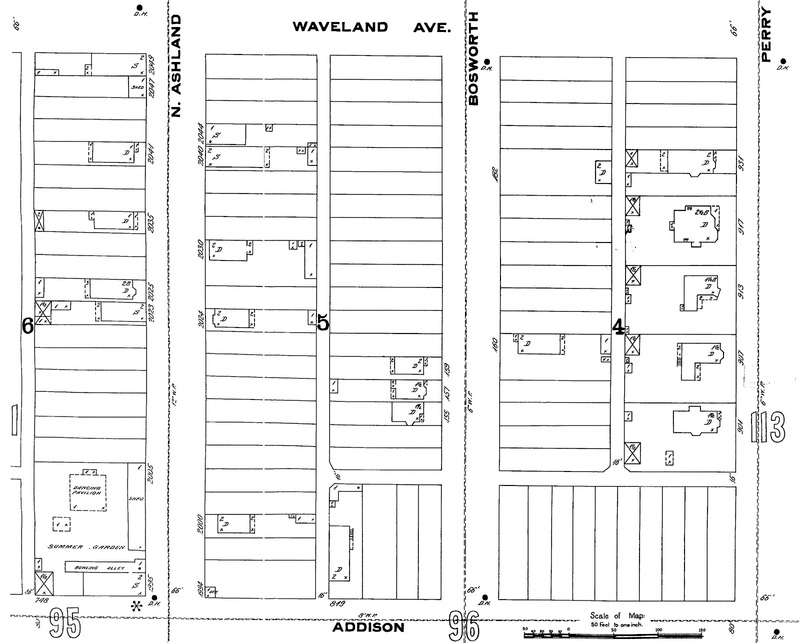 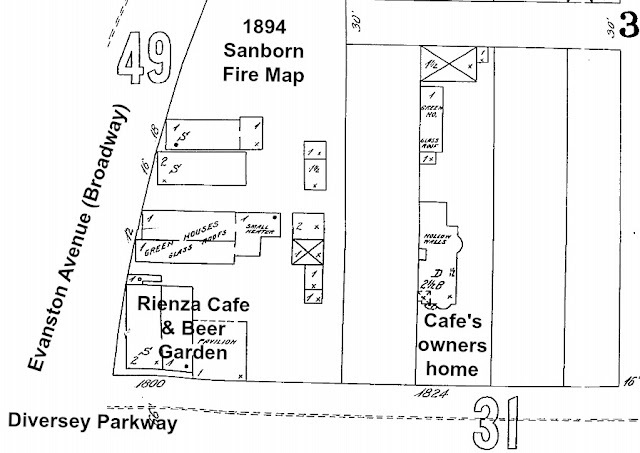 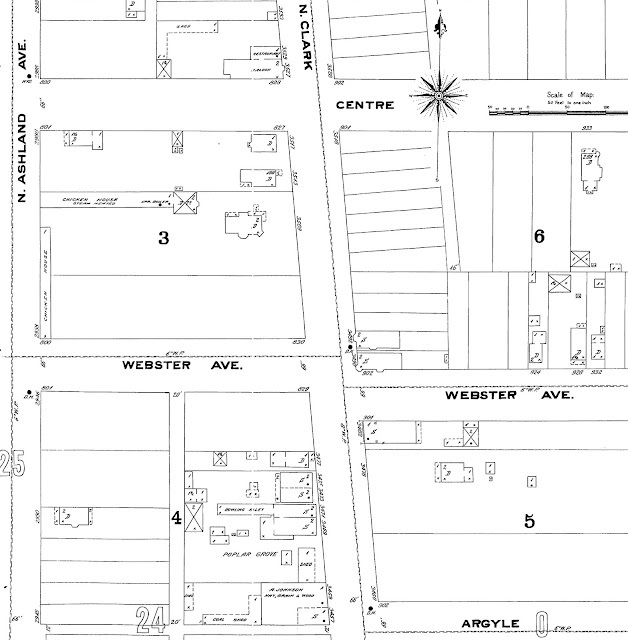 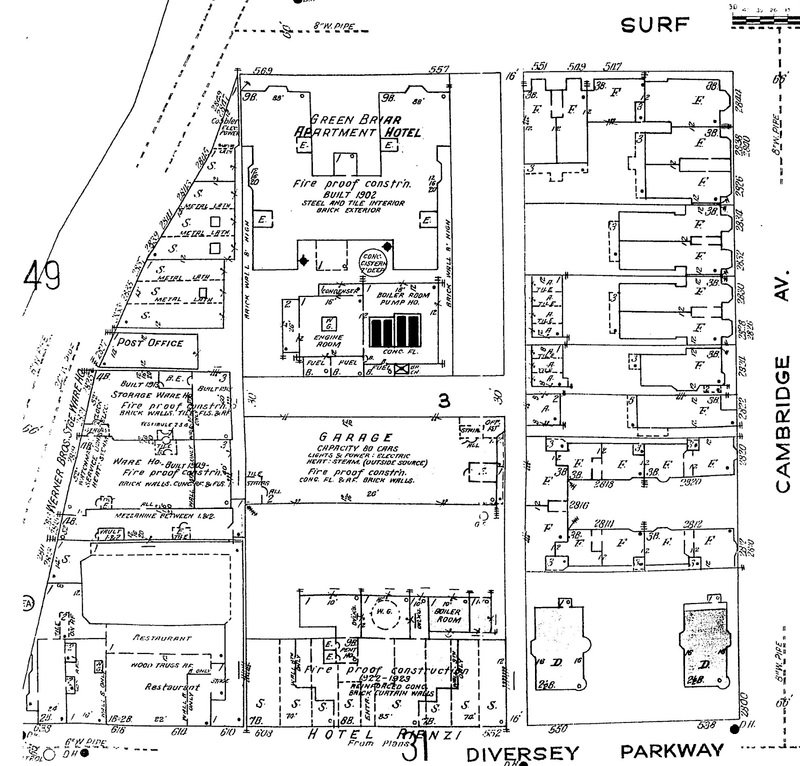 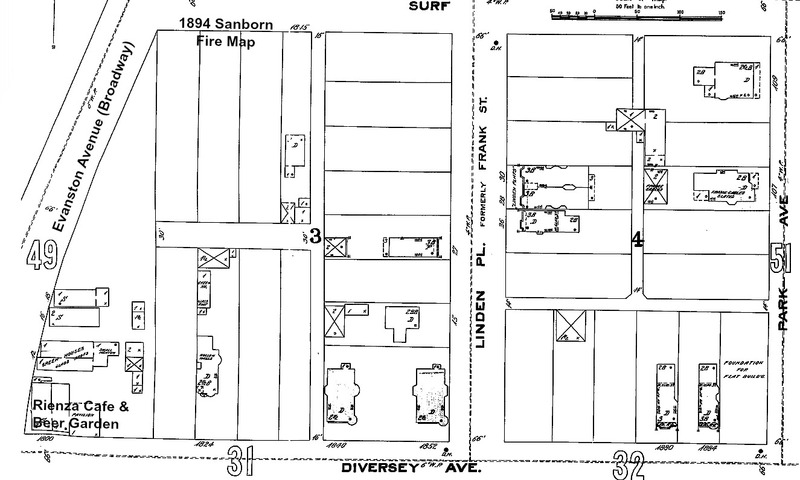 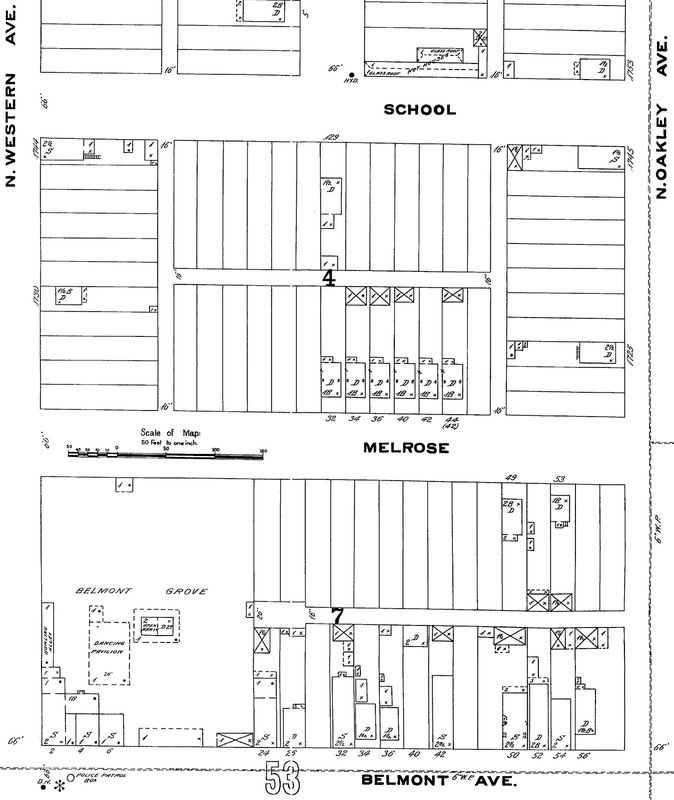 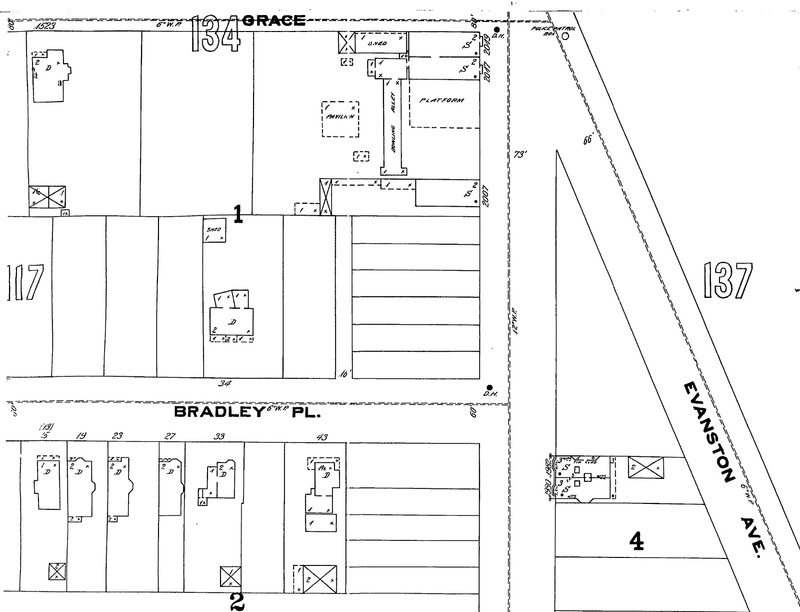 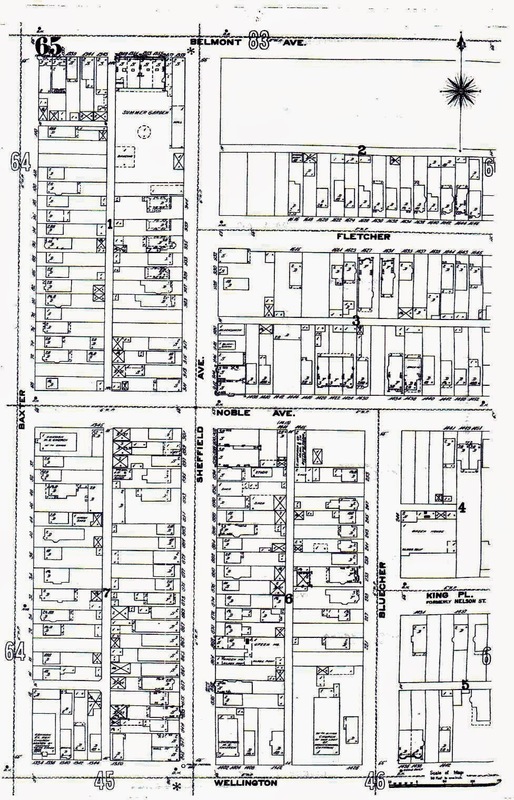 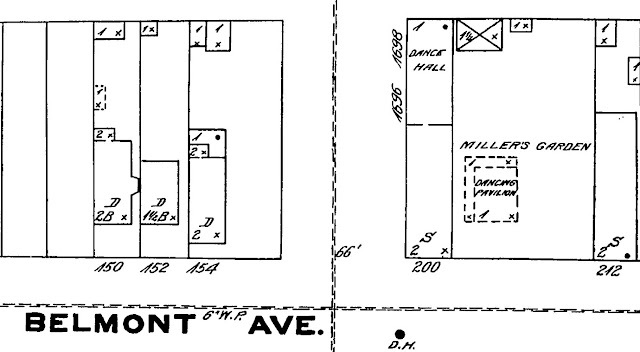 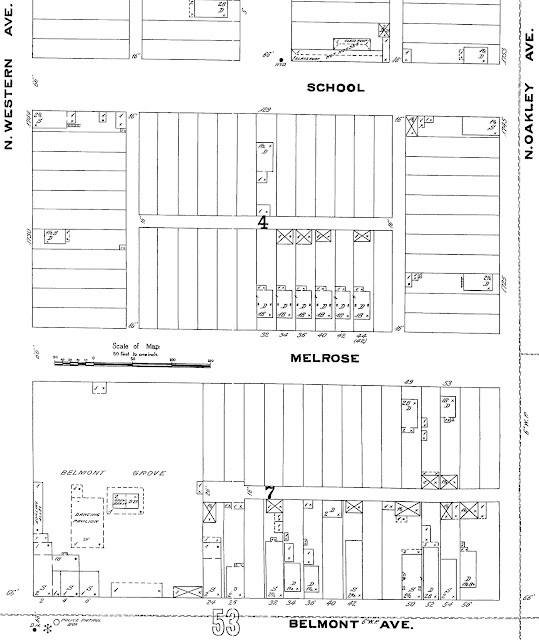 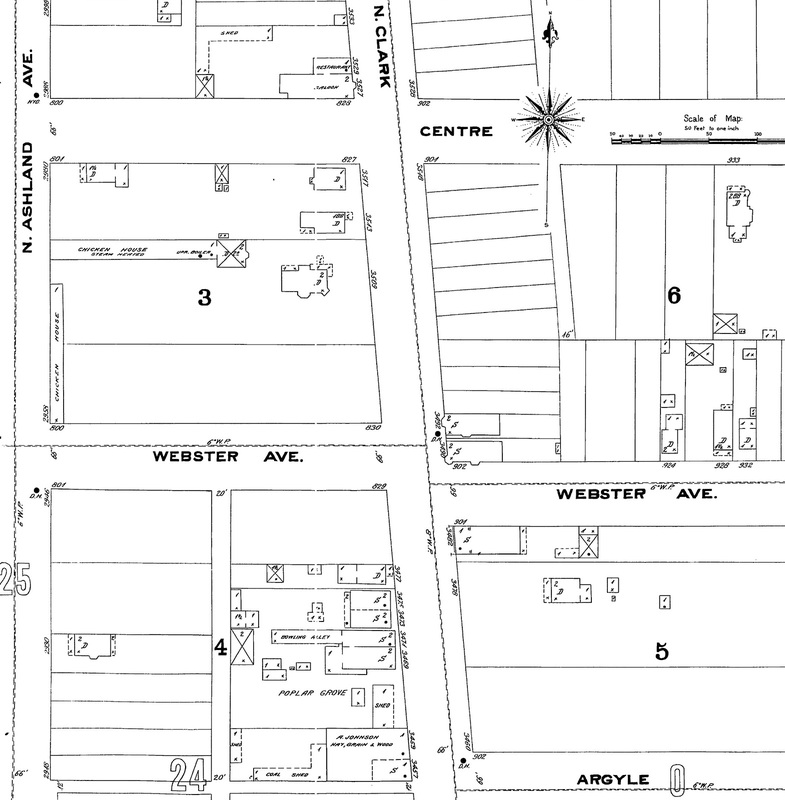 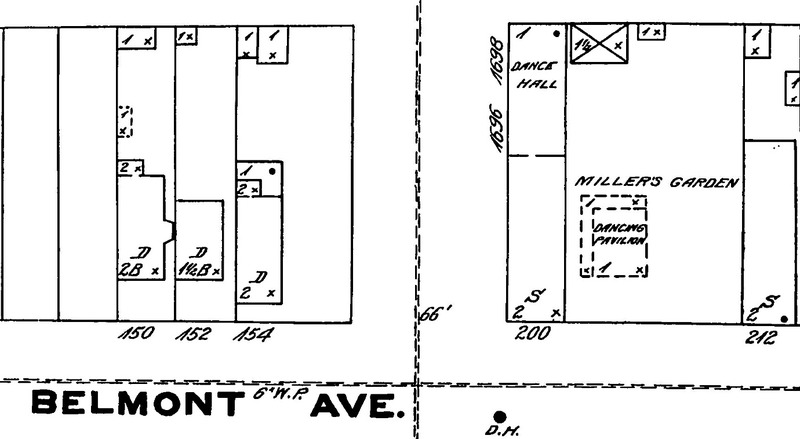 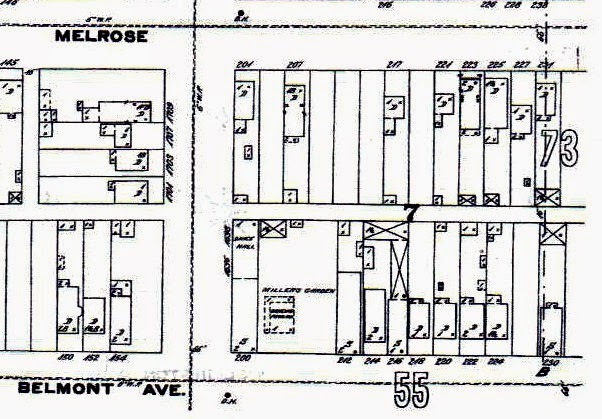 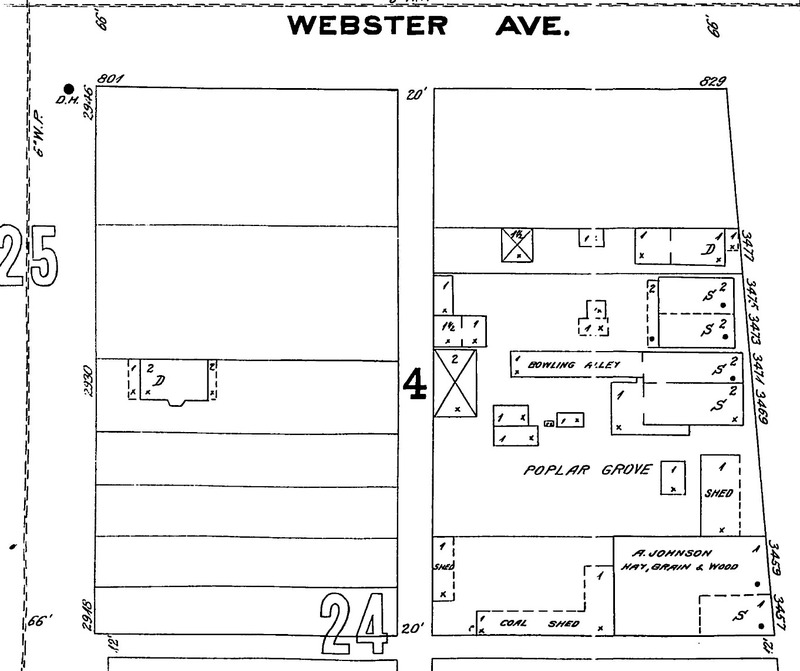 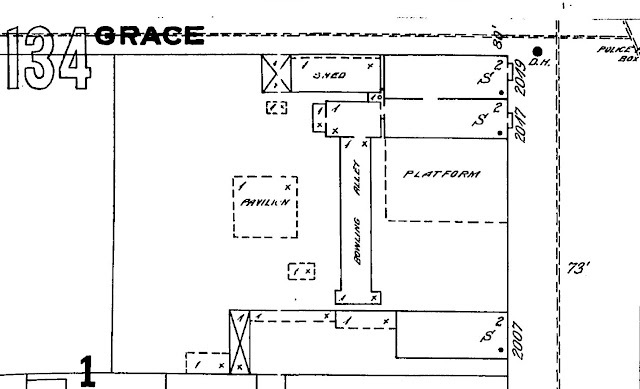 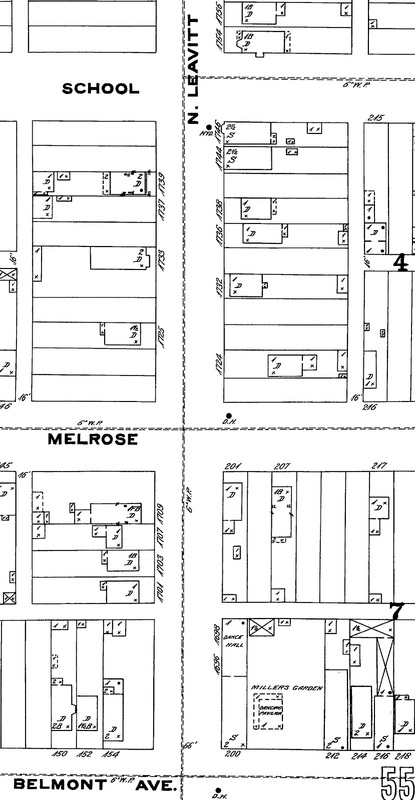 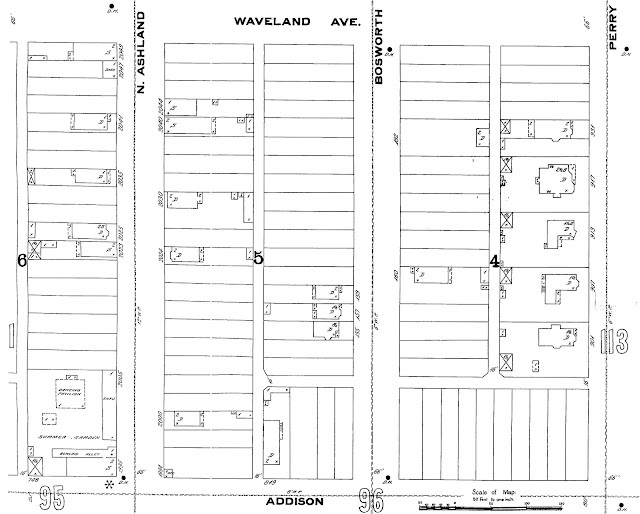 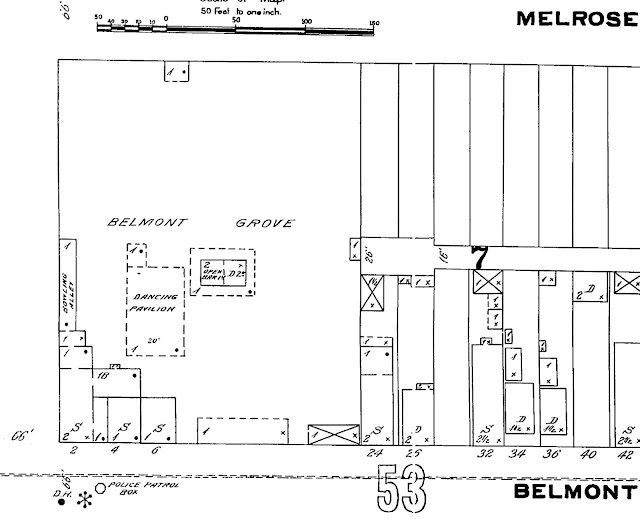 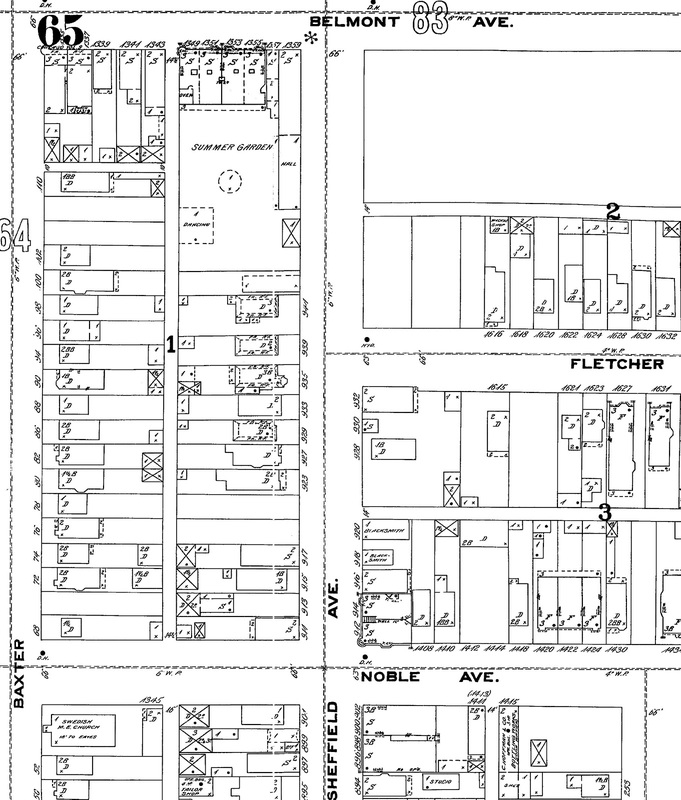 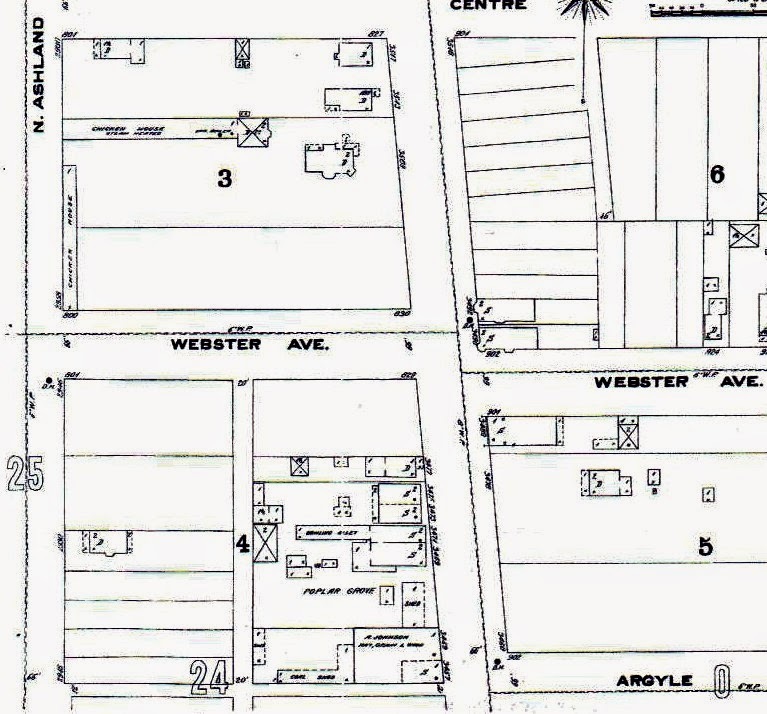 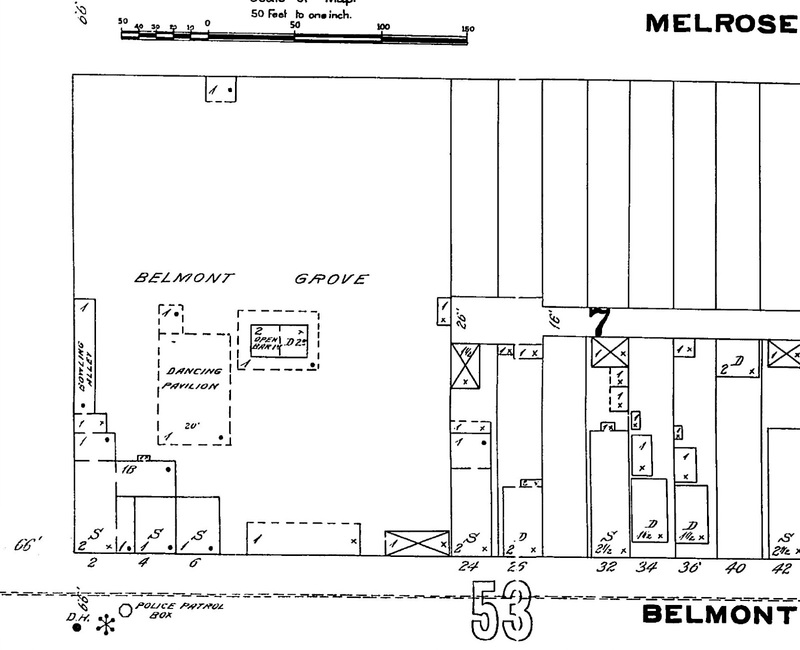 The 1894 Sanborn Fire Map below indicates that this established was once a tavern/restaurant with a bowling alley on the property along side sheds for the horses. 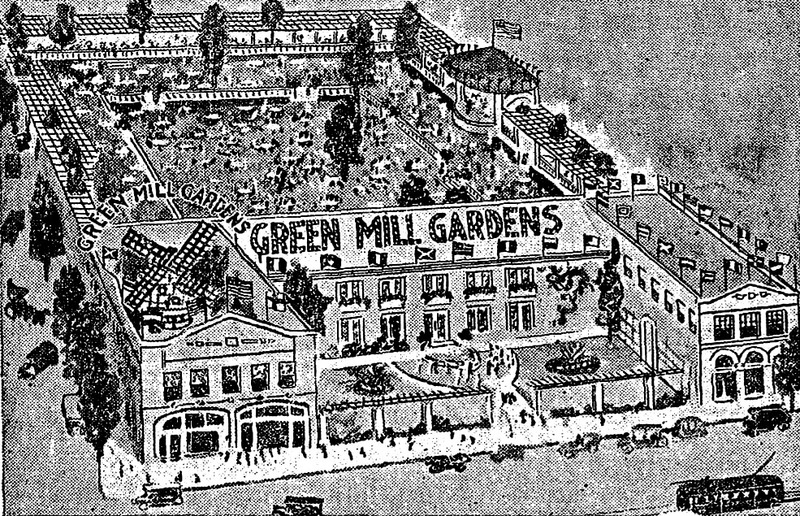 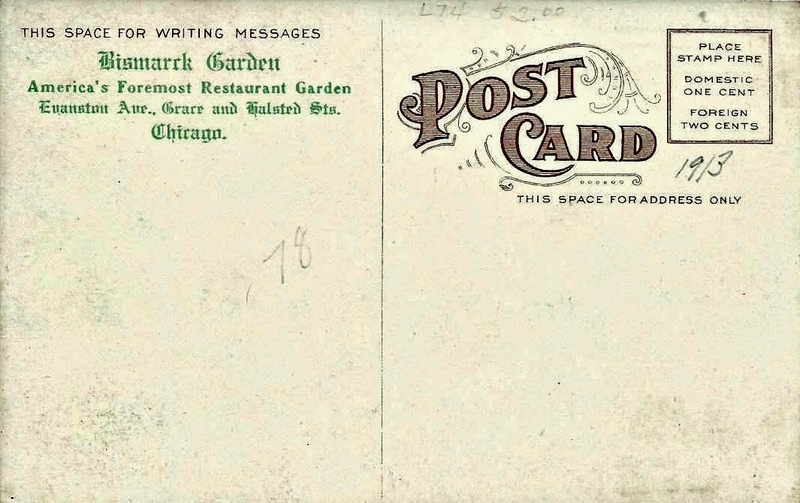 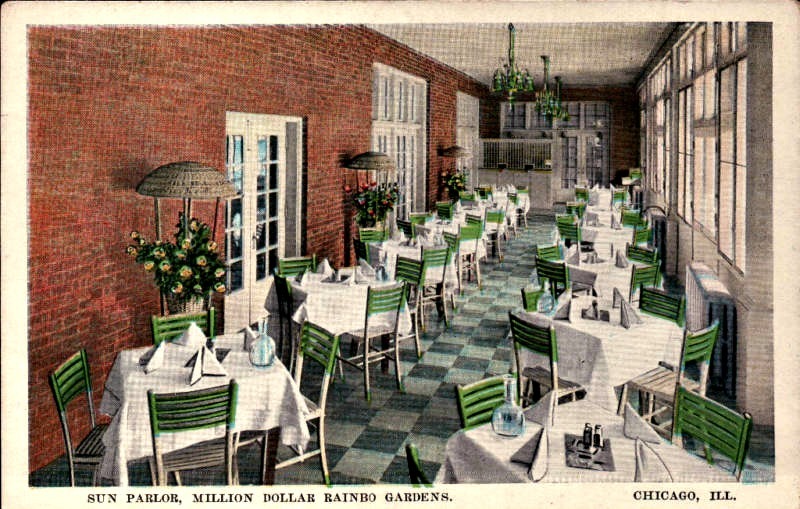 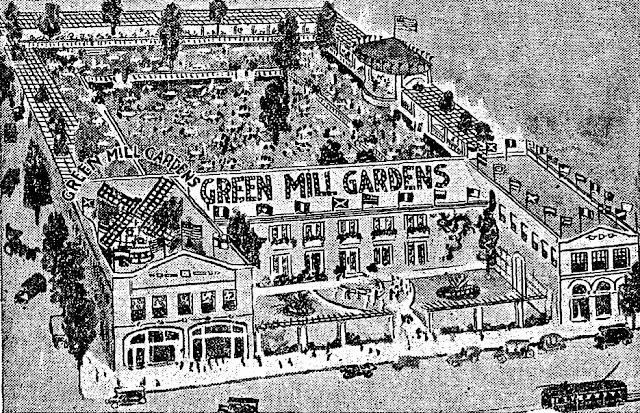 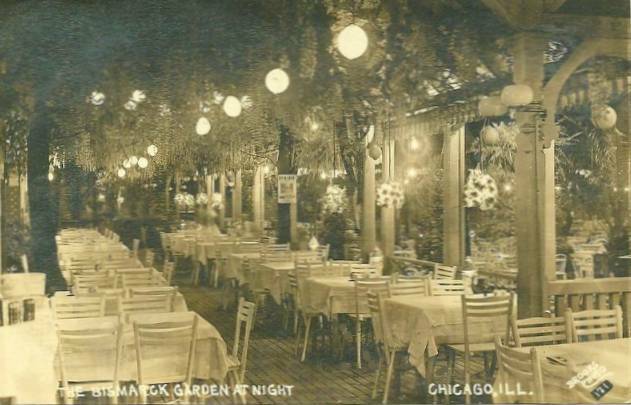 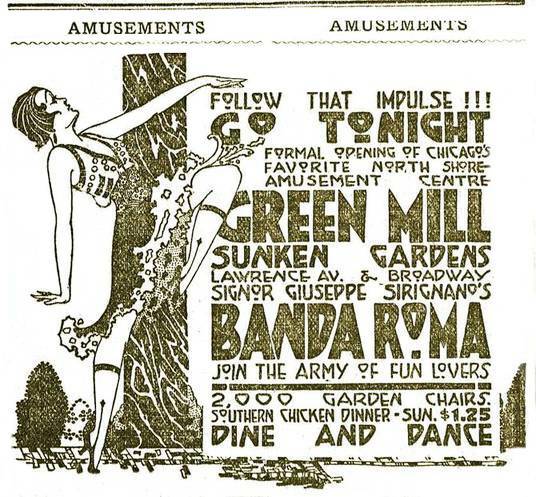 The Green Mill was once called Pop's Morse Gardens during the late 19th century within the District of Lake View according to Jazz Age Chicago. 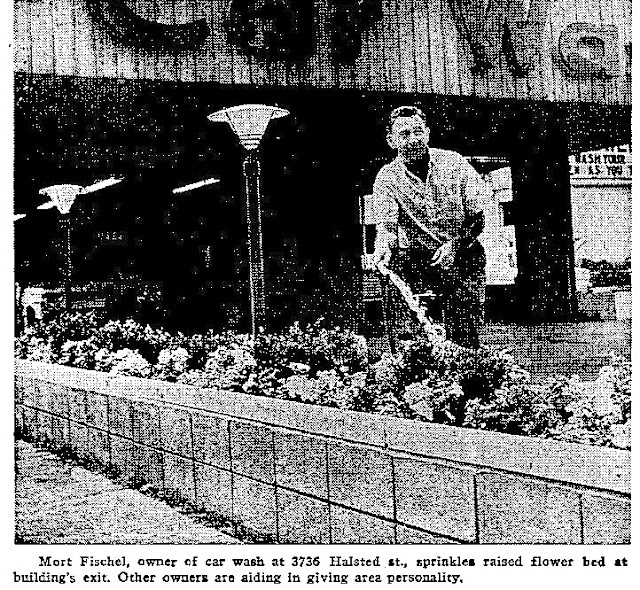 Much like the Rainbo Gardens this establishment had humble beginnings apparently has a roadhouse for tired travels. 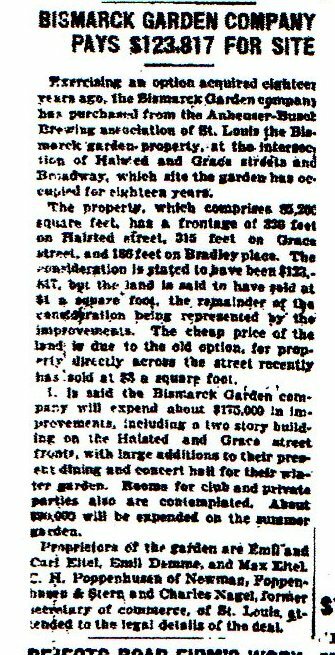 In 1946 Mr. Harms sold his property to private developers.